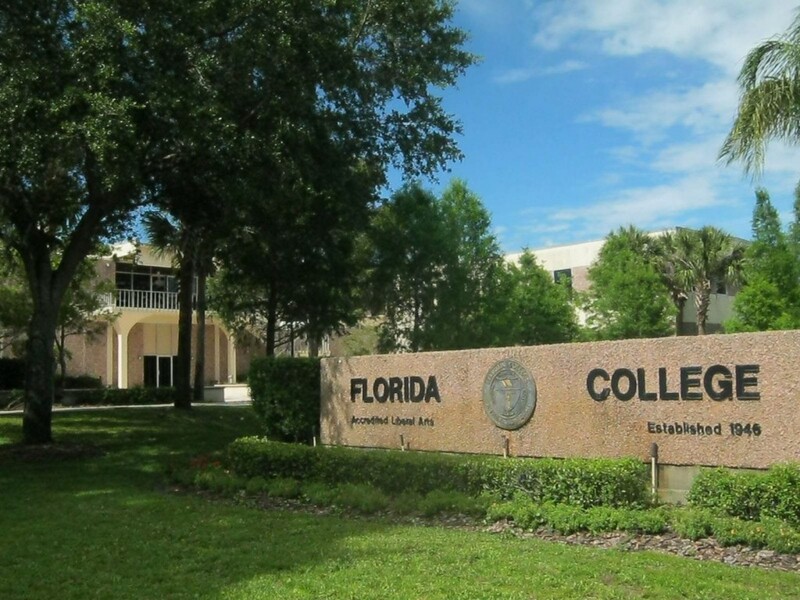 There are nearly 50 four-year colleges and universities in the state of Florida. 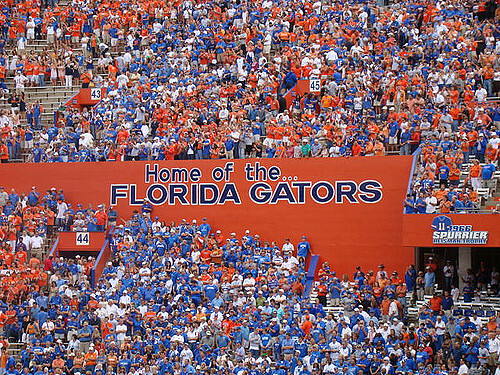 The third largest state by population, Florida has some of the largest public university campuses in the country. 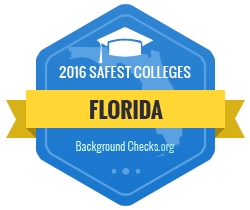 If you think you’d like to pursue higher learning in The Sunshine State, here are the 30 safest colleges in Florida. For the sake of this list, a “college” is considered any accredited public or private not-for-profit institution that offers four-year degree programs. Campus crime stats, graduation rates, and student retention rates were taken from U.S. Department of Education annual reports. Campus crime rates are based on the number of crimes per 1,000 residents. Did Your School Make the List? Click here to get the badge and display it on your website! Located in the northern panhandle city of Graceville, The Baptist College of Florida (BCF) is a private Christian College that is affiliated with the Florida Baptist Convention. The school was founded in 1943, serves over 700 enrolled students, and offers degree programs in more than fifteen different areas. BCF is the safest school in Florida. The freshman retention rate here is 83%, the graduation rate at this school is 36.8%, and the rate of crime on campus is 0. 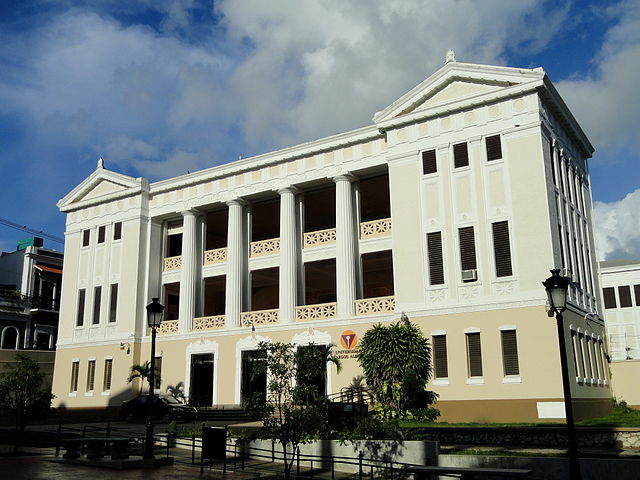 Carlos Albizu University is a private university in Miami that also has a campus in Puerto Rico. The school specializes in psychology programs but also has both education and business departments. Another safe choice in The Sunshine State, the freshman retention rate here is an impressive 100%, the graduation rate is 17.4%, and the rate of on-campus crime is 0. 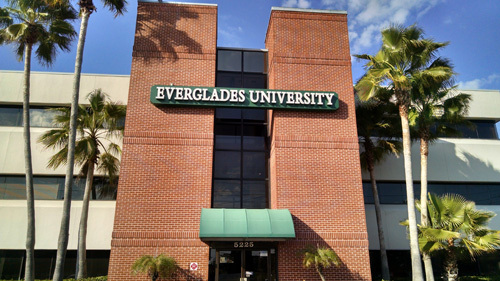 Located in Boca Raton, Everglades University is a private university that serves over 600 enrolled students. The school was founded in 1998, offers both bachelor’s and master’s degrees, and was included on U.S. News and World Report’s 2016 list of best colleges for veterans. The freshman retention rate here is 72%, the graduation rate is 62%, and the rate of crime on campus is 0. Nova Southeastern University (NSU) is a private university that is located on a 300-acre campus in Fort Lauderdale. NSU serves more than 24,100 students and offers more than 250 majors through its 18 colleges and schools. The freshman retention rate here is 71%, the rate of graduation at the school is 40.5%, and the on-campus crime rate at Nova is 0. 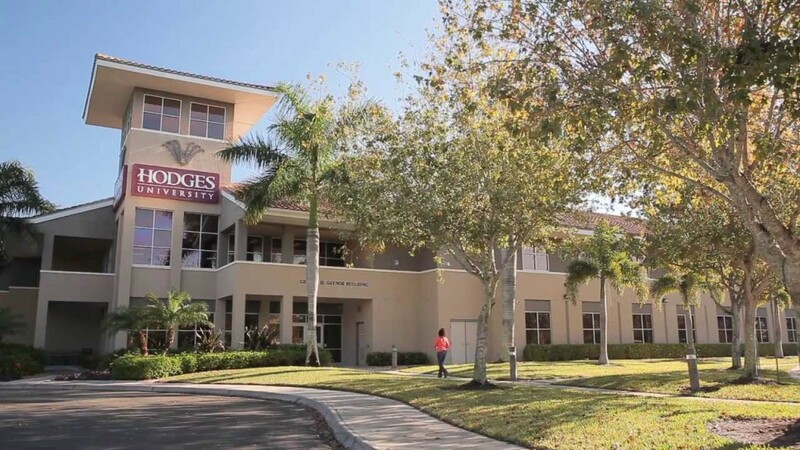 Located in Naples, Hodges University is a private university that serves more than 2,100 students. Formerly known as International College, the school has been open for over 25 years and has an average class size of just 14 students. The freshman retention rate at Hodges is 49%, the graduation rate here is 30%, and the rate of crime on campus is 0. Florida College is a small private Christian college located in the Tampa suburb of Temple Terrace. 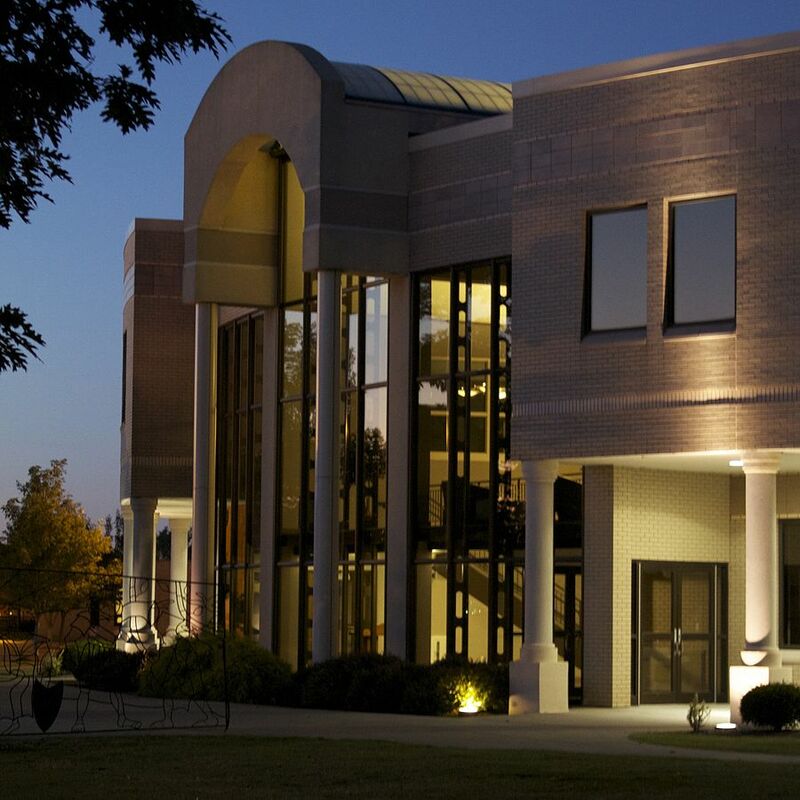 The school serves over 500 enrolled students, offers seven different bachelor’s degree programs, and is considered an important training center for ministers. The freshman retention rate at Florida College is 67%, the graduation rate here is 49.8%, and the on-campus crime rate is 0. 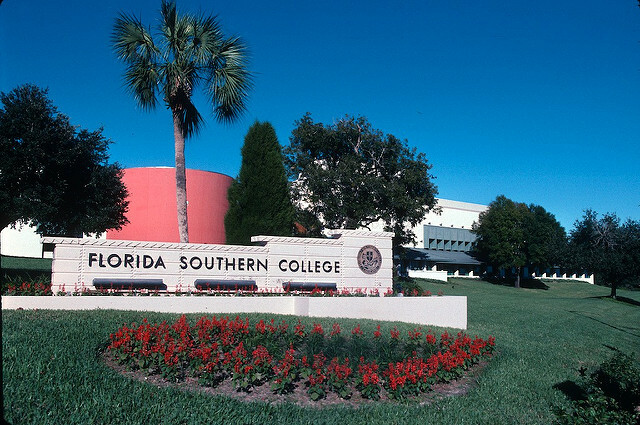 A private Christian liberal arts college, Southeastern University is located in the city of Lakeland and is affiliated with the Assemblies of God. The school was founded in 1935, serves over 4,500 students, and offers 60 different degree programs. The freshman retention rate here is 69%, the school’s graduation rate is 38.4%, and the rate of crime on campus is 0. 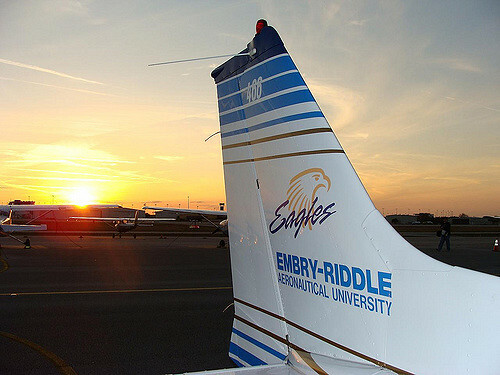 Also known as just Embry-Riddle, Embry-Riddle Aeronautical University is a private research university located in Daytona Beach. The school was founded in 1926 as a flying school, has a sister campus in Arizona, and is known for its partnerships with the aerospace industry. 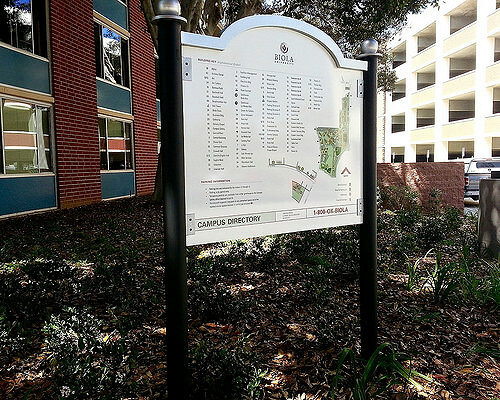 The Daytona Beach campus has an enrollment of over 5,800 students. The freshman retention rate at Embry-Riddle is 78%, the graduation rate is 56.9%, and the on-campus crime rate is 0. 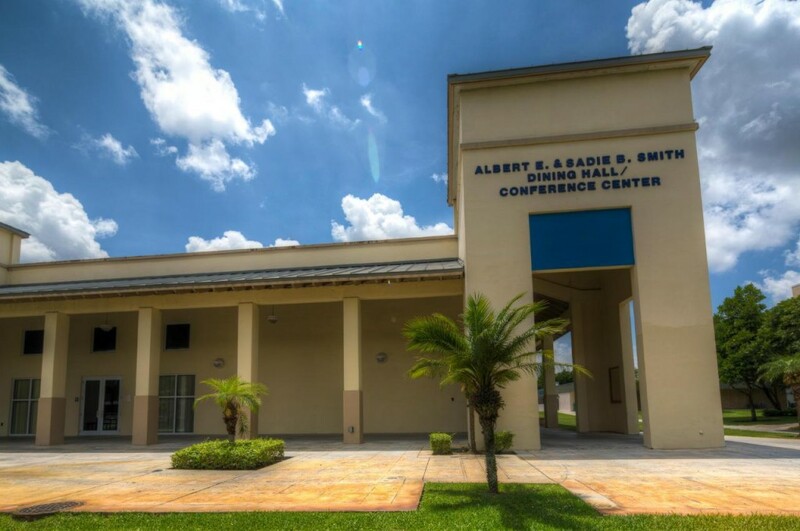 Located in Orlando, Adventist University of Health Sciences (ADU) is a private Seventh-day Adventist university that specializes in nursing and applied health programs. The school was founded in 1992, serves over 3,000 students, and offers degrees from nine different departments. The freshman retention rate at ADU is 71%, the rate of graduation here is 39.5%, and the rate of crime on campus is 0. Palm Beach Atlantic University is a private Christian non-denominational university that serves over 2,500 undergraduate students. The school was founded in 1968, is located in West Palm Beach near the Atlantic beaches, and promises students small class sizes. The freshman retention rate here is 73%, the graduation rate is 46.7%, and the on-campus crime rate is 0. 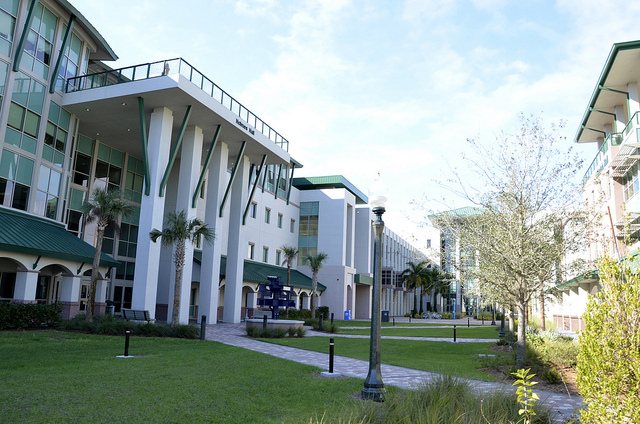 Located in the city of Fort Myers, Florida Gulf Coast University (FGCU) is a public university and the newest school in the state’s university system. Founded in 1991, the school now serves over 14,400 students and offers more than 85 degree programs through its six college and schools. The freshman retention rate here is 77%, the graduation rate at FGCU is 44.2%, and the rate of crime on campus is 0. 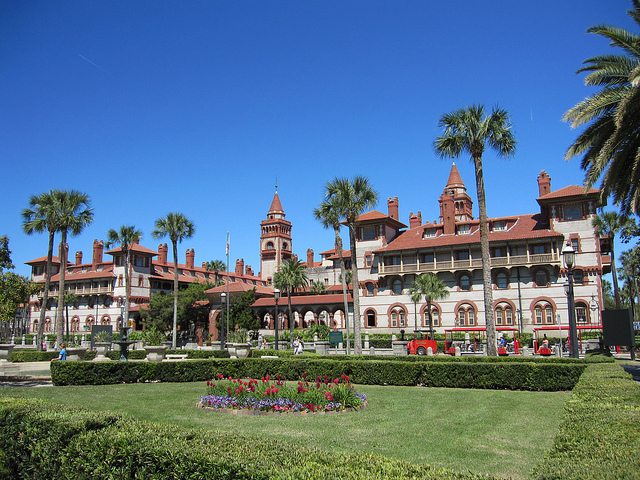 Flagler College is a private liberal arts college in the city of St. Augustine. The school was founded in 1968, serves more than 2,500 students, and offers 29 areas of study. Flagler College was included on U.S. News & World Report’s list of “Best Regional Colleges in the South.” The freshman retention rate here is 67%, the school’s graduation rate is 63.1%, and the on-campus crime rate is 0. 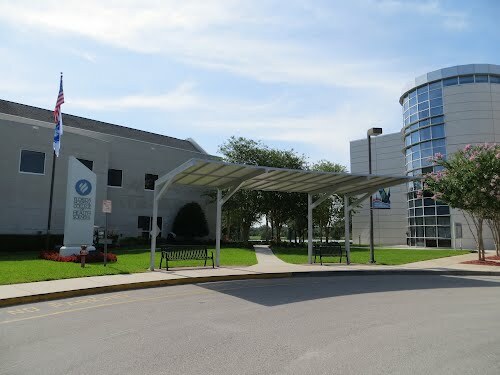 Located on a 130-acre campus in the city of Melbourne, Florida Institute of Technology (FIT) is a private research university that serves more than 6,300 students. The school was founded in 1958 and offers degree programs through its six schools that emphasize STEM areas of study as well as aviation. The freshman retention rate here is 80%, the graduation rate at FIT is 54.4%, and the rate of crime on campus is 0. 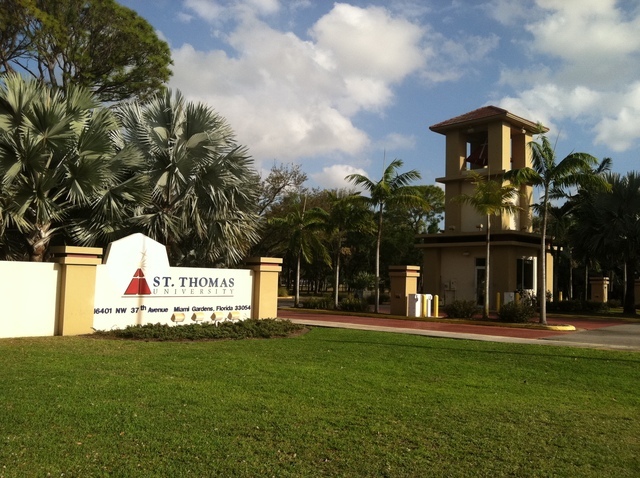 St. Thomas University (STU) is a private Roman Catholic university that is located on a 160-acre campus in Miami Gardens. The school was founded in 1961, borders a monastery, and has five distinct schools and colleges as well as a separate college of law. The freshman retention rate at STU is 62%, the school’s graduation rate is 38.3%, and the on-campus crime rate is 0. 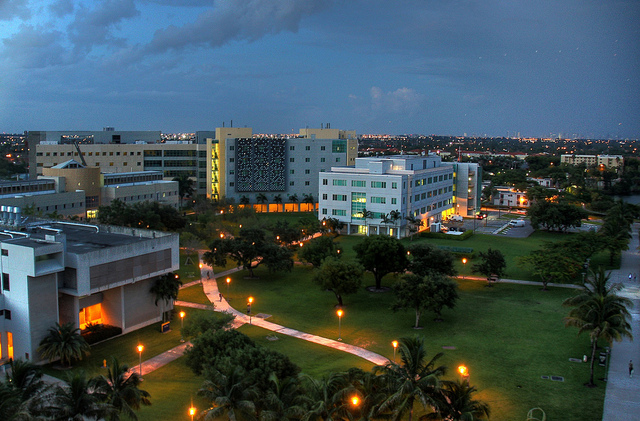 Located on a 573-acre campus in the Miami suburb of University Park, Florida International University (FIU) is a public research university that is considered a “tier one” school. The university was founded in 1965, serves over 54,000 students, and offers more than 280 majors through its 23 colleges and schools. The freshman retention rate at FIU is 84%, the graduation rate here is 51.6%, and the rate of crime on campus is 0. 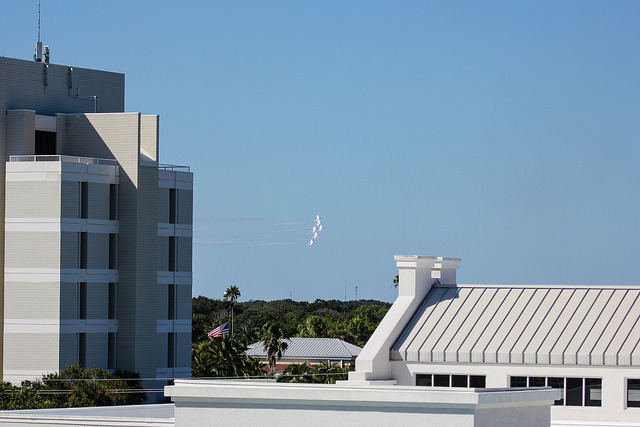 Florida Atlantic University (FAU) is a public state university located on a 805-acre campus in the city of Boca Raton. The school was founded in 1961, serves over 30,800 students, and offers more than 180 degree programs through its ten colleges. The freshman retention rate at FAU is 77%, the graduation rate here is 41.1%, and the rate of crime on campus is 0. 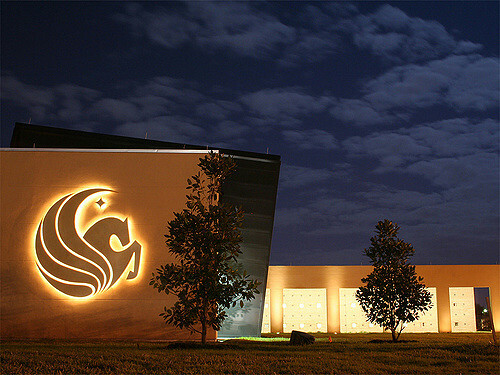 Located on a 1,878-acre campus in Orlando, the University of Central Florida (UCF) is a public state university. With more than 60,800 enrolled students, the school is the largest state university in the country by undergraduate enrollment and is ranked among the top 100 public universities by U.S. News & World Report. The freshman retention rate at UCF is 87%, the graduation rate here is 67.2%, and the on-campus crime rate is 0. 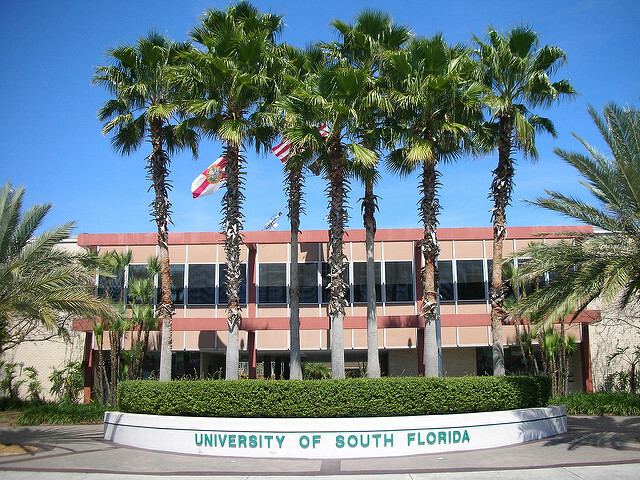 The University of South Florida (USF) is a public state university that is located on a 1,913-acre campus in Tampa serving over 48,700 students. The school was founded in 1956, is the fourth-largest public university in the state, and offers more than 200 degree programs through 14 colleges including a medical school. The freshman retention rate here is 89%, the graduation rate at USF is 63.2%, and the rate of crime on campus is 0. 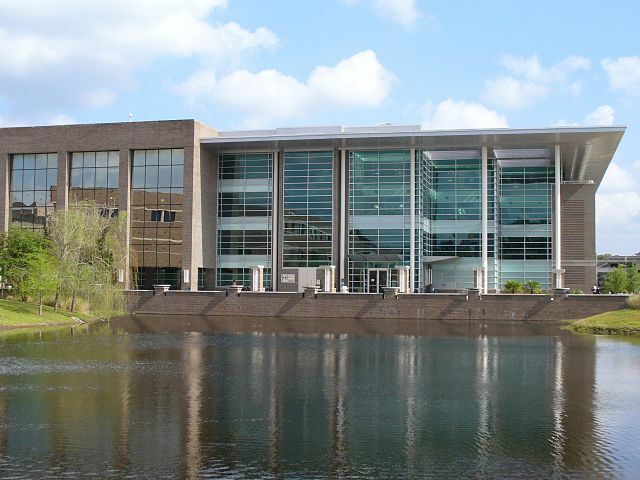 Located on a 1,300-acre campus in the city of Jacksonville, the University of North Florida (UNF) is a public state university that serves over 16,100 students. The school was founded in 1972, is surrounded by nature preserves, and offers students more than 75 degree programs through its five colleges. The freshman retention rate at UNF is 82%, the school’s graduation rate is 50%, and the on-campus crime rate is 0. Considered a senior member of the state’s university system, the University of Florida (UF) is located on a 2,000-acre campus in Gainesville. The school was founded in 1853, serves over 49,000 students, and is home to sixteen colleges and more than 150 research centers and institutes. The freshman retention rate at UF is 96%, the graduation rate here is 86.5%, and the rate of crime on campus is 0. 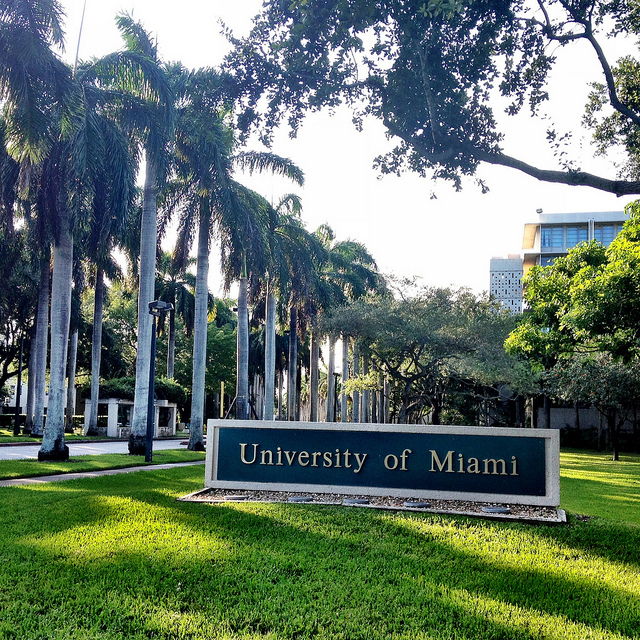 A private research university in the Coral Gables area of Miami, the University of Miami (UM) serves over 16,700 students. The school was founded in 1925, offer more than 200 degree programs, and has 12 separate colleges including a law school. The freshman retention rate here is 91%, UM’s graduation rate is 81.7%, and the on-campus crime rate here is 0. 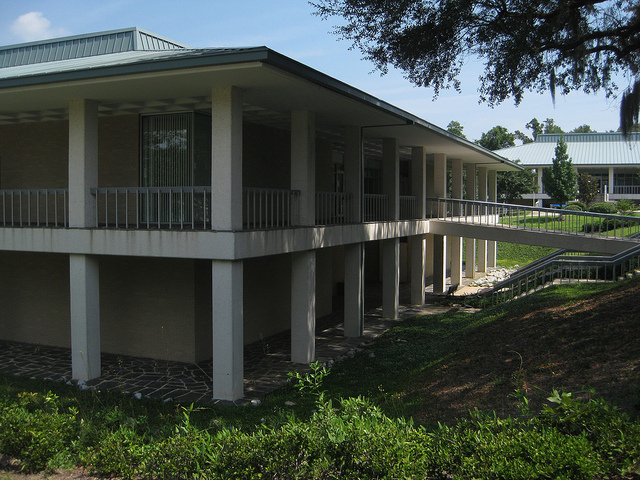 Located on a 110-acre campus in Lakeland, Florida Southern College (FSC) is a private college that serves over 2,800 students. The school was founded in 1883, is affiliated with the United Methodist Church, and offers more than 50 degree programs. FSC also holds the world’s largest single-site collection of Frank Lloyd Wright architecture. The freshman retention rate here is 78%, the graduation rate is 58.2%, and the rate of crime on campus is 0. 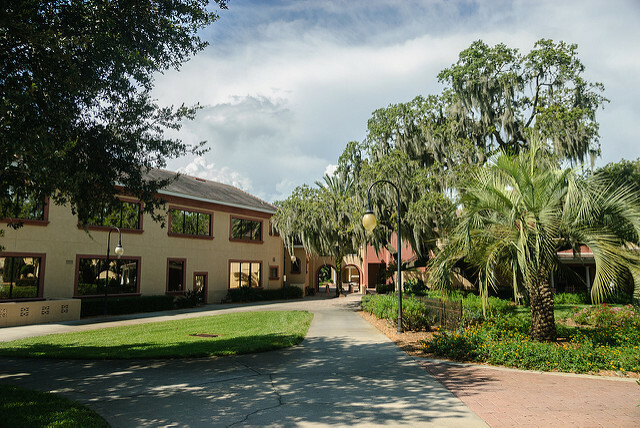 Stetson University is a private university located on a 175-acre campus in Deland. The school was founded in 1883, serves over 4,300 students, and was included on U.S. News & World Report’s list of best regional universities in the South. There is also a separate law school in the city of Gulfport. The freshman retention rate at Stetson is 78%, the school’s graduation rate is 64.1%, and the rate of crime on campus is 0. 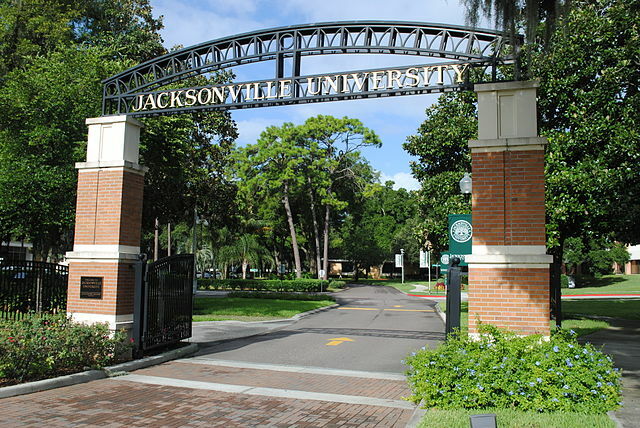 Located on a 240-acre campus in Jacksonville, Jacksonville University (JU) is a private, nonsectarian university that serves over 3,700 enrolled students. The school was founded in 1934, offers more than 70 degree programs, and is known for its professional flight training school. The freshman retention rate at JU is 72%, the graduation rate here is 38.2%, and the on-campus crime rate is 0. The University of West Florida (UWF) is a public state university that is located on a 1,600-acre campus in the panhandle city of Pensacola. The school was established in 1963, serves over 12,700 students, and offers a variety of undergraduate and graduate degrees through its three colleges. The freshman retention rate at UWF is 70%, the school’s graduation rate is 42.3%, and the rate of crime on campus is 0. 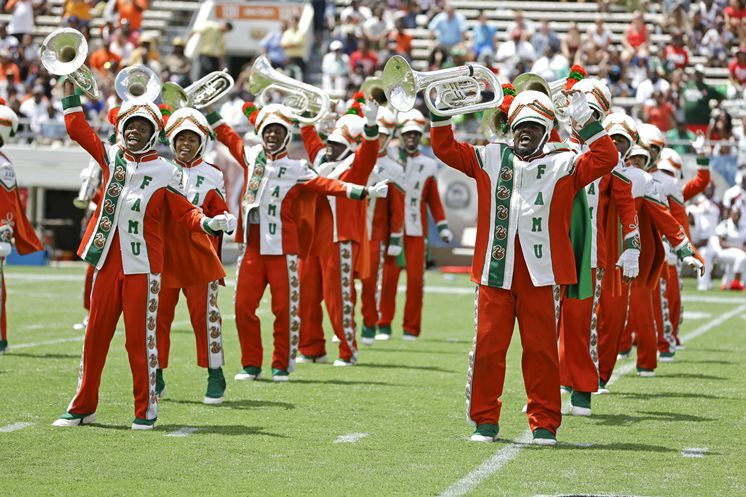 Located in Tallahassee, Florida A&M University (FAMU) is a public historically black university that serves over 9,900 enrolled students. The school was founded in 1887, is one of the largest historically black colleges in the country, and offers more than 100 degree programs through its 13 colleges and schools. FAMU’s freshman retention rate is 82%, the graduation rate here is 40.9%, and the rate of crime on campus is 0. 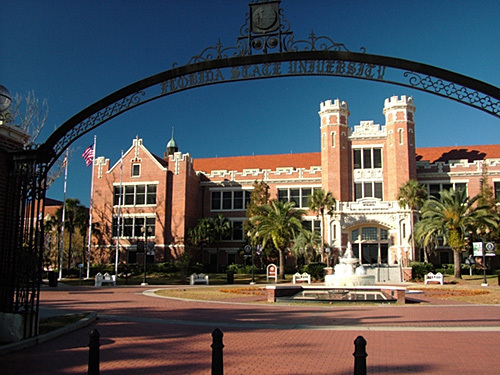 Also located in Tallahassee, Florida State University (FSU) is a senior member of the state university system that serves over 41,700 students. The school was founded in 1851, has a 1,391-acre campus, and offers students the choice of more than 360 programs of study through its 16 different colleges. The freshman retention rate at FSU is 92%, the school’s graduation rate is 76.9%, and the on-campus crime rate is 0. 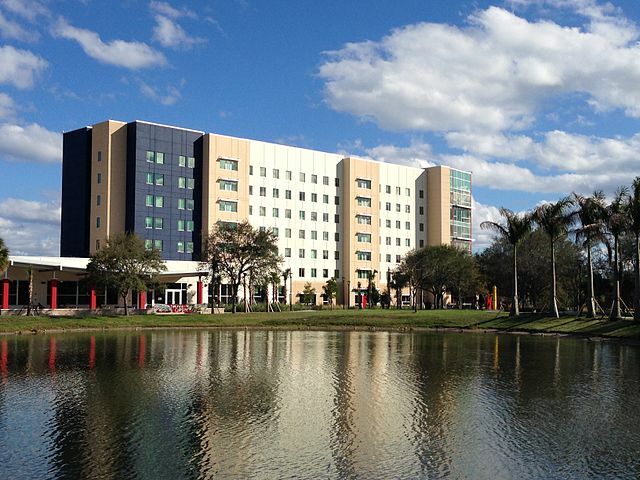 A private Baptist university in the Miami suburb of Miami Gardens, Florida Memorial University serves over 1,800 students. The school was founded in 1879, is affiliated with both the American Baptist Churches USA and the National Baptist Convention, and offers students more than 40 degree programs. The freshman retention rate at this school is 69%, the graduation rate here is 39.6%, and the rate of crime on campus is 0. 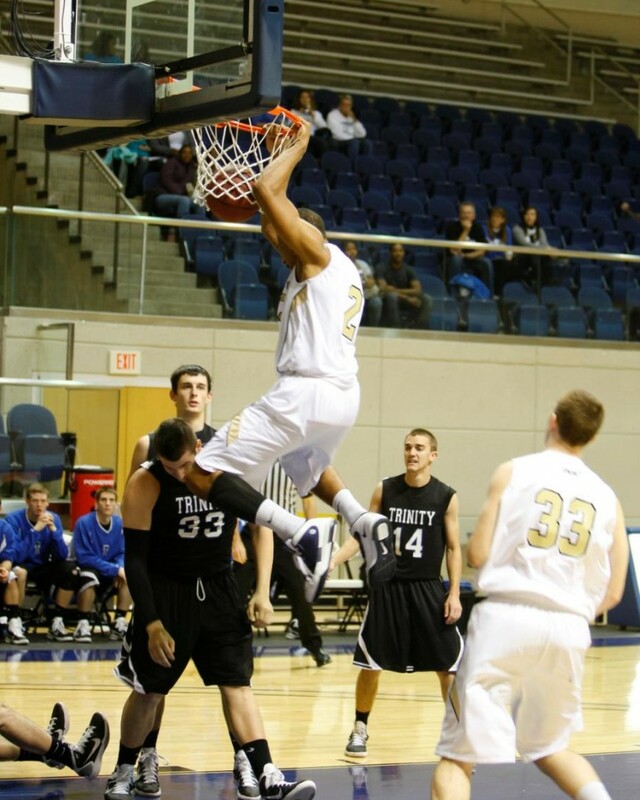 Trinity Baptist College (TBC) is a private college located in the city of Jacksonville. The school was established in 1974, is affiliated with the Independent Baptist churches, and serves over 300 enrolled students. The freshman retention rate at TBC is 47%, the graduation rate here is 38.9%, and the rate of crime on campus is 0. 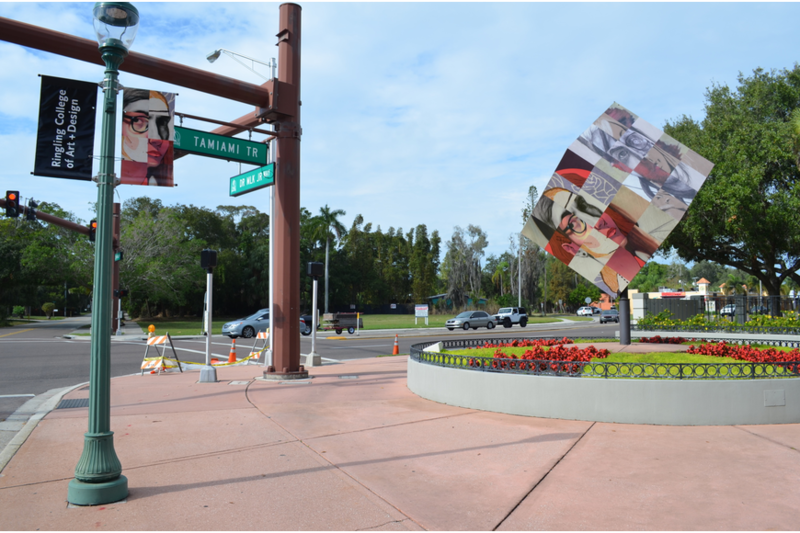 Located in the city of Sarasota, the Ringling College of Art and Design is a private college that serves more than 1,400 students. Originally founded as an art school in 1931, the school now offers degrees in such areas as game art, computer animation, illustration, painting, and graphic design. The freshman retention rate here is 78%, the graduation rate is 65%, and the on-campus crime rate is 1. There are well over 200 four-year colleges and universities in the state of New York, more than any other U.S. state. The state university system alone is the most extensive in the country. If you or a loved one would like to pursue higher learning in The Empire State, here are the 50 safest colleges in New York. Located in the city of Rochester, Roberts Wesleyan College is a private liberal arts college that was the first school in the country established by the Free Methodist Church. The school was founded in 1866, serves over 1,700 students, and offers several areas of study including a separate graduate seminary school. 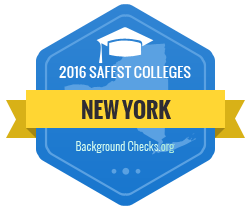 This is the safest college in New York, with a freshman retention rate of 86%, a graduation rate of 60.6%, and an on-campus crime rate of 0. 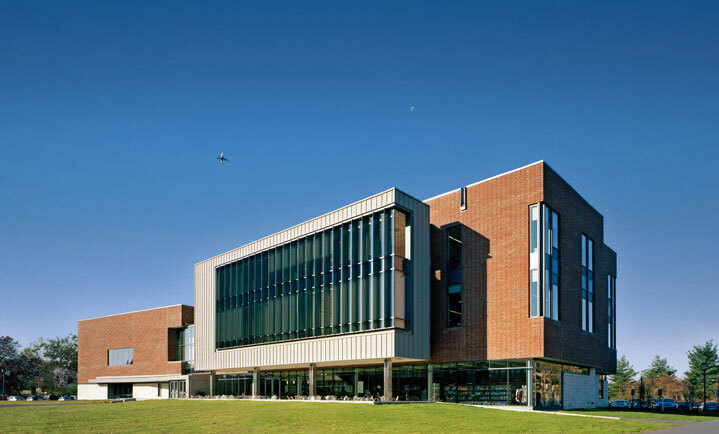 A private research university, the New York Institute of Technology is located on a 1,050-acre campus in the Long Island city of Old Westbury. The school was founded in 1910, serves more than 9,400 students, and offers more than 100 degree programs through its seven schools and colleges. Another safe choice, the freshman retention rate here is 72%, the rate of graduation is 47.1%, and the on-campus crime rate is 0. 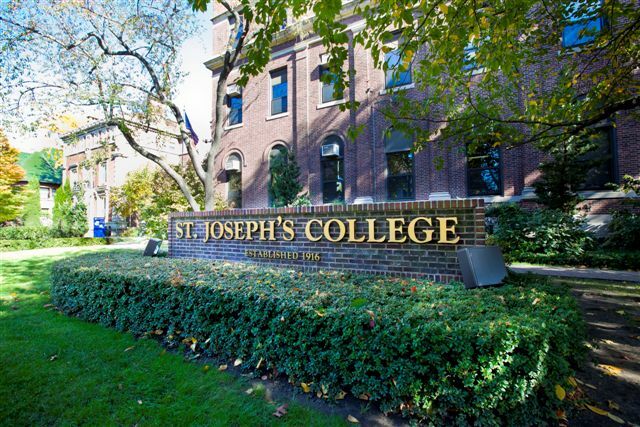 Located in the Clinton Hill section of Brooklyn, St. Joseph’s College is a private liberal arts college that serves just over 1,200 students. The school was founded in 1916, offers more than 25 majors, and also has a separate campus on Long Island. The freshman retention rate at St. Joseph’s College is 84%, the graduation rate here is 71.6%, and the rate of crime on campus is 0. A private Catholic college in the Long Island town of Rockville Center, Molloy College serves more than 4,600 enrolled students. The school was founded in 1955, is affiliated with the Roman Catholic church, and offers more than 50 degree programs and the undergraduate and graduate level. The school retains freshmen at a rate of 89%, has a graduation rate of 66.2%, and has an on-campus crime rate of 0. 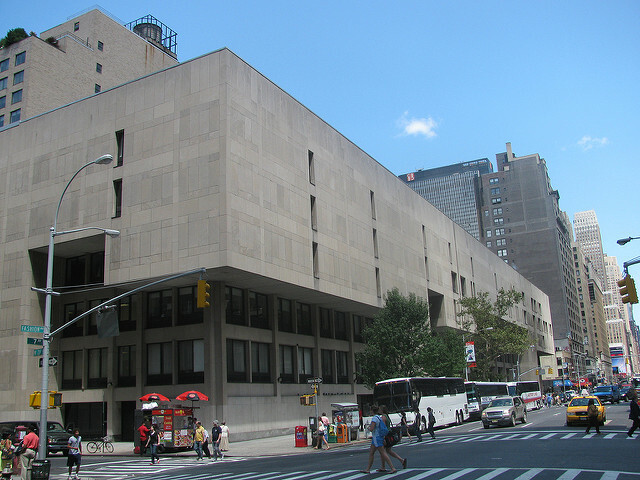 Located in the Midtown Manhattan area of New York City, the John Jay College of Criminal Justice (John Jay) is part of the City University of New York (CUNY) system. This public university was founded in 1964, serves more than 15,000 students, and is well-known for its criminal justice, forensics, and public affairs programs. The freshman retention rate at John Jay is 78%, the graduation rate here is 33.5%, and the rate of crime on campus is 0. A public college in the City University of New York (CUNY) system, Brooklyn College serves over 16,400 enrolled students. The school was founded in 1930 and is known for both its picturesque 26-acre campus and for the value of quality education that it provides. The freshman retention rate at Brooklyn College is 86%, the school’s graduation rate is 51%, and the on-campus crime rate is 0. 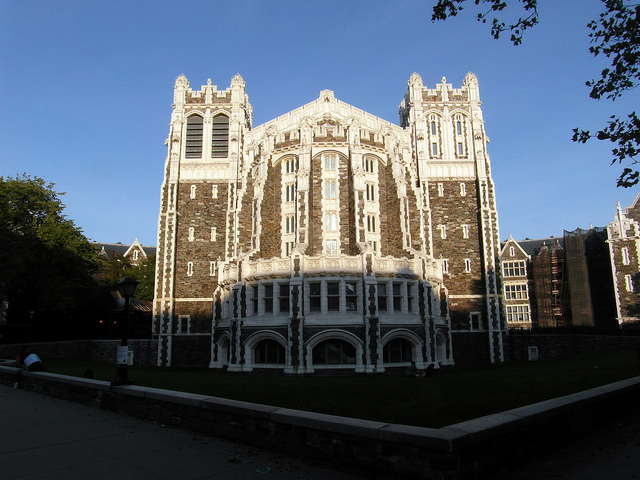 Another CUNY school, Lehman College is a public university that is located in the Bronx section of New York City. The school was founded in 1967, serves more than 12,000 students, and offers over 90 areas of study at the undergraduate and graduate level. The freshman retention rate here is 81%, the graduation rate is 37%, and the rate of crime on campus is 0. 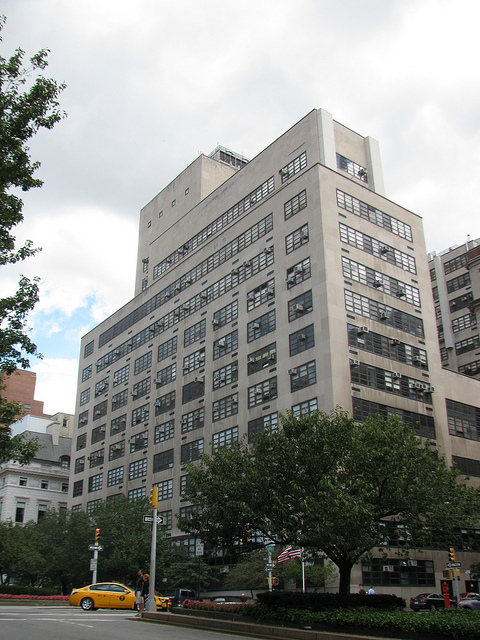 Located in the Chelsea neighborhood of Manhattan, the Fashion Institute of New York (FIT) is a public university in the State University of New York (SUNY) system. The school was founded in 1944, serves more than 9,700 students, and is ranked among the top five fashion schools in the world. The freshman retention rate at FIT is 88%, the school’s graduation rate is 70.2%, and the rate of on-campus crime is 0. Another State University of New York (SUNY) school, the SUNY Polytechnic Institute is a public research university that is located in the city of Brooklyn. The school was founded in 1966, serves more than 2,900 students, and offers over 40 different degree programs through its five colleges. The freshman retention rate at SUNY Poly is 88%, the graduation rate here is 57.1%, and the rate of crime on campus is 0. 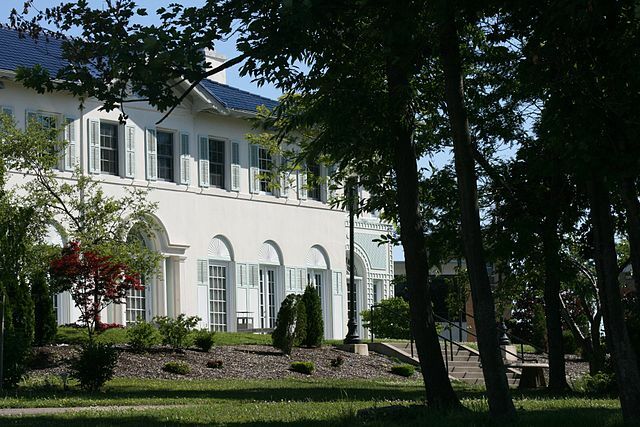 Located in the Broome County village of Johnson City, Davis College is a small private bible college that serves just over 300 enrolled students. The school was founded in 1900 and offers both biblical and education degrees to undergraduates. The freshman retention rate at Davis College is 87%, the graduation rate here is 42.1%, and the on-campus crime rate is 0. A private Franciscan college located in the Buffalo suburb of Hamburg, Hilbert College serves just over 1,000 enrolled students. The school was founded in 1957, is considered a liberal arts college, and has a student-faculty ratio of just 13:1. The freshman retention rate here is 75%, the graduation rate at Hilbert College is 41.1%, and the rate of crime on campus is 0. 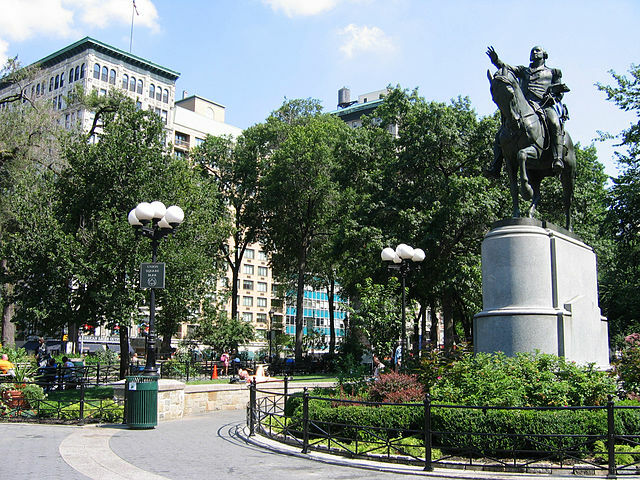 Located in the Gramercy Park area of Manhattan, Baruch College is a public college that is a part of the City University of New York (CUNY) system. The school was founded in 1968, serves more than 17,000 students, and offers more than 50 different degree programs through its three schools. The freshman retention rate at Baruch College is 88%, the school’s graduation rate is 66.9%, and the on-campus crime rate is 0. 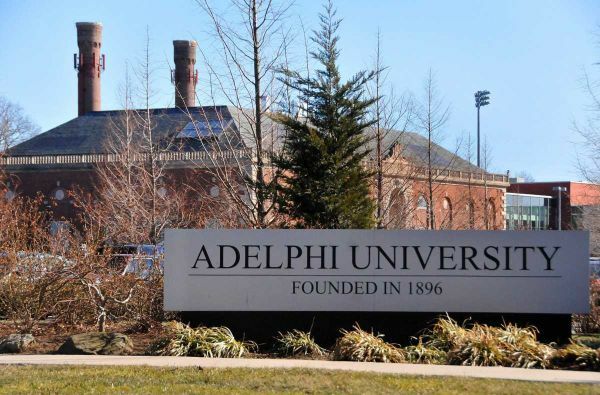 A private, nonsectarian university, Adelphi University is located on a 75-acre campus in the Long Island village of Garden City. The school was founded in 1896, serves more than 7,800 students, and is known as the oldest higher learning institution on Long Island. The freshman retention rate at Adelphi is 81%, the rate of graduation here is 62.5%, and the rate of crime on campus is 0. 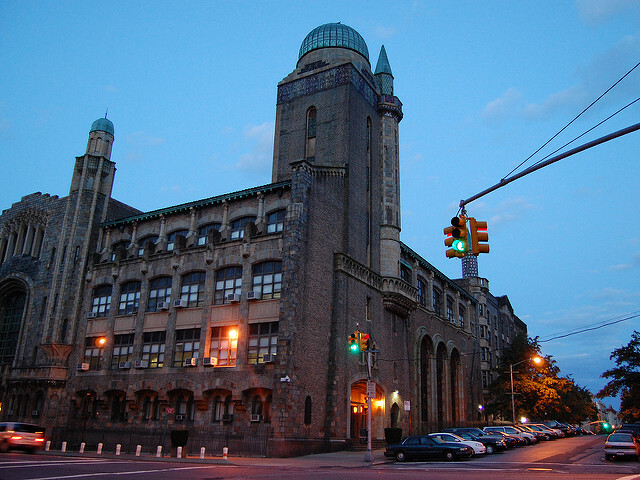 Located in New York City, Yeshiva University is a private research university that is affiliated with Modern Orthodox Judaism. The school was founded in 1886, serves more than 6,400 enrolled students, and offers a variety of degree programs including a college of medicine and a college of law. The freshman retention rate here is 93%, the school’s graduation rate is 85.2%, and the on-campus crime rate is 0. 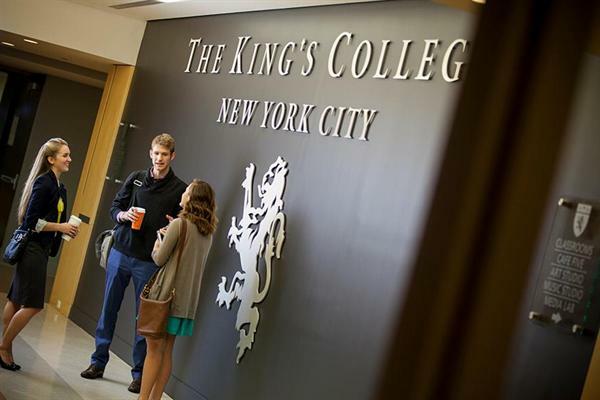 The King’s College (TKC) is a private Christian liberal arts college that is located in the financial district area of Manhattan. The school was founded in 1938, serves just 500 students, and is best-known as a conservative business, economics, and politics educational institution. The freshman retention rate here is 60%, the graduation rate at The King’s College is 61.4%, and the rate of crime on campus is 0. 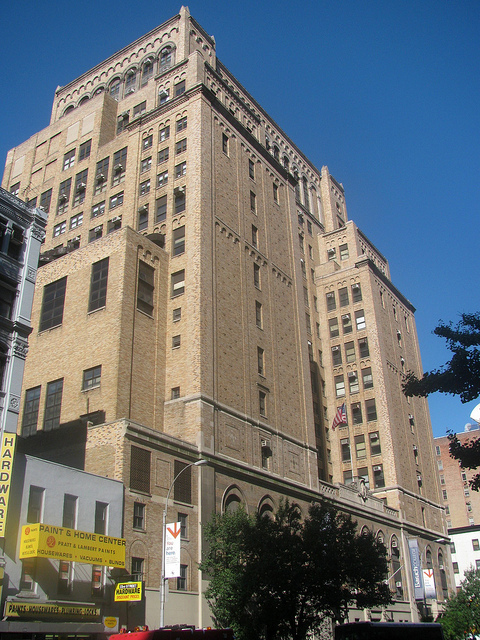 Located in the Lenox Hill section of Manhattan’s Upper East Side, Hunter College is a public university that is part of the City University of New York (CUNY) system. The school was founded in 1870, serves over 15,500 students, and offers more than 150 degree programs at the undergraduate and graduate level. The freshman retention rate here is 87%, the school’s graduation rate is 50.4%, and the on-campus crime rate is 0. 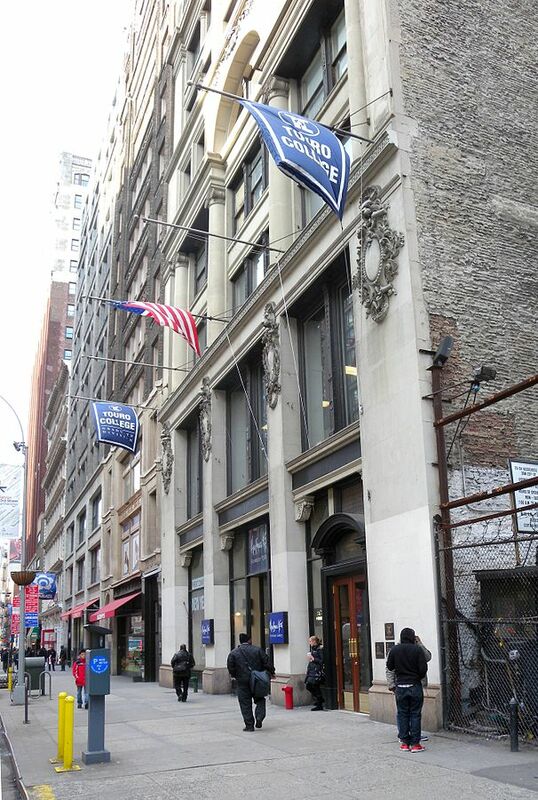 Touro College is a private, primarily Jewish, college that is located in New York City. The school was founded in 1970, serves more than 18,000 students, and offers a variety of degree programs including a separate medical school. Touro’s freshman retention rate is 46%, the graduation rate here is 34.6%, and the rate of crime on campus is 0. 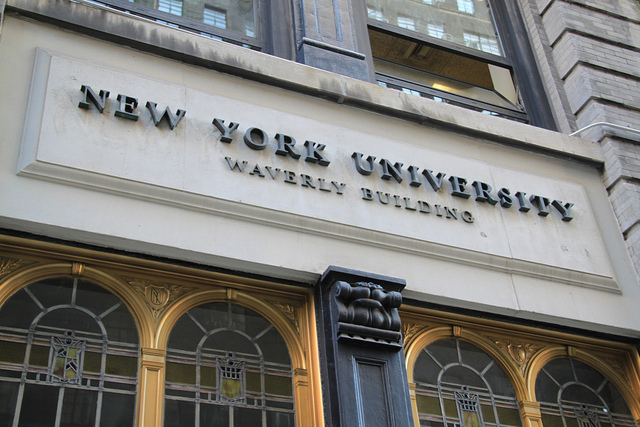 Located on a 230-acre urban campus in Manhattan, New York University (NYU) is a private research university that serves more than 57,200 enrolled students. The school was founded in 1831, is one of the largest private universities in the country, and was named by U.S. News & World Report as one of the top 34 universities in the world. NYU’s freshman retention rate is 92%, it’s graduation rate is 83.3%, the school’s on-campus crime rate is 0. 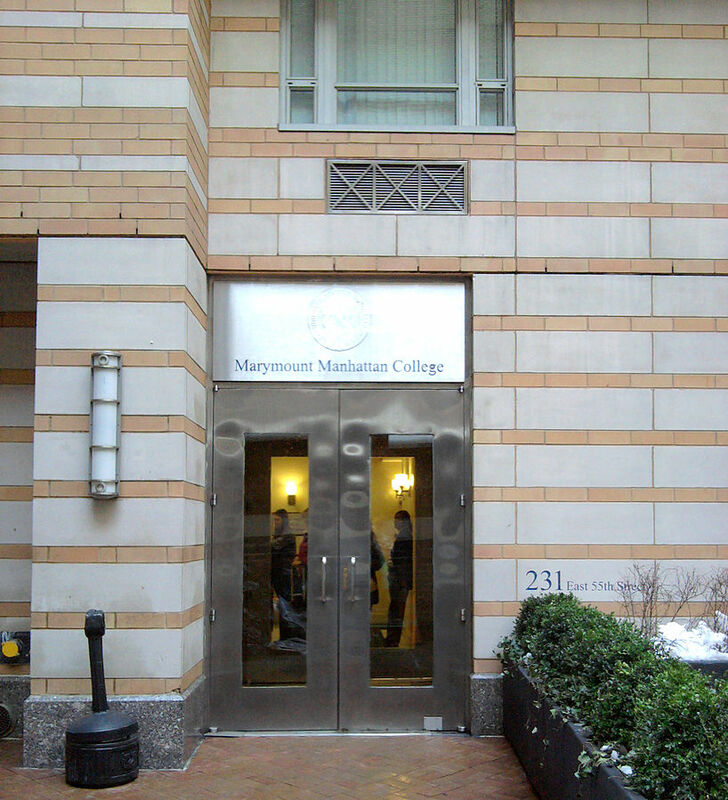 Marymount Manhattan College is a private college located in the Upper East Side of Manhattan. The school was founded in 1936 as a Catholic college, but no longer has a religious affiliation. The school serves over 1,600 students and is known for producing top stage actors. The freshman retention rate here is 66%, the school’s graduation rate is 44.3%, and the rate of crime on campus is 0. Located on Staten Island, the College of Staten Island is a part of the City University of New York (CUNY) system. 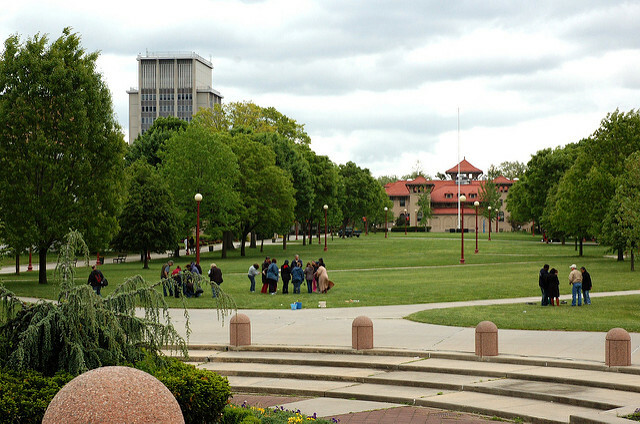 The public university was founded in 1956, serves over 13,700 students, and offers a variety of liberal arts and sciences degrees. The freshman retention rate at this school is 83%, the graduation rate here is 29.1%, and the on-campus crime rate is 0. 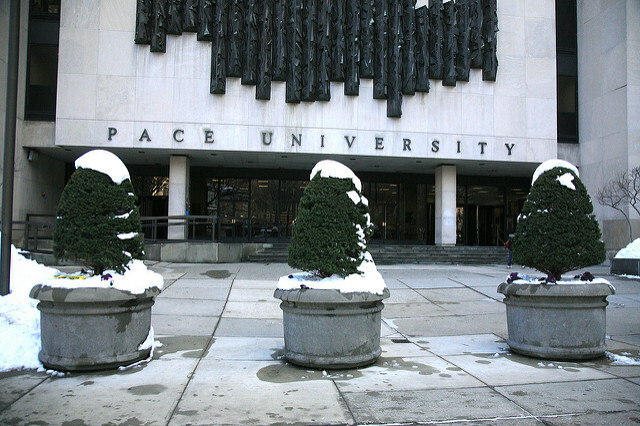 A private university in New York City, Pace University serves over 12,700 enrolled students. The school was founded in 1906, has nine different schools and colleges, and is home to the television show “Inside the Actors Studio” hosted by James Lipton. The freshman retention rate at Pace is 76%, the graduation rate here is 51.5%, and the rate of crime on campus is 0. Located in Queens, New York, Queens College is a public university that is a part of the City University of New York (CUNY) system. The school was founded in 1937, serves over 18,400 students, and offers more than 90 different degree programs. The school’s freshman retention rate is 84%, the graduation rate at Queens College is 56.4%, and the on-campus crime rate is 0. Empire State College is a public liberal arts college that is a part of the State University of New York (SUNY) system. 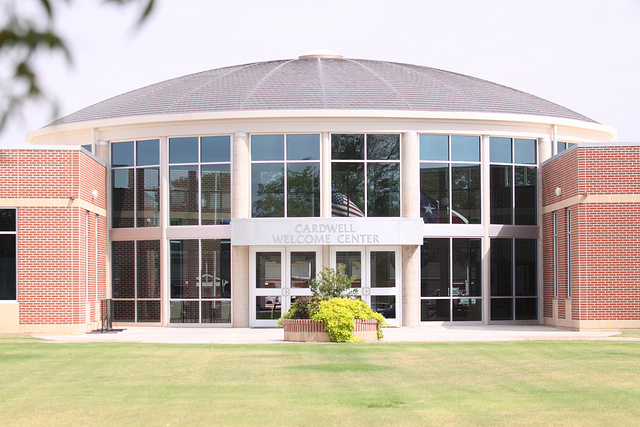 The school was founded in 1971, services more than 18,600 students, and offers a wide variety of degree programs at both the undergraduate and graduate level. The freshman retention rate at Empire State is 49%, the graduation rate here is 24.5%, and the rate of crime on campus is 0. Located on an 11-acre urban campus in Brooklyn, Long Island University (LIU) is a private, nonsectarian university. The school was founded in 1926, offers more than 250 academic programs, and has a 12:1 student to faculty ratio. The freshman retention rate here is 59%, the graduation rate at this school is 30.2%, and the on-campus crime rate is 0. 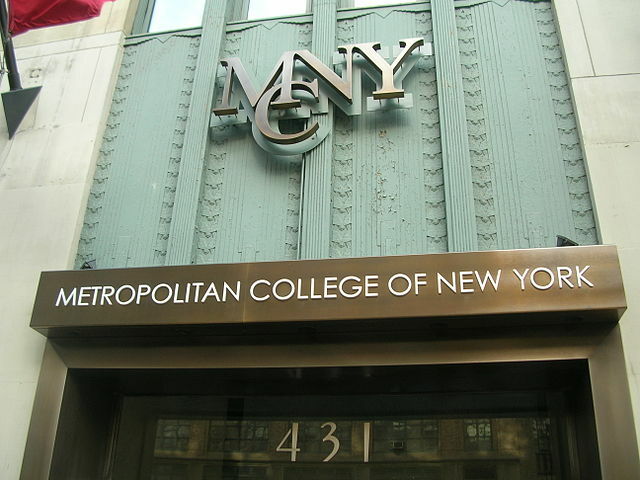 Metropolitan College of New York is a private college located in Manhattan’s Hudson Square. The school was established in 1964, serves over 1,200 students, and consists of three schools that offer various degree programs. The freshman retention rate here is 52%, the graduation rate is 24.4%, and the rate of crime on campus is 0. York College is a public university located in Queens that is a part of the City University of New York (CUNY) system. The school was founded in 1966, sits on a 50-acre urban campus, and serves more than 8,000 enrolled students. The freshman enrollment rate at York College is 74%, the graduation rate here is 26.4%, and the on-campus crime rate is 0. 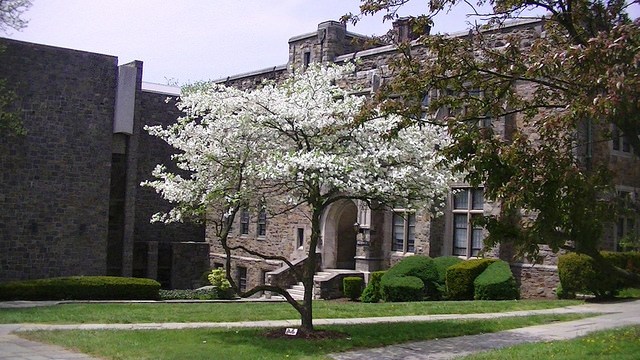 Located in the city of Dobbs Ferry, Mercy College is a private liberal arts college that serves over 8,000 enrolled students. The school was founded in 1950, offers more than 40 areas of study, and has a 20:1 student-faculty ratio. The freshman retention rate here is 70%, the school’s graduation rate is 33.3%, and the rate of crime on campus is 0. 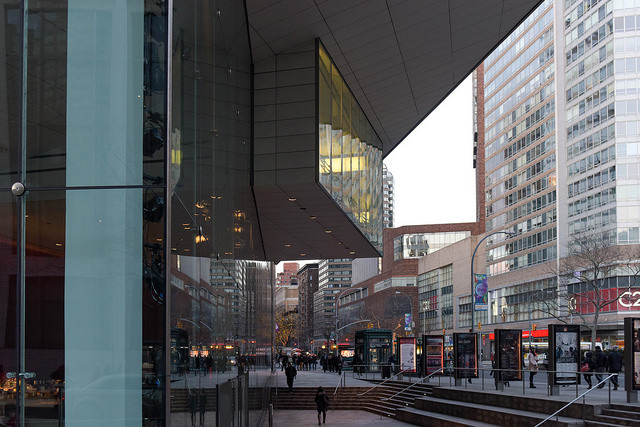 The Julliard School is a private performing arts college that serves just 850 enrolled students. 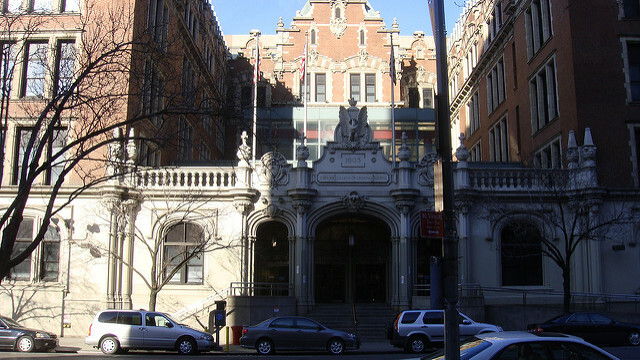 Located on Manhattan’s Upper West Side, the school was founded in 1905 and is known as one of the world’s leading music schools. The freshman retention rate at Julliard is 94%, the graduation rate here is 87.7%, and the on-campus crime rate is 0. 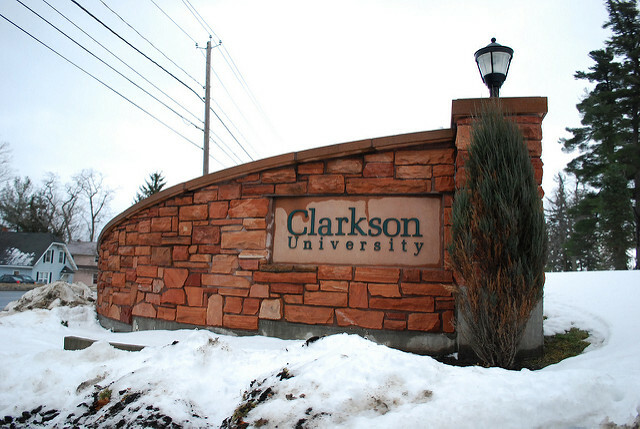 Located in the upstate village of Potsdam in St. Lawrence County, Clarkson University is a private research university that serves over 4,300 students. The school was established in 1896, has a 640-acre campus, and offer more than 50 different areas of study. The freshman retention rate here is 87%, Clarkson’s graduation rate is 72.9%, and the rate of crime on campus is 0. Columbia University is a private, Ivy League, research university that is located in Upper Manhattan that serves over 27,900 students. The school was founded in 1754, is the oldest college in the state, and has 17 colleges and schools including the oldest medical school in the country. 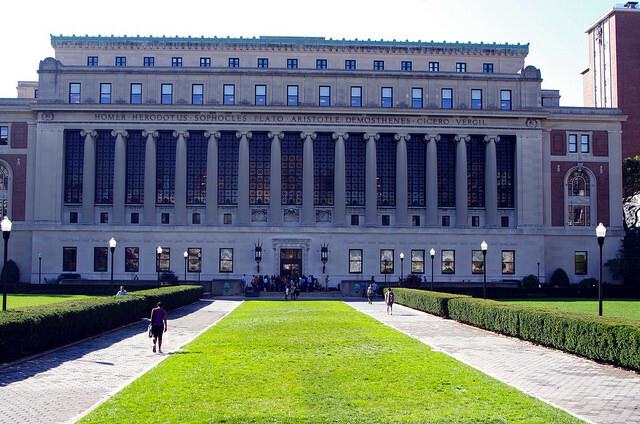 The freshman retention rate at Columbia is 97%, the graduation rate here is 93.3%, and the rate of on-campus crime is 0. Located in the Morningside Heights neighborhood of Manhattan, Barnard College is a private women’s liberal arts college that is affiliated with Columbia University. The school was founded in 1889, serves over 2,300 students, and is known as one of the most selective women’s colleges in the country. 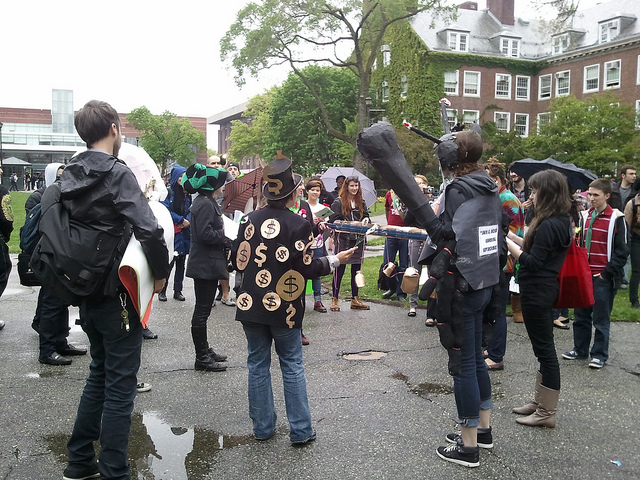 The freshman retention rate at Barnard is 98%, the graduation rate here is 89.7%, and the rate of crime on campus is 0. 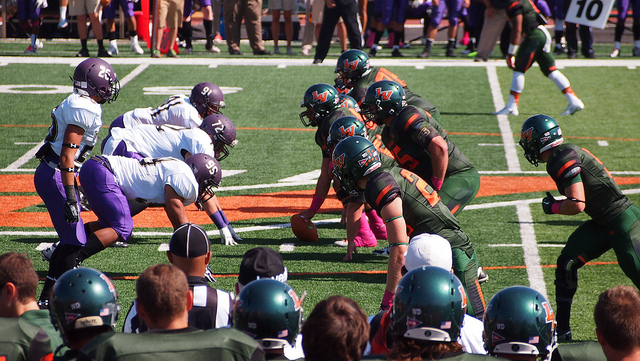 Nazareth College is a private, non-denominational college located in the Rochester suburb of Pittsford. The school was founded in 1924, serves over 2,800 students, and offers more than 80 different degree programs at the graduate and undergraduate level. The freshman retention rate at this school is 79%, the graduation rate here is 68%, and the on-campus crime rate is 0. Located on a 20-acre suburban campus in the city of New Rochelle, The College of New Rochelle is a private Catholic college that serves more than 4,000 students. The school was founded in 1904 and is now composed of four separate schools. The freshman retention rate here is 62%, the school’s graduation rate is 26.3%, and the rate of crime on campus is 0. 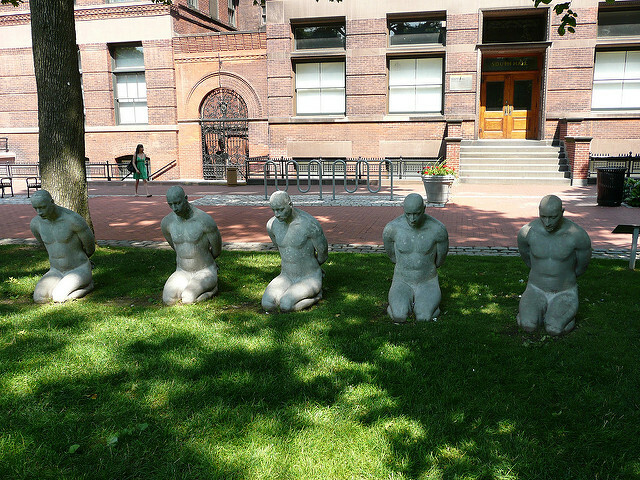 The New School is a private research university that is located in the Greenwich Village section of New York City. The school was founded in 1919, serves more than 10,000 enrolled students, and is known for its open intellectual environment. The freshman retention rate at The New School is 83%, the graduation rate here is 63.4%, the school’s on-campus crime rate is 0. 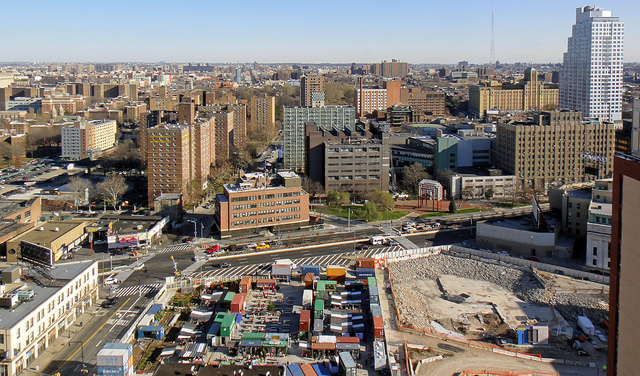 Located in the Hamilton Heights area of Manhattan, the City College of New York (CCNY) is a public university that is a part of the City University of New York (CUNY) system. The school was founded in 1847, serves more than 16,100 students, and offers many areas of study with a well-known physics program. The freshman retention rate at CCNY is 87%, the graduation rate here is 42%, and the rate of crime on campus is 0. 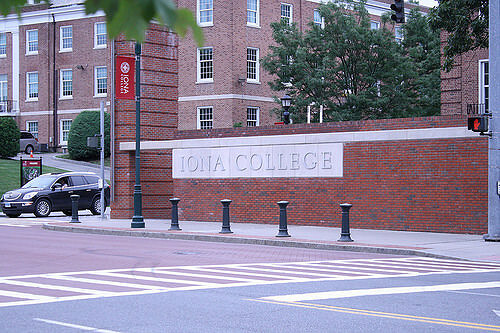 Iona College is a private college that is affiliated with the Roman Catholic Church, Congregation of Christian Brothers. The school was founded in 1940, serves more than 3,900 students, and sits on a 45-acre suburban campus in New Rochelle, just 20 miles north of Midtown Manhattan. The freshman retention rate at Iona is 83%, the school’s graduation rate is 62.6%, and the on-campus crime rate is 0. 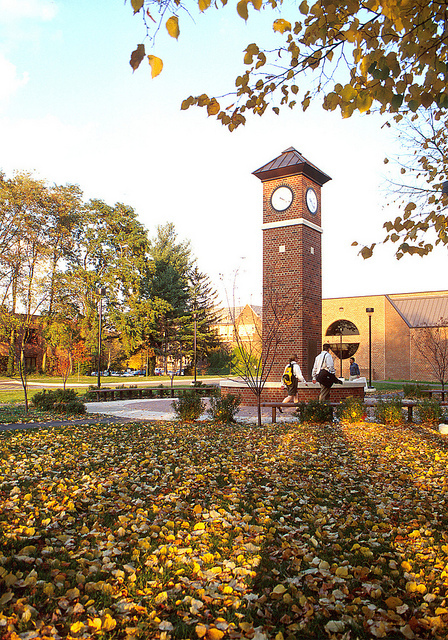 A private liberal arts college, St. John Fisher College is located in the Rochester suburb of Pittsford. The school was established in 1948, serves more than 3,700 students, and was ranked number one by U.S. News and World Report on a list of top Doctoral Research Universities. The freshman retention rate here is 83%, the graduation rate is 72.5%, and the rate of crime on campus is 0. 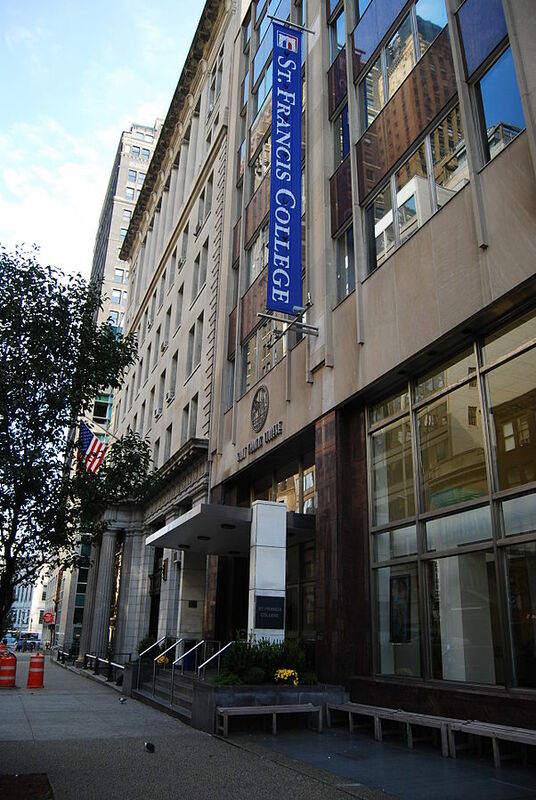 Located in the Brooklyn Heights area of New York City, St. Francis College is a private college that serves more than 2,700 students. The school was founded in 1859, is affiliated with the Roman Catholic Church, and has an average class size of just 20 students. The freshman retention rate at St. Francis College is 80%, the school’s graduation rate is 52.1%, and the rate of on-campus crime is 0. 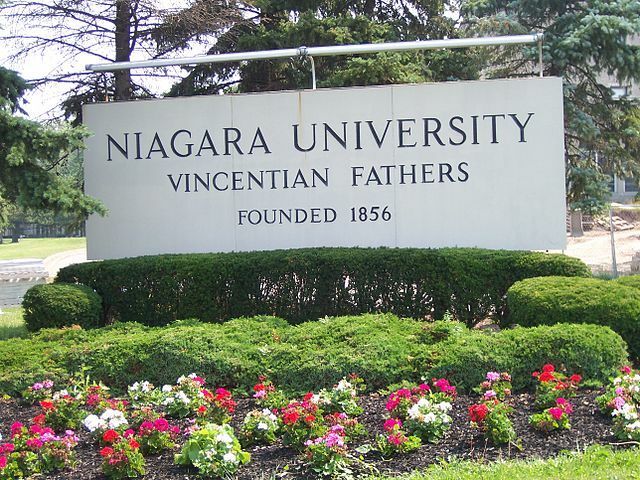 Niagara University is a private, Catholic university located in the Niagara County town of Lewiston. The school was established in 1856, serves more than 4,200 students, and offers both liberal arts and technical areas of study. The freshman retention rate at this school is 81%, the graduation rate is 65.1%, and the rate of crime on campus is 0. 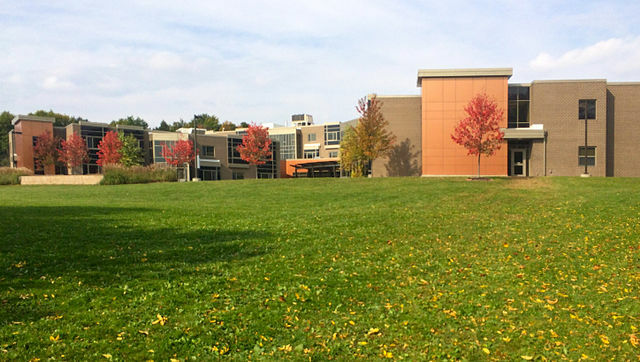 Located in the Erie County city of Amherst, Daemen College is a private liberal arts college that serves just over 3,000 students. The school was founded in 1947 and offers more than 30 different degree programs at the undergraduate and graduate level. The freshman retention rate here is 74%, the school’s graduation rate is 49.3%, and the rate of on-campus crime is 0. 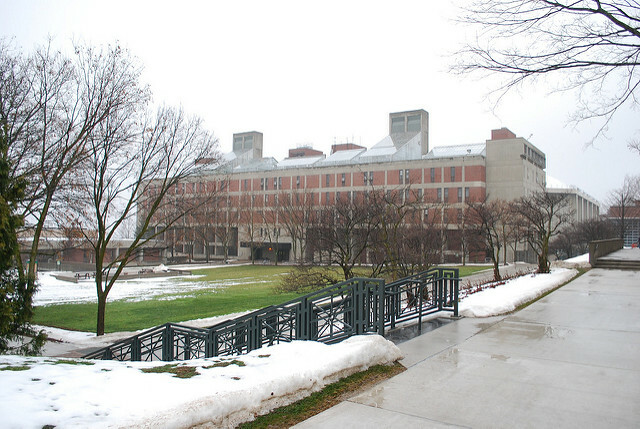 Rochester Institute of Technology (RIT) is a private university located in the Rochester suburb of Henrietta. 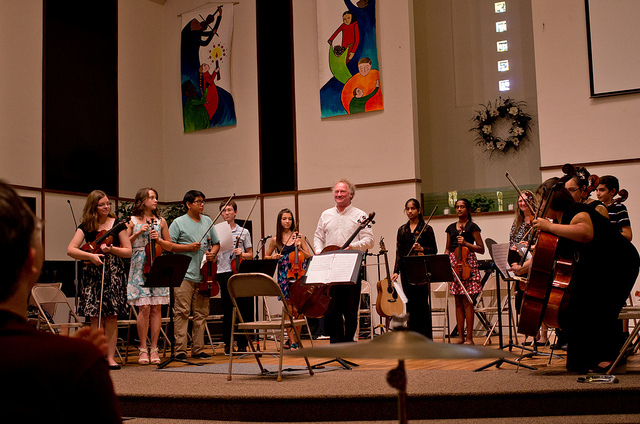 The school was founded in 1829, serves over 18,600 students, and is known for its fine arts programs that often rank in the top in the nation. The freshman retention rate at RIT is 87%, the graduation rate her is 63.9%, and the rate of crime on campus is 0. Located in the Queens area of New York City, St. John’s University is a private, Roman Catholic university that serves over 21,000 students. The school was founded in 1870, has a 105-acre campus, and offers more than 100 different degree programs. The freshman retention rate here is 80%, the school’s graduation rate is 55.7%, and the on-campus crime rate is 0. The State University of New York College of Environmental Science and Forestry (SUNY-ESF) is a public specialized university that is located in the Central New York city of Syracuse. The school was founded in 1911, serves over 2,700 students, and is known for its natural sciences programs. The freshman retention rate at SUNY-ESF is 86%, the school’s graduation rate is 71.6%, and the rate of crime on campus is 0. 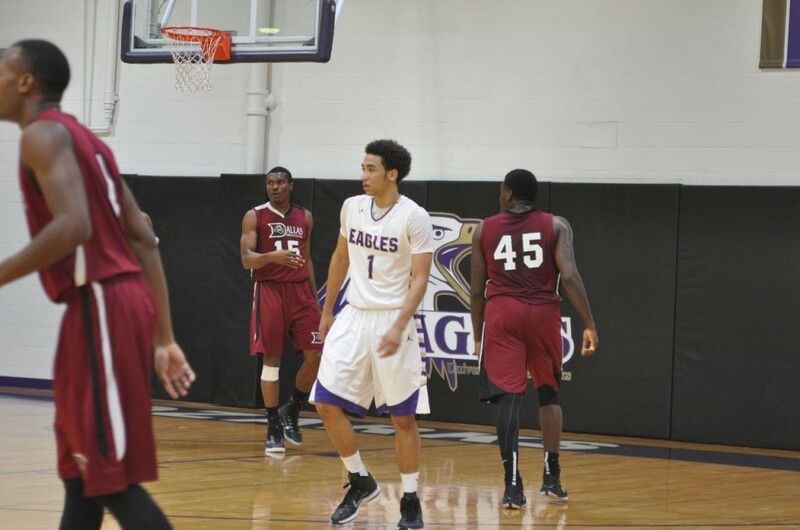 The Sage Colleges is a collection of three private colleges in the city of Albany. 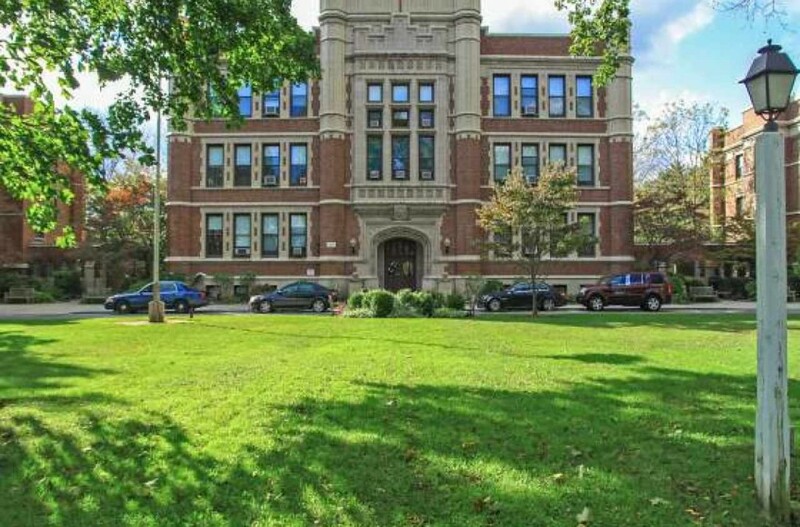 The schools are Russell Sage College, Sage College of Albany, and Sage Graduate School. The colleges serve a total of 2,800 enrolled students and offer more than 70 different degree programs. The freshman retention rate here is 78%, the graduation rate at the schools is 58%, the on-campus crime rate is 0. Located in the Westchester County village of Bronxville, Concordia College is a private liberal arts college that is affiliated with the Lutheran Church – Missouri Synod. The school was founded in 1881, serves over 950 students, and is known for its nursing program. The freshman retention rate at Concordia is 69%, the graduation rate here is 39.4%, and the rate of crime on campus is 0. A private, nonsectarian university, Pratt Institute is located the city of Brooklyn and serves more than 4,600 enrolled students. 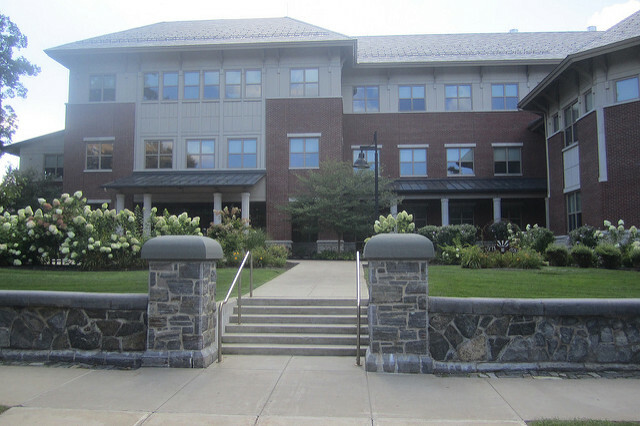 The school was founded in 1887, is comprised of five colleges, and is recognized by Princeton Review as one of the top colleges in the Northeast. The freshman retention rate at Pratt is 87%, the school’s graduation rate is 62.8%, and the on-campus crime rate is 0. 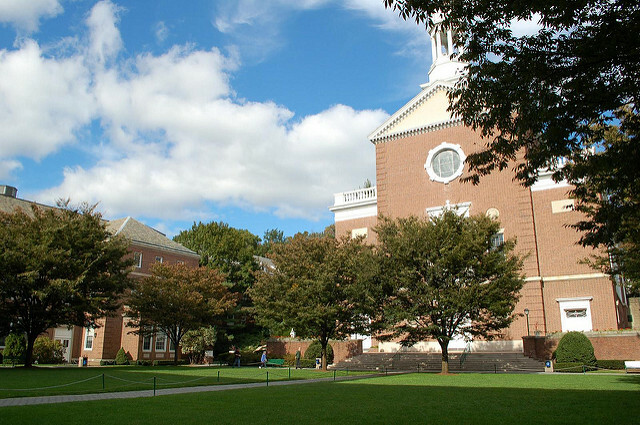 Manhattan College is a private Roman Catholic liberal arts college located in the Bronx area of New York City. The school was founded in 1853, serves more than 3,100 students, and is divided into five undergraduate schools. The freshman retention rate here is 88%, the graduation rate at Manhattan College is 73.7%, and the rate of crime on campus is 0. 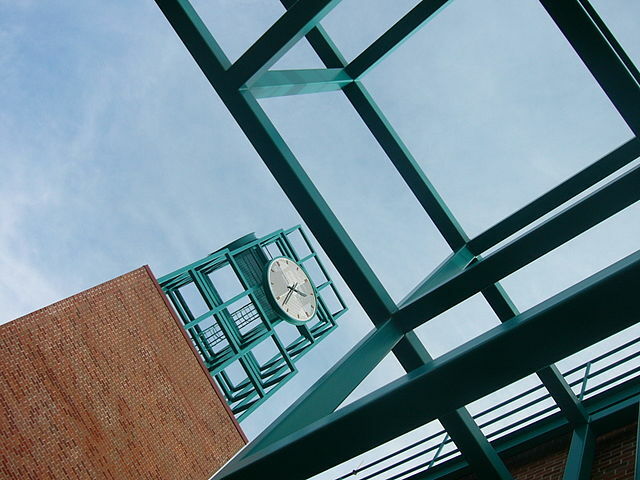 Located in the Broome County town of Vestal, Binghamton University is a public university that is a part of the State University of New York (SUNY) system. The school was founded in 1946, serves over 16,800 enrolled students, and has a 887-acre suburban campus. The freshman retention rate here is 91%, the school’s graduation rate is 80.8%, and the on-campus crime rate is 0. A private liberal arts college on a 180-acre campus in the Hudson River Valley town of Poughkeepsie, Marist College serves over 5,300 students. The school was established in 1929, offers more than 75 degree programs, and is consistently ranked as one of the country’s top regional colleges. Marist College’s freshman retention rate is 90%, the graduation rate here is 80.4%, and the rate of crime on campus is 0. 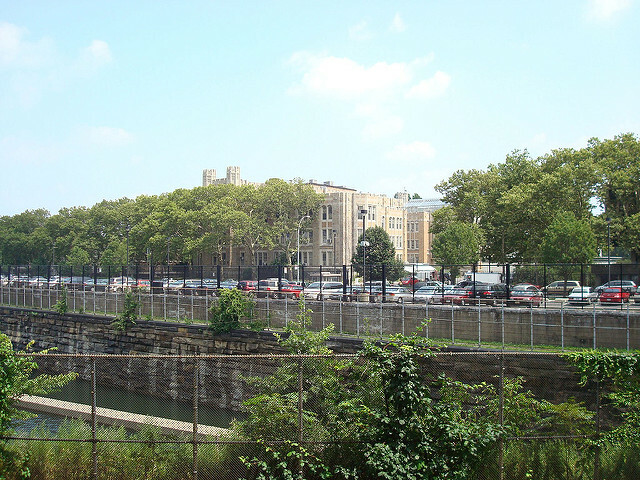 Located in the Bronx neighborhood of New York City, SUNY Maritime College is a part of the State University of New York (SUNY) system and is one of only seven degree-granting maritime academies in the country. The school was founded in 1874 and serves more than 600 enrolled students. The freshman retention rate here is 79%, the school’s graduation rate is 50.1%, and the on-campus crime rate is 1. There are more than 80 four-year colleges and universities in the state of Texas. 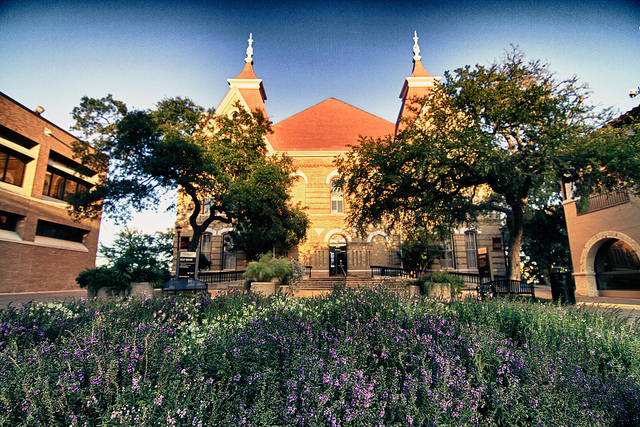 The second-largest U.S. state by both area and population, Texas offers students a wide choice in both public and private schools. If you’d like to attend college in The Lone Star State, here are the 50 safest colleges in Texas. Dallas Baptist University (DBU) is a Christian liberal arts university that is located on a 292-acre campus 12 miles southwest of downtown Dallas. Founded in 1898, the school began offering four-year degrees in 1970 and has an enrollment of over 5,400 students. DBU is the safest school in Texas. The freshman retention rate here is 70%, the graduation rate is 55.2%, and the crime rate on campus is 0. 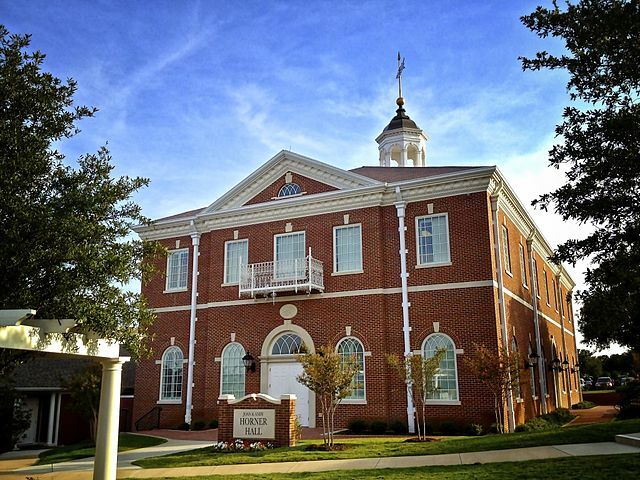 Located in Abilene, McMurry University is a private liberal arts university that serves just over 1,000 students. The school is affiliated with the United Methodist Church, offers 45 areas of study, and has a 40-acre urban campus. Another safe choice, the freshman retention rate here is 59%, the graduation rate is 37.9%, and the campus crime rate is 0. A private Seventh-day Adventist-affiliated university, Southwestern Adventist University is located in the city of Keene. The school serves just 800 students on its 150-acre campus, has small class sizes, and offers an accredited nursing program. The freshman retention rate at this school is 72%, the rate of graduation is 38.2%, and the crime rate on campus is 0. 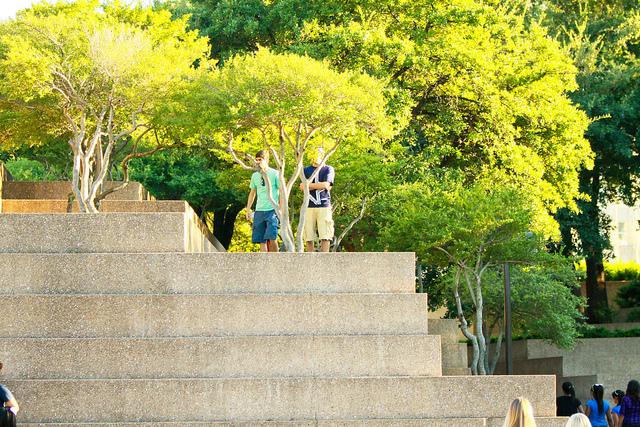 Located in Irving, the University of Dallas is a private Catholic university that serves over 2,500 students. Founded in 1956, the school has small class sizes and reports that nearly 80% of its graduates participate in international programs. The freshman retention rate here is 77%, the graduation rate is 66%, and the on-campus crime rate is 0. A private university affiliated with the Church of Christ, Abilene Christian University serves over 4,400 students. The school was founded in 1906 and was named among the “Best in the West” universities by Princeton Review for 2016. The freshman retention rate here is 79%, the school’s graduation rate is 56.4%, and the crime rate on campus is 0. Located in Waxahachie in the Dallas-Fort Worth area, Southwestern Assemblies of God University (SAGU) is a private Christian university that is affiliated with the Assemblies of God USA. The school serves over 2,000 students, offers bachelor’s and master’s degrees, and is known for its picturesque campus. SAGU retains freshman at a rate of 67%, has a graduation rate of 32.4%, and has an on-campus crime rate of 0. 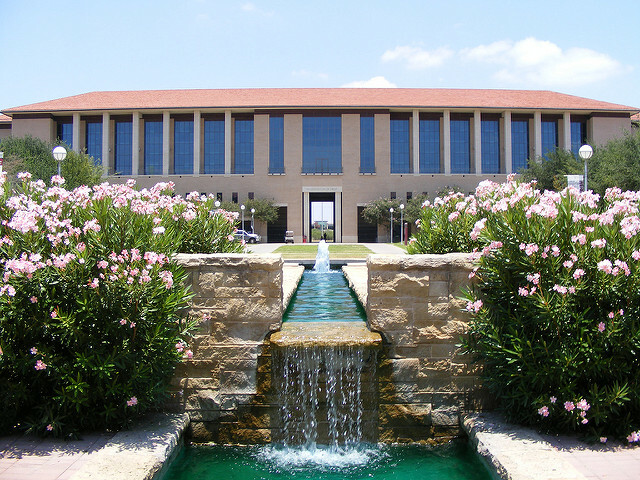 Texas A&M University in College Station is the flagship school of the Texas A&M system. 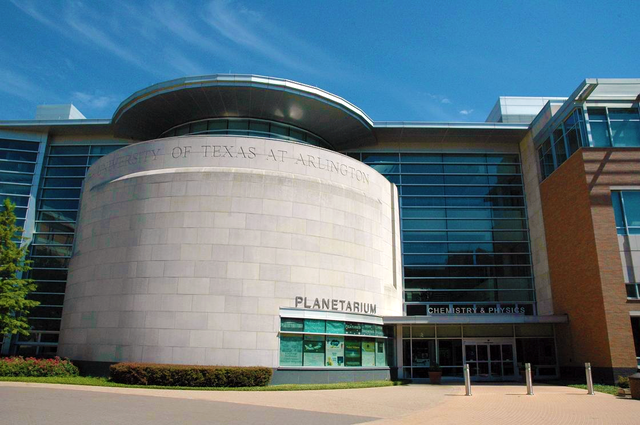 This public research university is the fourth-largest university in the country, the largest university in Texas, and is designated as a space, land, and sea grant institution. There are over 64,300 students enrolled here, and the school’s endowment is over $4.6 billion. 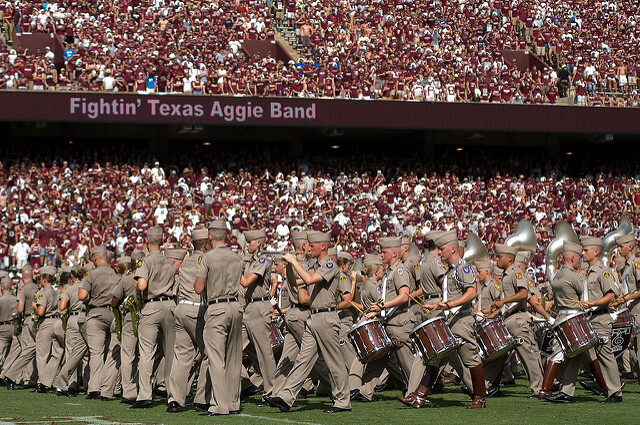 The freshman retention rate at TAMU is 91%, the graduation rate is 79.1%, and the rate of crime on campus is 0. Another public research university, the University of Texas at Dallas serves over 24,500 students. 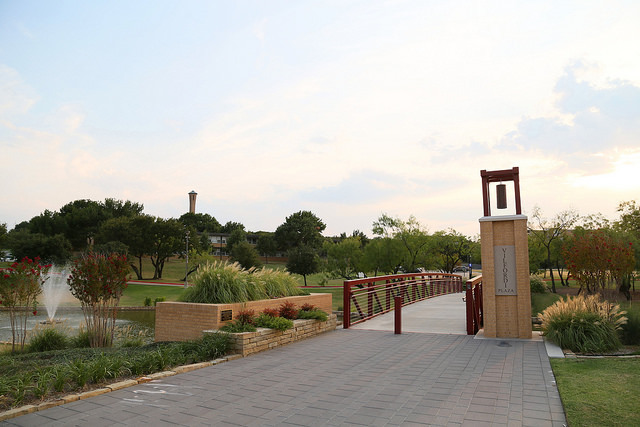 The 445-acre campus is located in Richardson, 18 miles from downtown Dallas, and the school has more than 130 areas of study in its eight schools. The freshman retention rate at this university is 88%, the graduation rate is 62.9%, and the on-campus crime rate is 0. 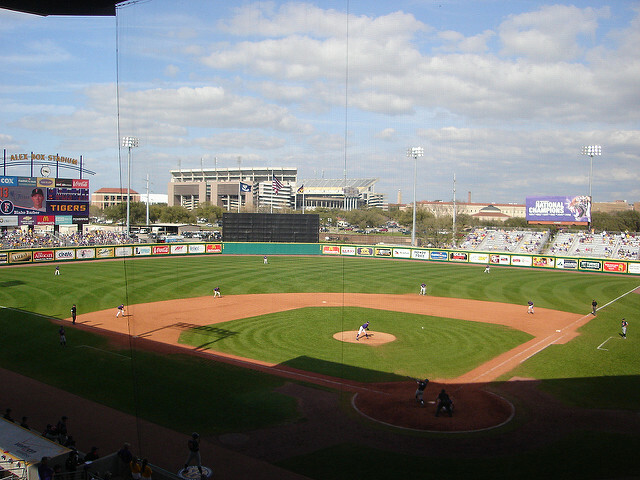 Located in Houston, the University of St. Thomas is a private Catholic university that serves over 3,700 students. 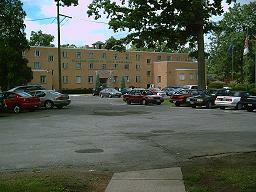 The school was founded in 1947, has three schools, and offers several types of campus housing for students. The freshman retention rate here is 77%, the rate of graduation is 51%, and the on-campus crime rate 0. The University of Houston – Downtown (UHD) is one of the four schools in the University of Houston System. 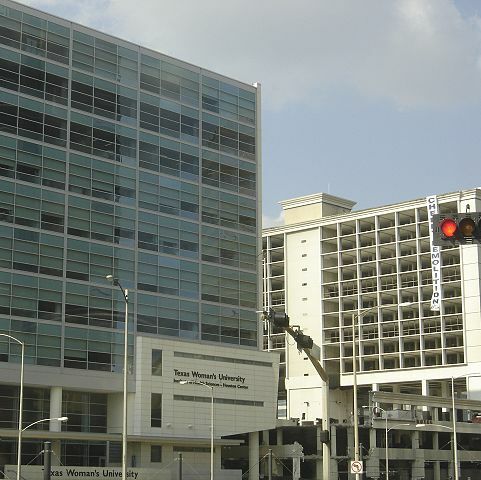 This public university that sits on a 20-acre urban campus in downtown Houston is the second-largest university in the Houston area and is among the top public universities in the region. UHD has over 14,200 enrolled students. The freshman retention rate here is 63%, the graduation rate is 14.1%, and the crime rate on UHD’s campus is 0. 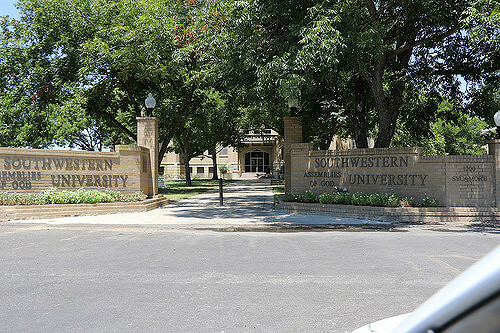 Despite its name, Texas Woman’s University (TWU) is a co-ed university that is located in the city of Denton. The school is one of the largest state-supported universities for women, and its doctoral nursing program is the largest in the country. The school has an enrollment of over 15,000 students. The freshman retention rate at TWU is 73%, the graduation rate here is 41.5%, and the rate of crime on campus is 0. 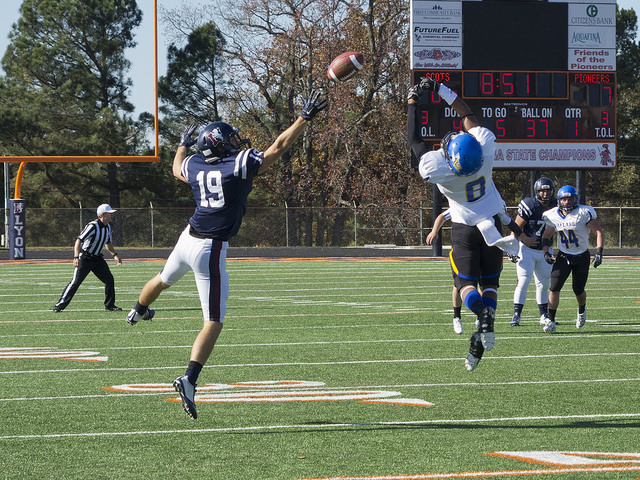 Located in the city of Plainview, Wayland Baptist University is a private Baptist university with an enrollment of over 8,000 students. The school was founded in 1908, has eight distinct schools, and runs several external campuses as well as an extensive online degree program. The freshman retention rate here is 47%, the rate of graduation is 33.2%, and the on-campus crime rate is 0. 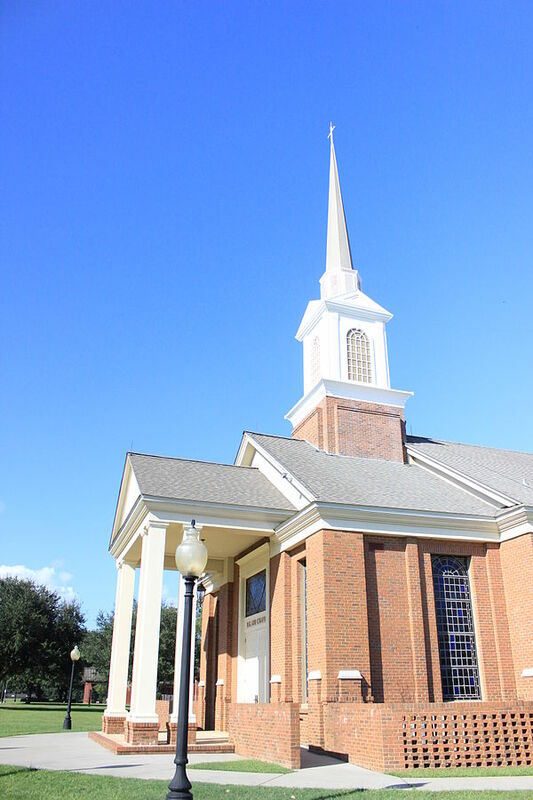 A Christian university that is affiliated with the Baptist General Convention of Texas, the University of Mary Hardin-Baylor (UMHB) serves over 2,900 students. 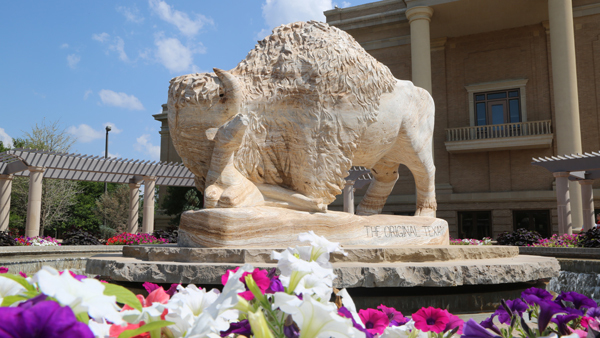 Located in the city of Belton, the school offers degree programs at the bachelor’s, master’s, and doctorate level and has a 170-acre suburban campus. The freshman retention rate at UMHB is 66%, the graduation rate here is 47.2%, and the rate of crime on campus is 0. Located in the city of Georgetown, Southwestern University (SU) is a private liberal arts college that serves over 1,500 undergraduates. The school was founded in 1840, is affiliated with the United Methodist Church, and offers more than 40 different degree programs. The freshman retention rate at SU is 87%, the school’s graduation rate is 70.1%, and the on-campus crime rate is 0. 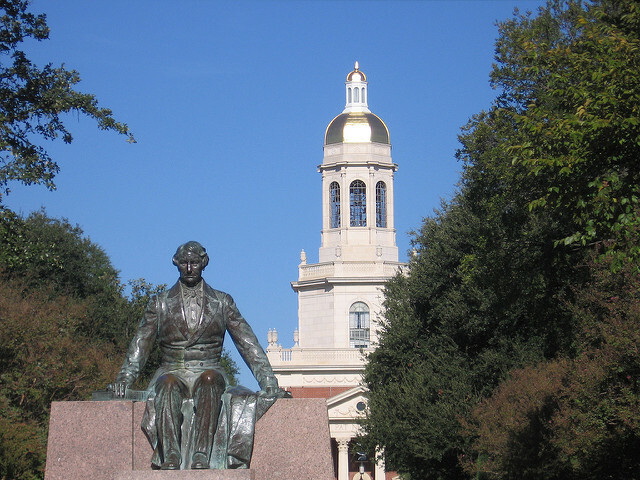 A private Baptist university, Baylor University is located in the city of Waco. Founded in 1845, the school is the oldest continuously operating university in the state, the largest Baptist university in the world, and has an enrollment of over 16,700 students. The freshman retention rate at Baylor is 88%, the graduation rate here is 74.7%, and the rate of crime on campus is 0. A private Christian university, Lubbock Christian University is located in the city of Lubbock and serves over 1,900 enrolled students. The school was founded in 1954, is affiliated with the Churches of Christ, and offers both graduate and undergraduate degrees. The freshman retention rate at Lubbock Christian is 70%, the graduation rate here is 41.3%, and the on-campus crime rate is 0. 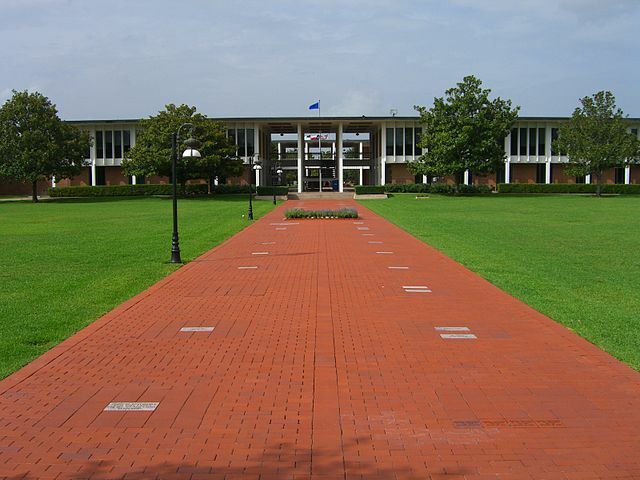 Located in the city of Huntsville, Sam Houston State University (SHSU) is a public university that is a member of the Texas State University system. Founded in 1879, the school is the third-oldest college in the state, sits just one hour north of Houston, and serves over 20,100 enrolled students. SHSU retains freshmen at a rate of 78%, has a graduation rate of 50.6%, and has an on-campus crime rate of 0. 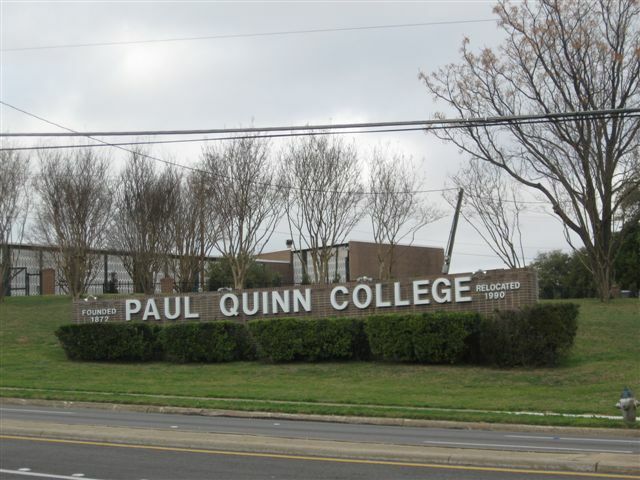 Paul Quinn College is a private historically black college that is located in Dallas, just south of downtown. The school has a 144-acre campus, is affiliated with the African Methodist Episcopal Church, and serves over 500 enrolled students. The freshman retention rate here is 57%, the school’s graduation rate is 4.9%, and the rate of crime on campus is 0. 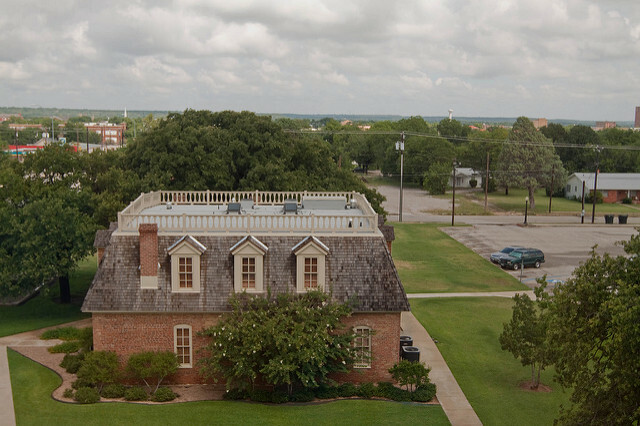 Located in the city of Brownwood, Howard Payne University is a private university that is affiliated with the Baptist General Convention of Texas. The school was founded in 1889, serves over 1,200 students, is known for its low student-teacher ratio as well as its Christian Studies program. 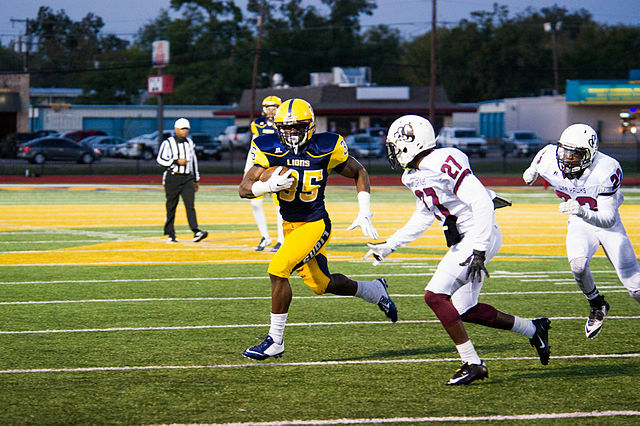 The freshman retention rate at Howard Payne is 61%, the graduation rate here is 42%, and the on-campus crime rate is 0. Texas A&M International University (TAMIU) is a public university that is located in Laredo. The school has a 300-acre campus, is the newest state university, and offers more than 70 degree programs at several levels. The freshman retention rate at TAMIU is 74%, the graduation rate is 43%, and the rate of crime on campus here is 0. A public research university in El Paso, the University of Texas, El Paso (UTEP) serves over 23,000 students. Founded in 1914 as the State School of Mining and Metallurgy, the school now offers over 150 degrees through its seven colleges and its 366-acre campus sits on a hillside overlooking the Rio Grande. The freshman retention rate at UTEP is 70%, the graduation rate here is 39.5%, and the on-campus crime rate is 0. Located on a 295-acre campus in Houston, William Marsh Rice University, or just Rice, is a private research university that serves over 6,600 students. The school has a 6:1 student-faculty ratio, is known for its applied sciences programs, and has an endowment of over $5.5 billion. 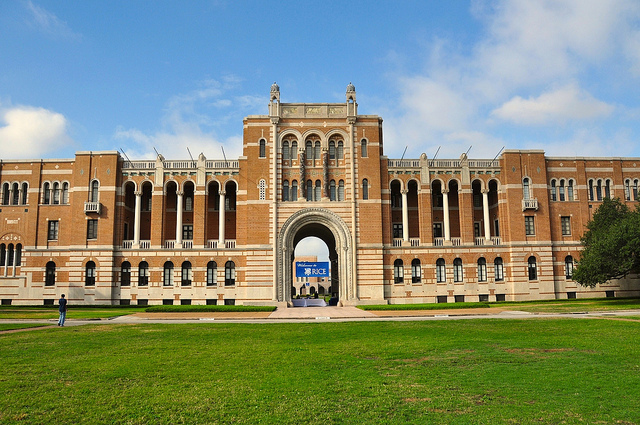 The freshman retention rate at Rice is 98%, the graduation rate here is 91.1%, and the rate of crime on campus is 0. West Texas A&M University is a public research university that is located in the city of Canyon, just 13 miles south of Amarillo. The school was established in 1910, has an enrollment of over 9,400 students, and offers more than 95 degree programs through its five colleges. The freshman retention rate here is 66%, the graduation is 40.3%, and the crime rate on campus at this school is 0. 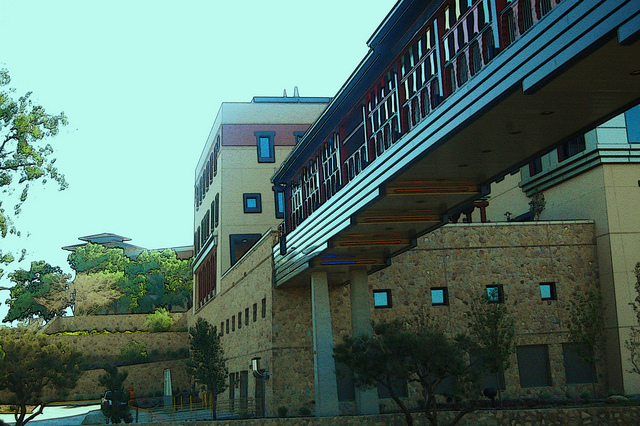 Located in the city of Austin, Concordia University is a private liberal arts university that serves over 2,500 students. The school was founded in 1926, is affiliated with the Lutheran Church-Missouri Synod, and offers over 30 areas of study. The freshman retention rate at Concordia is 48%, the graduation rate here is 34.4%, and the on-campus crime rate is 0. 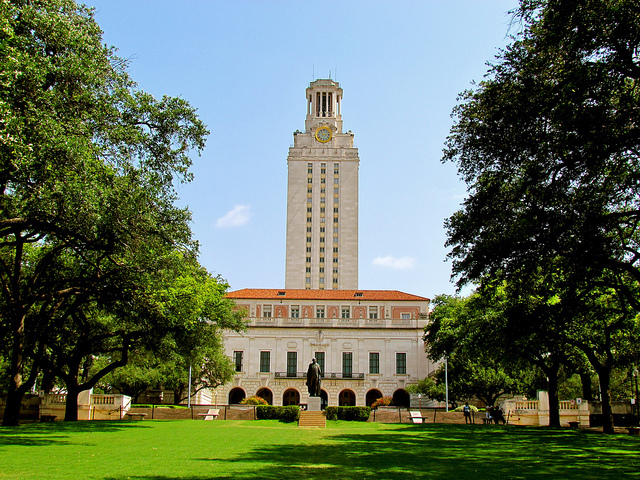 The University of Texas at Austin (UT Austin) is a public research university that is also the flagship school of the University of Texas system. The school was founded in 1881 and has an enrollment of over 51,300 students, making it one of the largest college campuses in the nation. UT Austin has also been labeled a “Public Ivy”. The freshman retention rate here is 94%, the graduation rate at this school is 79.4%, and the rate of crime on campus is 0. 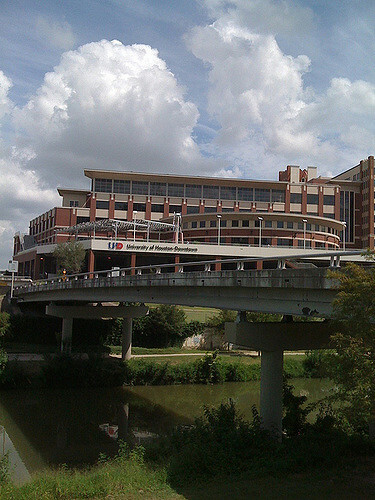 Located in Greater Sharpstown in Houston, Houston Baptist University (HBU) is a private university that is affiliated with the Baptist General Convention of Texas. 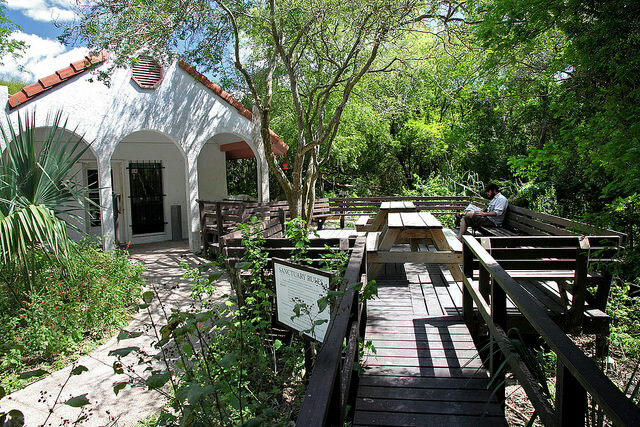 The school was founded in 1960, has a 100-acre campus as well as three museums, and serves over 3,100 students. The freshman retention rate at HBU is 63%, the graduation rate here is 43.9%, and the rate of on-campus crime is 0. 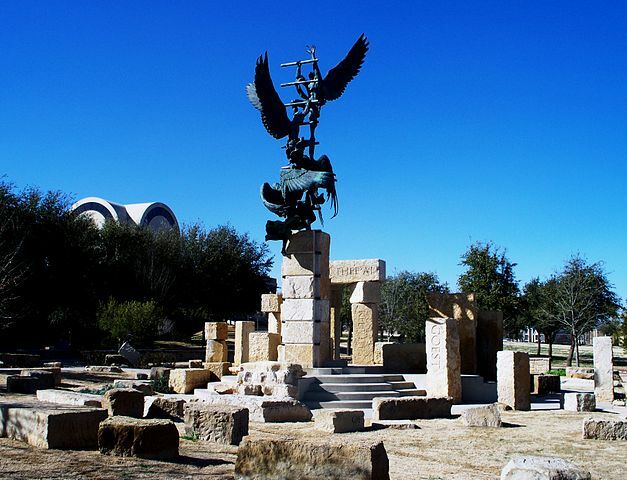 A private Catholic university, the University of the Incarnate Word is located on a 154-acre campus in San Antonio. Founded in 1881, the school is affiliated with the Sisters of Charity of the Incarnate Word, also operates an all-girls high school, and serves over 10,900 students. The freshman retention rate here is 69%, the school’s graduation rate is 40%, and the rate of crime on campus is 0. 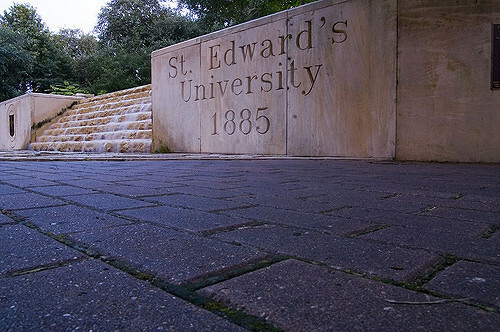 Located in the city of Austin, St. Edward’s University is a private liberal arts Roman Catholic university that serves approximately 5,000 students. The school was founded in 1877, has seven residence halls, and offers more than 60 degree programs. The freshman retention rate here is 83%, the graduation rate is 69.5%, and the crime rate on campus is 0. 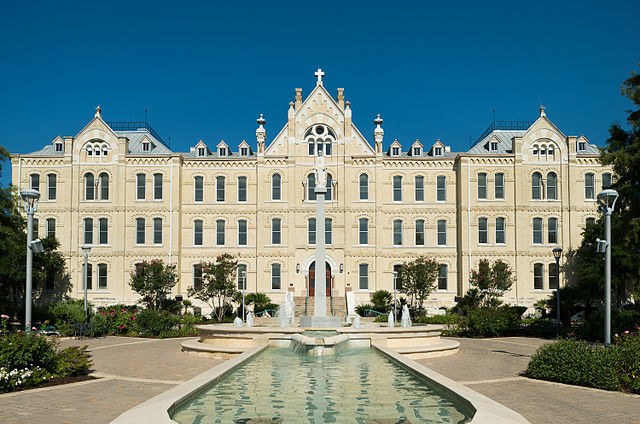 An independent Catholic university in San Antonio, Our Lady of the Lake University serves over 3,100 enrolled students. The school was founded in 1895, is affiliated with the Congregation of the Divine Providence, and offers several areas of graduate and undergraduate studies. The freshman retention rate at the school is 56%, the graduation rate here is 34.1%, and the rate of crime on campus is 0. Located in the city of Denton, the University of North Texas (UNT) is a public research university that serves more than 37,200 students. The school was established in 1890, has an 875-acre campus, and offers more than 200 degree programs through its thirteen schools. 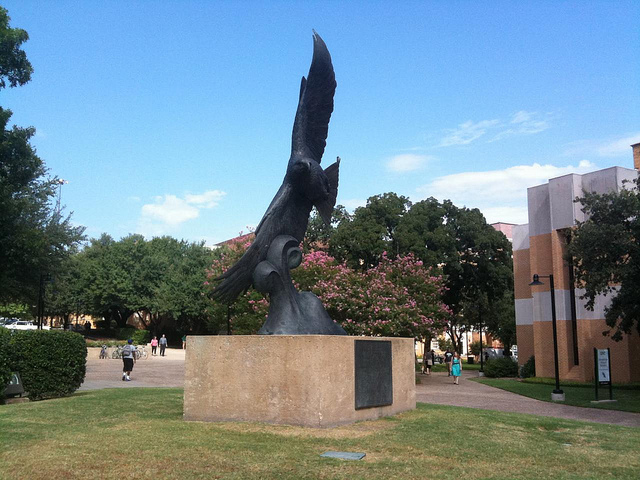 The freshman retention rate at UNT is 75%, the graduation rate here is 49.9%, and the on-campus crime rate is 0. 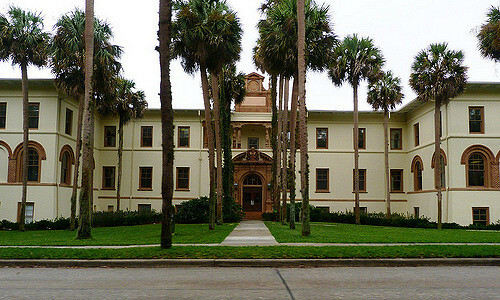 A public state university, the University of Texas, Rio Grande Valley is located on a 524-acre campus in the lower Rio Grande Valley in the city of Brownsville. The school was formed from a partnership between two other colleges but became a standalone university in 2011 and then renamed from UT Brownsville to the University of Texas – Rio Grande Valley in 2015. The school current serves over 8,600 enrolled students. The freshman retention rate here is 46%, the graduation rate is 25.7%, and the rate of crime on campus is 0. 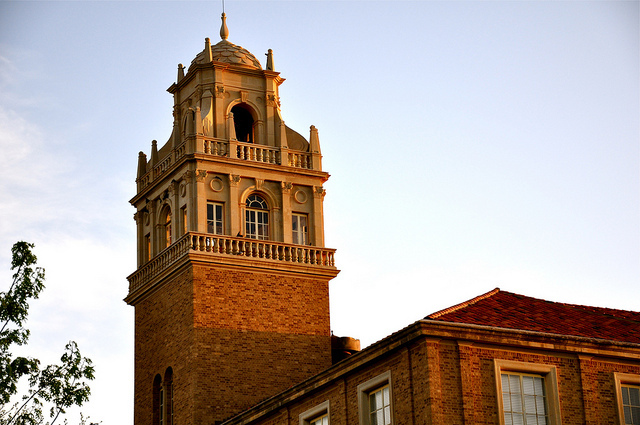 Located in the city of Fort Worth, Texas Wesleyan University is a private liberal arts college that is affiliated with the United Methodist Church. Founded in 1890, the school owns a 75-acre urban campus, serves over 3,300 students, and offers 27 areas of undergraduate study. The freshman retention rate at this school is 71%, the graduation rate here is 41.2%, and the on-campus crime rate is 0. Also referred to as Texas Tech, Texas Tech University is a public research university that is located on a 1,830-acre campus in Lubbock. The school serves over 35,800 students and is the only campus in the state to have an undergraduate university alongside a medical school and a law school. The freshman retention rate at Texas Tech is 82%, the graduation rate is 59%, and the rate of crime on campus here is 0. 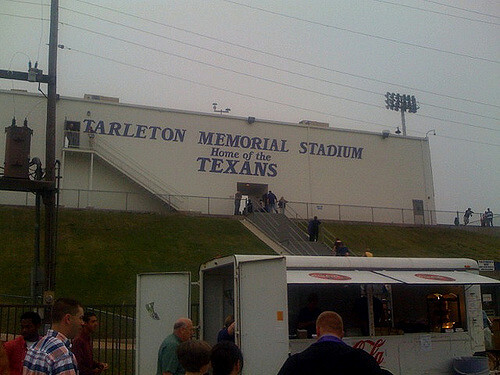 Located in Stephenville, Tarleton State University is a public university that is a part of the Texas A&M system. 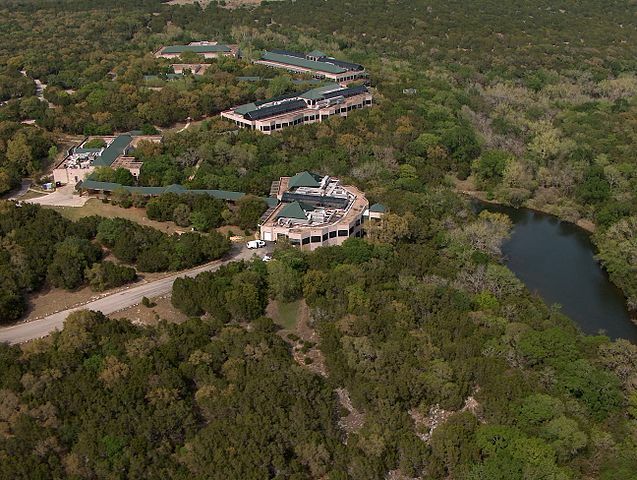 The school’s 1,973-acre campus is in a suburb of Dallas-Fort Worth, and it serves over 12,300 students through its more than 85 different degree programs. The freshman retention rate at Tarleton State is 68%, the graduation rate here is 43.4%, and the on-campus crime rate is 0. 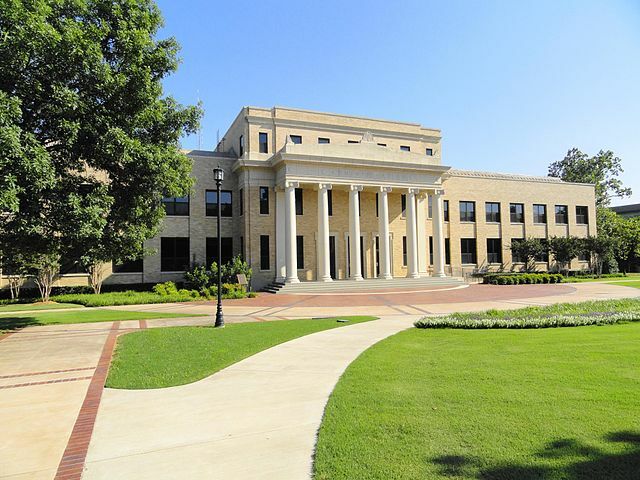 Another public state university, Stephen F. Austin State University (SFA) is located in the city of Nacogdoches and serves over 12,900 students. The school was founded in 1921, is one of just four independent state universities, and offers students more than 120 areas of study. The freshman retention rate at SFA is 67%, the graduation rate at this school is 43.2%, and the rate of crime on campus is 0. 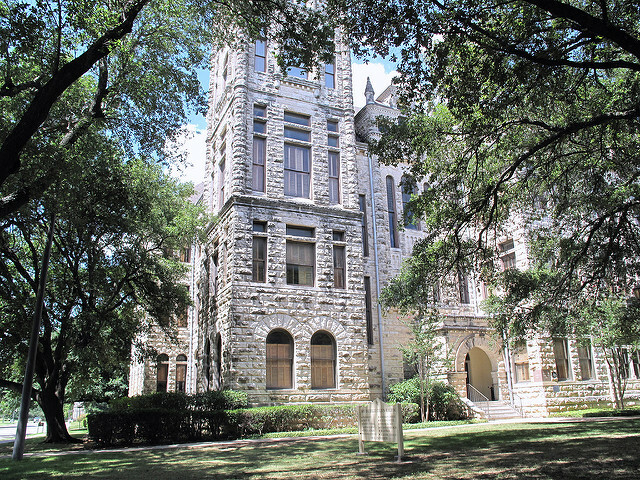 A private liberal arts college in the city of Sherman, Austin College is affiliated with the Presbyterian Church and has an enrollment of over 1,200 students. The school was established in 1849, has an average class size of 25, and requires that students live on campus for their first three years. The freshman retention rate at Austin College is 83%, the graduation rate here is 71.8%, and the rate of on-campus crime is 0. 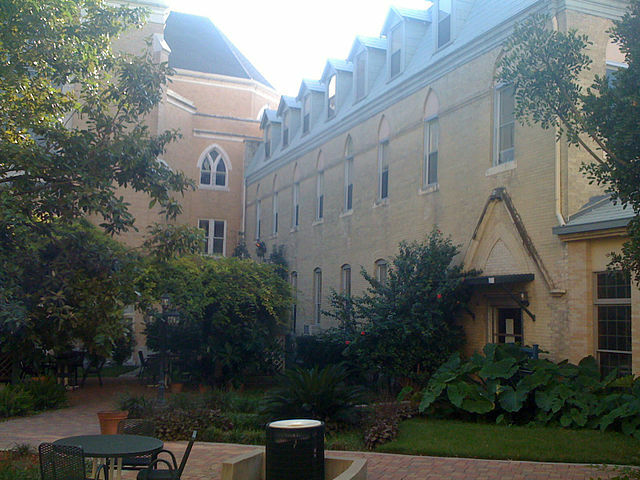 Located on a 135-acre campus northwest of downtown San Antonio, St. Mary’s University is a private Catholic liberal arts college. 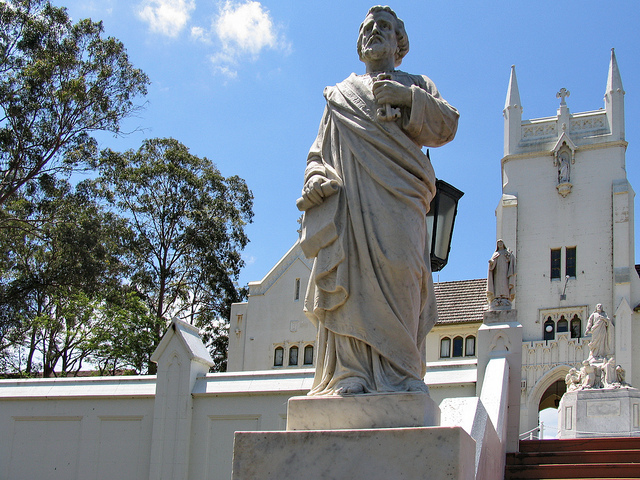 The school was founded in 1852 by the Society of Mary (Marianists), is the oldest Catholic university in the state, and serves over 3,800 students. The freshman retention rate here is 73%, the graduation rate at this school is 55%, and the rate of crime on campus is 0. 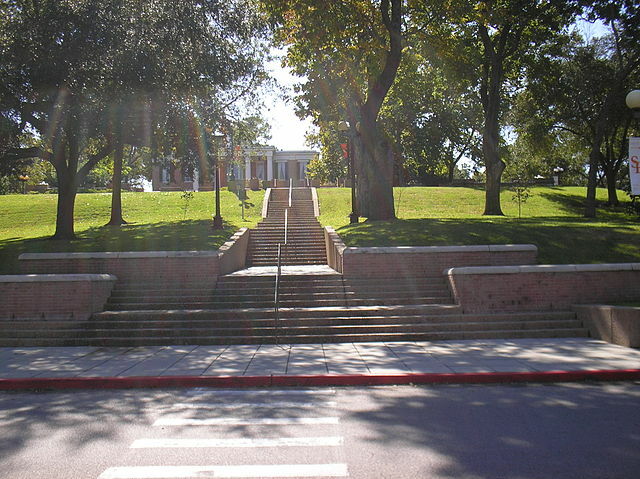 A public state university, the University of Texas at Arlington (UTA) is located in a suburb of Dallas-Fort Worth and is the second largest school in the UT system. UTA offers over 180 degree programs at the bachelor’s, master’s, and doctorate level, and serves more than 37,000 enrolled students. The freshman retention rate at UTA is 71%, the graduation rate here is 40.4%, and the on-campus crime rate is 0. 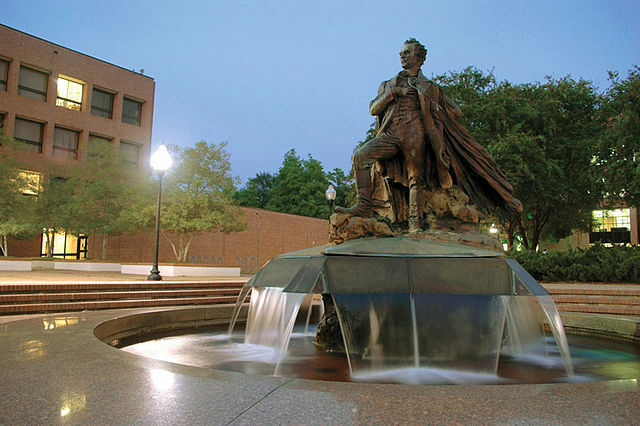 Another public research university, Texas A&M University – Commerce is located in the city of Commerce and is a part of the Texas A&M system. Founded in 1889, the school is the fourth-oldest college in the state, has a 140-acre campus, and serves over 12,300 students. The freshman retention rate here is 67%, the graduation rate is 45.2%, and the rate of crime on campus is 0. Located on a 725-acre suburban campus in San Antonio, the University of Texas at San Antonio (UTSA) is a public state university and the largest campus in the University of Texas system. The school was founded in 1969, offers more than 200 degree programs, and serves 28,600 enrolled students. The freshman retention rate at UTSA is 64%, the graduation rate here is 30%, and the rate of on-campus crime is 0. 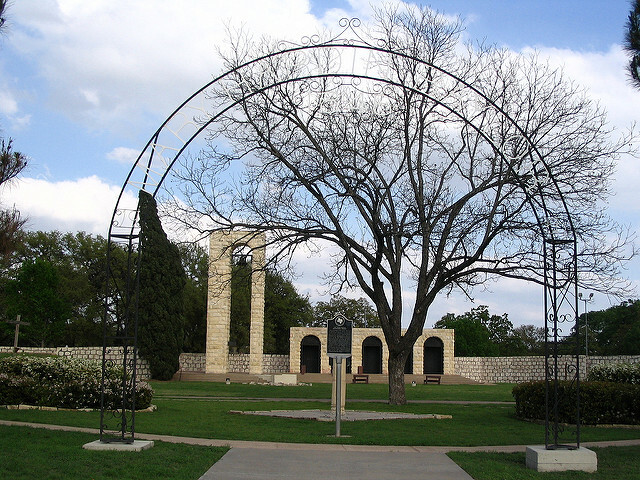 The largest school in the Texas State University system, Texas State University is a public university that is located in the city of San Marcos. The school was founded in 1899, has an enrollment of over 38,000 students, and offers nearly 200 areas of study through its ten colleges. The freshman retention rate at Texas State is 77%, the graduation rate here is 57.4%, and the rate of crime on campus is 0. 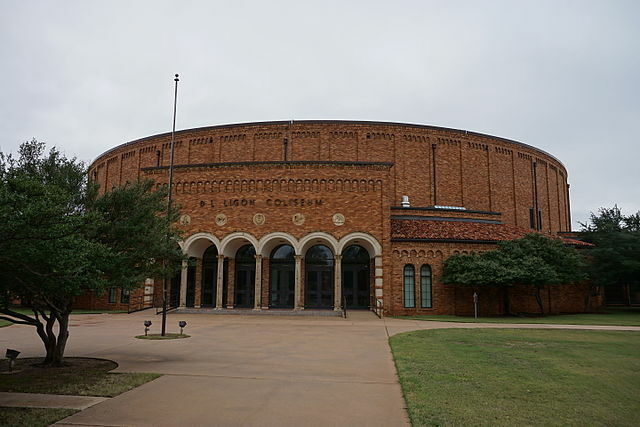 Located in the city of Farmers Branch, which is a Dallas suburb, Dallas Christian College is a private undergraduate college that is affiliated with the Christian Church. 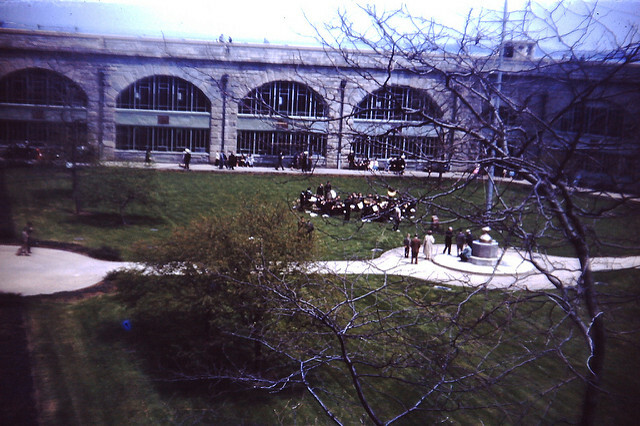 The school was founded in 1950 and has an active enrollment of just over 300 students. The freshman retention rate here is 58%, the graduation rate at this school is 30.2%, and the rate of on-campus crime here is 0. Another branch of the Texas A&M system, Texas A&M University at Galveston (TAMUG) is affiliated with the College Station campus and offers ocean-oriented degrees through several maritime-focused majors. 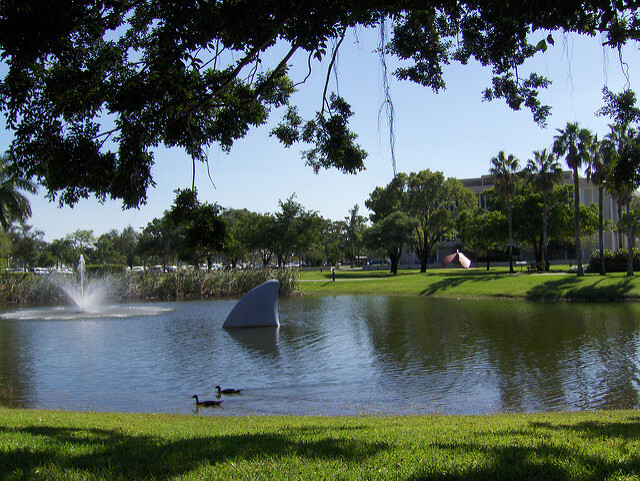 The 135-acre campus is located on Pelican Island and serves over 2,300 enrolled students. The freshman retention rate at TAMUG is 45%, the graduation rate here is 29.9%, and the rate of crime on campus is 0. Located in Wichita Falls, Midwestern State University is a public liberal arts university that serves over 6,000 students. The school was established in 1922, is the state’s only public liberal arts school, and has seven colleges that offer more than 70 areas of study. The freshman retention rate here is 67%, the school’s graduation rate is 44.2%, and the rate of crime on campus is 0. 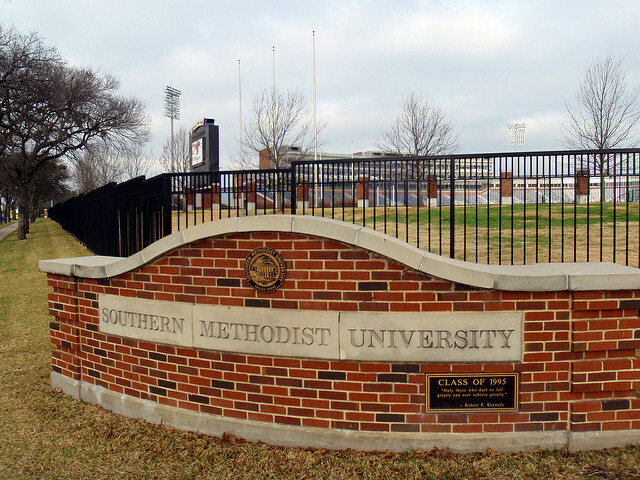 A private research university in the Dallas suburb of Highland Park, Southern Methodist University (SMU) is affiliated with the United Methodist Church. The school was founded in 1911, serves over 11,600 students, and has an endowment of over $1.5 billion. The freshman retention rate at SMU is 89%, the graduation rate here is 79%, and the on-campus crime rate is 0. 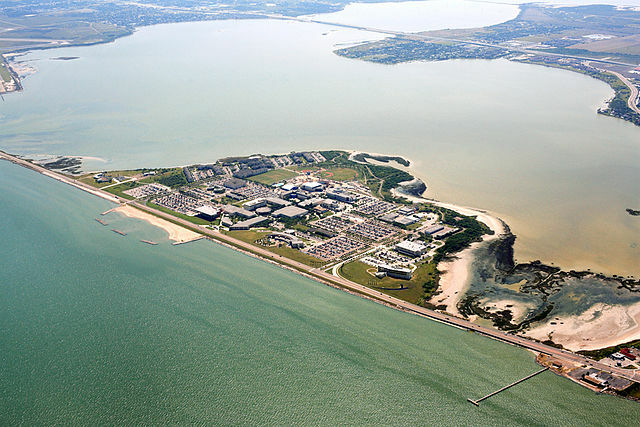 Located on a 240-acre campus on Ward Island in Corpus Christi, Texas A&M University – Corpus Christi is a public state university that serves over 11,200 students. The school was founded in 1947 and offers more than 60 areas of study through its five colleges. The freshman retention rate here is 57%, the school’s graduation rate is 40.2%, and the rate of crime on campus is 0. 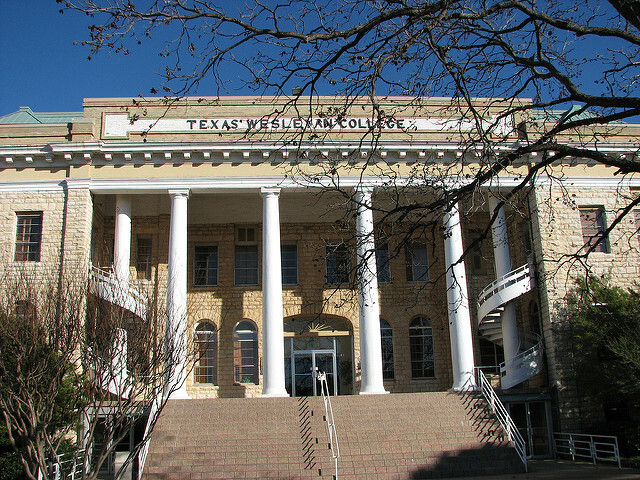 A state university in the city of Odessa, the University of Texas of the Permian Basin (UTPB) serves over 6,000 enrolled students. The school was founded in 1973, has a low student-faculty ratio, and has experienced growth due to the area’s recent oil boom. The freshman retention rate at UTPB is 66%, the graduation rate here is 26.9%, and the on-campus crime rate is 0. 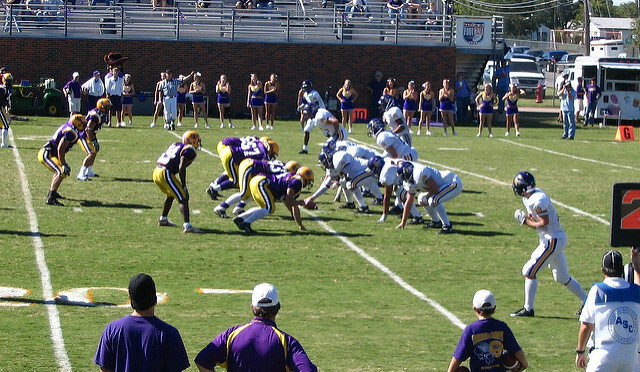 Located in the city of Abilene, Hardin-Simmons University is a private Baptist university that is affiliated with the Baptist General Convention of Texas. The school was founded in 1891, serves over 2,400 students, and offers more than 70 different areas of study. The freshman retention rate here is 63%, the school’s graduation rate is 51.4%, and the rate of crime on campus is 1. A private Christian University, Texas Christian University (TCU) is located in Fort Worth and is affiliated with the Disciples of Christ. The school was founded in 1873, has a 325-acre urban campus, and serves more than 10,300 students through its eight colleges. 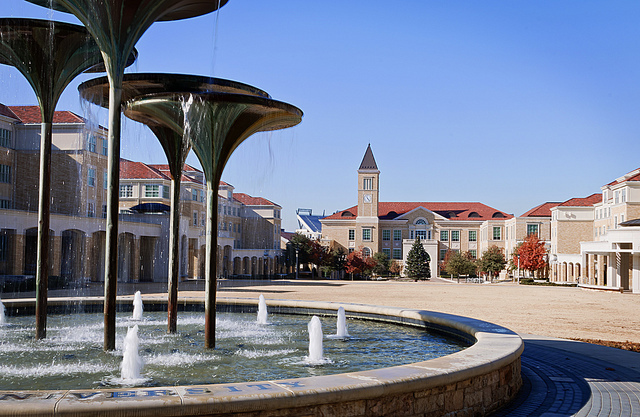 The freshman retention rate at TCU is 90%, the graduation rate here is 76%, and the on-campus crime rate is 1. 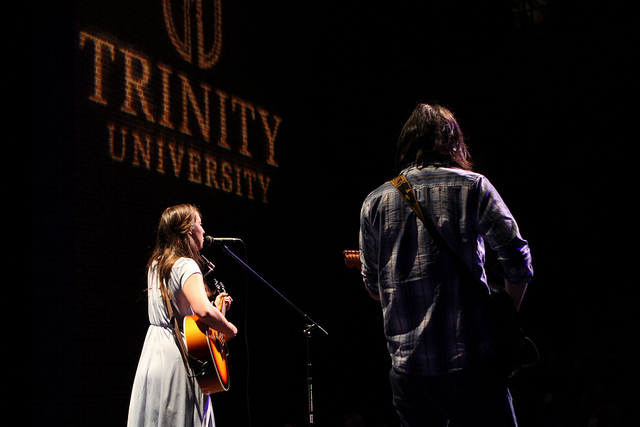 Located on a 117-acre urban campus in San Antonio, Trinity University is a private liberal arts college. The school was founded in 1869, is just three miles north of downtown and the popular Riverwalk area, and serves more than 2,400 students who have a choice of 47 majors. The freshman retention rate at Trinity University is 96%, the graduation rate here is 81.6%, and the rate of crime on campus is 1. As the nation’s most populous state, it’s not surprising that California also has one of the most extensive university and college systems in the country. There are over 140 four-year colleges in the state of California to choose from, some over a century old. If a higher education in The Golden State is in your future, here are the 50 safest colleges in California. 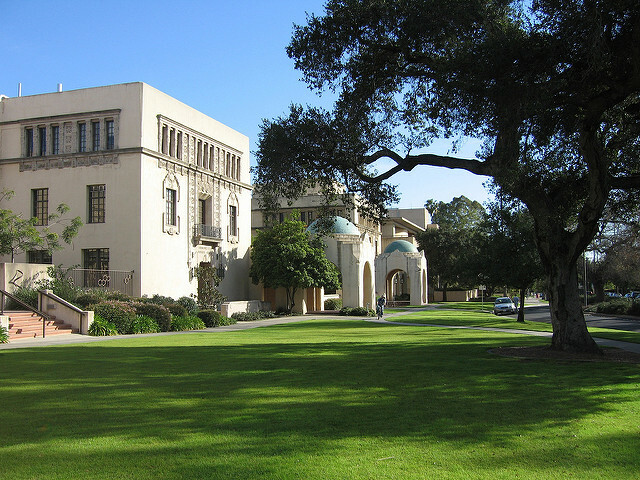 Located in the Bay Area’s Silicon Valley, Menlo College is a private four-year college that specializes in business. 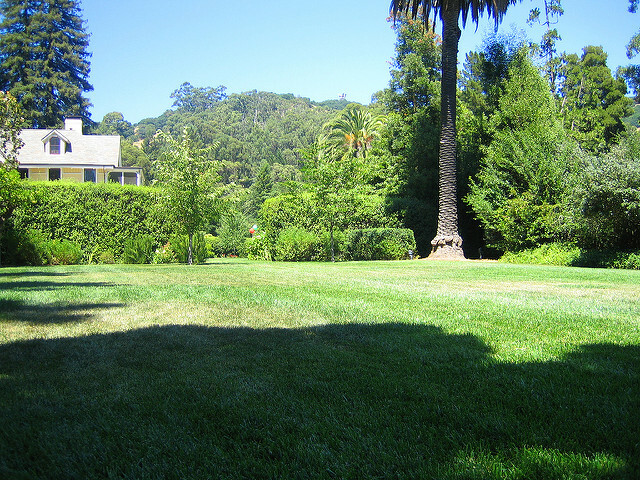 The college sits on a 45-acre campus in the town of Atherton and is just 25 miles southeast of San Francisco. The school was founded in 1927 and has an enrollment of just 750 students. The school has a freshman retention rate of 82% and a graduation rate of 40.8%. 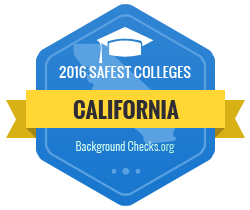 Menlo College is the safest college in the state of California with a campus crime rate of 0. 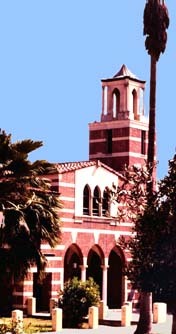 Biola University is a private non-denominational Christian university located in La Mirada, CA. The 96-acre campus is just 16 miles from downtown Los Angeles, and the college has a total enrollment of over 5,300 students. The university is divided into six schools and offers more than 40 fields of study at both the undergraduate and postgraduate level. The freshman retention rate here is 85%, and the graduation rate is 68.2%. Another safe choice, the campus crime rate at Biola University is also 0. Located in Santa Clarita, The Master’s College is a private non-denominational conservative liberal arts college. The school offers degree programs in 58 areas of study from a biblical perspective and has an average enrollment of 1,100 students. The Master’s College has a freshman retention rate of 81%, and its graduation rate is 53.6%. The campus crime rate here is also 0. 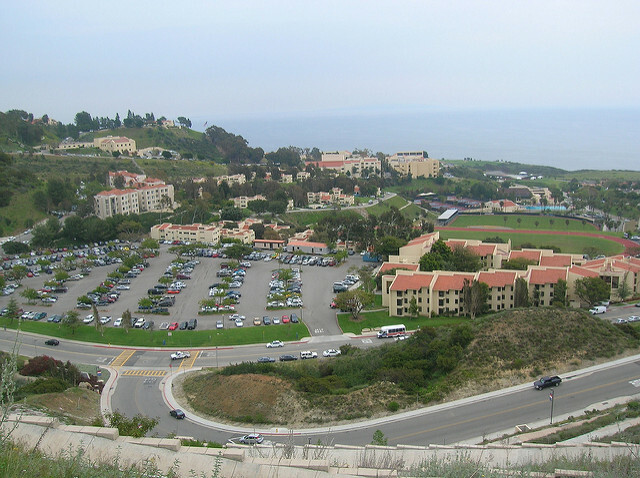 Point Loma Nazarene University (PLNU) is located on the oceanfront in San Diego’s Point Loma area. The school is a private Christian liberal arts college that was founded in 1902 by the Church of the Nazarene. PLNU has over 3.400 enrolled students and offers more than 60 areas of study for both undergraduates and graduates. Freshmen here have an 89% retention rate, and the school has an impressive 72.1% graduation rate. PNLU’s campus crime rate is 0. 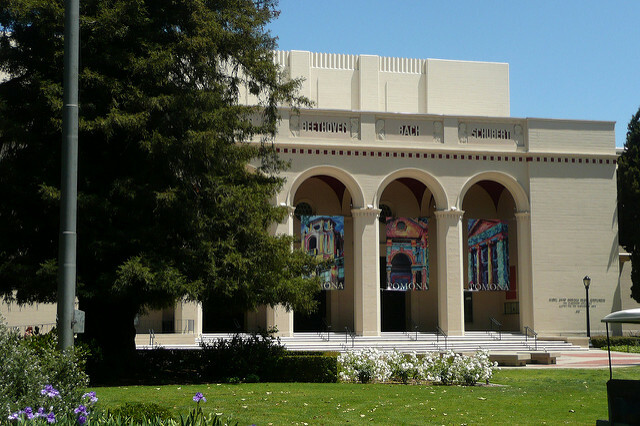 Located in Pasadena, ArtCenter College of Design is a private specialized college that specializes in a variety of art and design fields. The college was founded in 1930, owns a 175-acre campus, and has an enrollment of over 1,700 students. 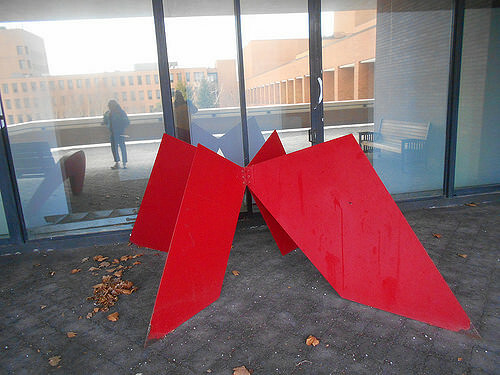 The school has gained recognition for its programs in industrial design, media design, and film from several outlets. The freshman retention rate here is 80%, and the graduation rate is 64.4%. The crime rate on this school’s campus is 0. 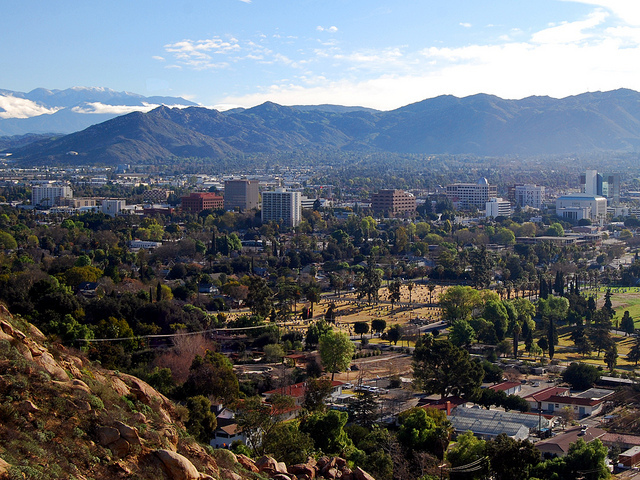 Woodbury University is private university located in Burbank. The school was established in 1884 and has four schools that offer both undergraduate and graduate degrees. The schools are Liberal Arts, Business, Architecture, and Media, Culture & Design. Woodbury has approximately 1,500 students on its 22.4-acre campus and has residence halls that can accommodate 225 residents. The school retains 75% of freshmen, and its graduation rate is 44.7%. The campus crime rate here is also 0. 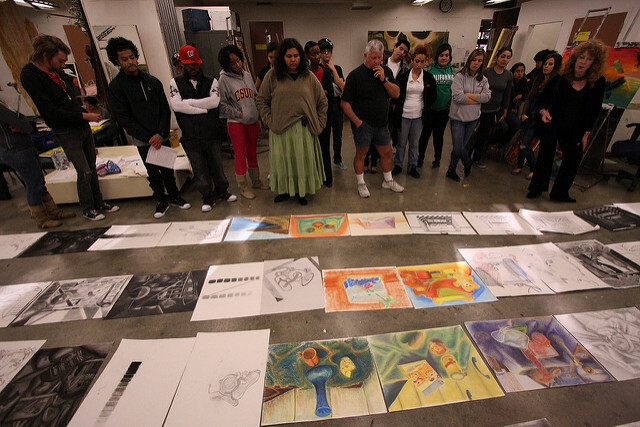 Located in Laguna Beach, Laguna College of Art & Design (LCAD) is a private fine arts college with an enrollment of just 500 students. Founded in 1961, the school offers a Bachelor of Fine Arts in several areas including Animation, Design & Digital Media, and Illustration. 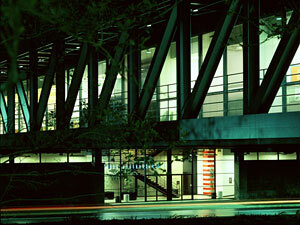 LCAD is considered by many leading companies to be one of the best design schools in the world. The freshman retention rate here is 84%, and the graduation rate is 63.3%. The campus crime rate at LCAD is 0. 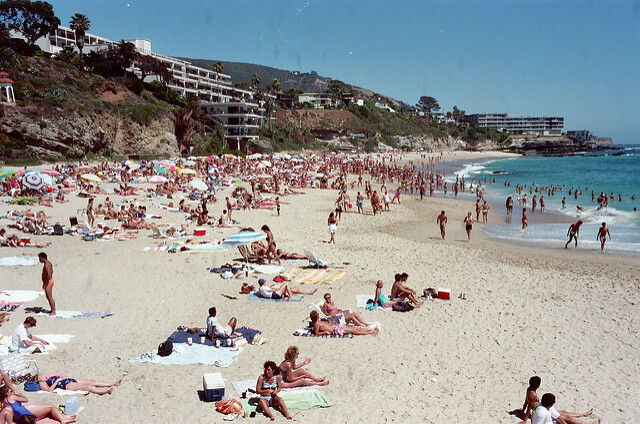 Pepperdine University is private research university in Malibu that is affiliated with the Churches of Christ. 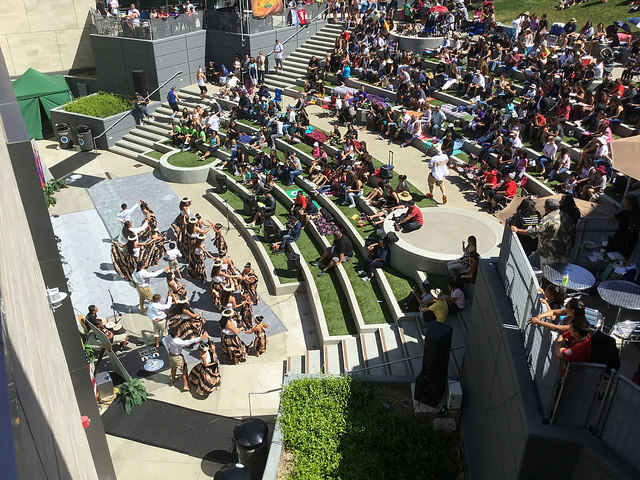 The school owns an 830-acre campus that overlooks the Pacific Ocean and has a total enrollment of 7,600 students. 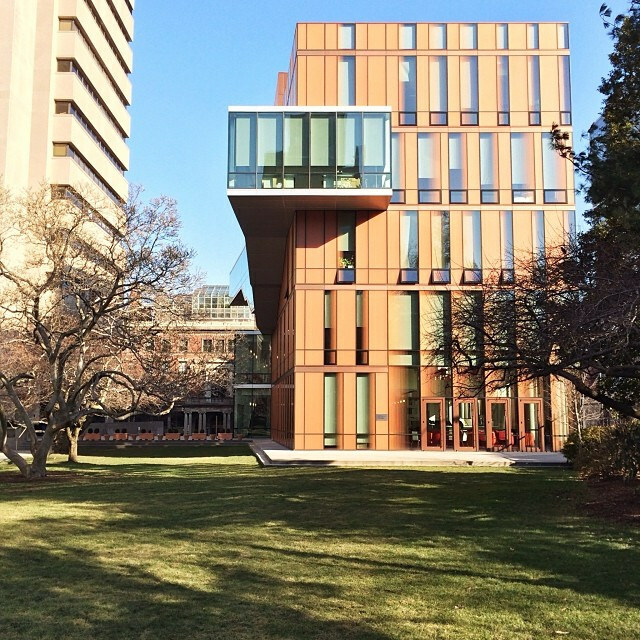 The school offers many undergraduate and graduate programs and is also home to a School of Law. in 2016, Pepperdine was ranked 52nd among top “National Universities” and 25th on the list of Best Value Schools by U.S. News and World Report. The freshman retention rate here is 92%, the graduation rate is 80.4%, and the campus crime rate is also 0. 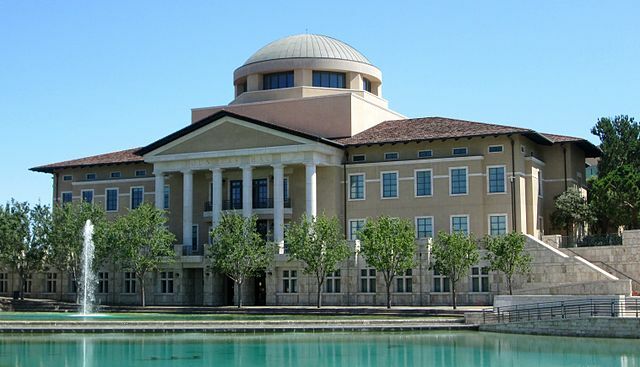 A liberal arts college in Aliso Viejo, Soka University of America was established in 2001. The school has an endowment of over $1 billion, serves just 400 undergraduates, and specializes in liberal arts studies with an emphasis on such areas as Humanities, International Studies, and Environmental Studies. Class sizes here average 12 students, the freshman retention rate is 96%, and the graduation rate is 84.2%. The campus crime rate at Soka University is 0. Located in Riverside, California Baptist University (CBU) is a private, Christian liberal arts university. 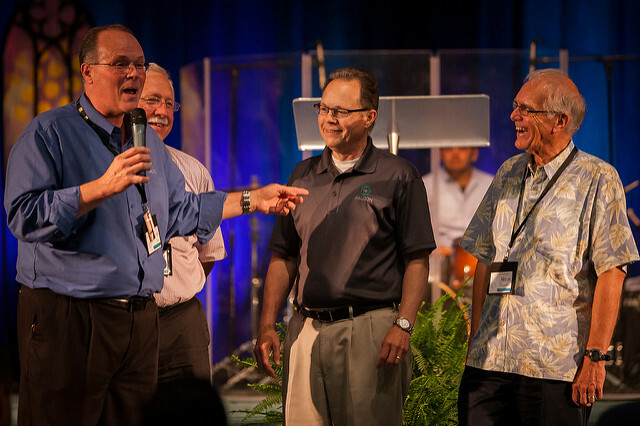 Founded in 1950, the school is affiliated with the Southern Baptist Convention and has an enrollment of more than 8,500 students. The freshman retention rate at CBU is 77%, and the graduation is 58.1%. The campus crime rate here is also 0. 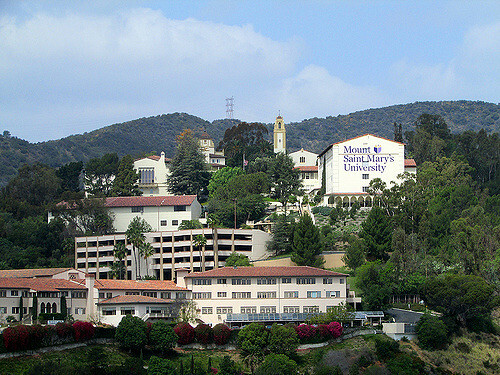 A private Catholic liberal arts college, Mount Saint Mary’s University is located in Los Angeles. The school is considered primarily a women’s college and has an enrollment of over 2,700 students. Mount St. Mary’s University now has two urban campuses and is among the highest-ranking graduate universities in the western U.S. The school’s freshman retention rate is 79%, its graduation rate is 63.8%, and its campus crime rate is 0. 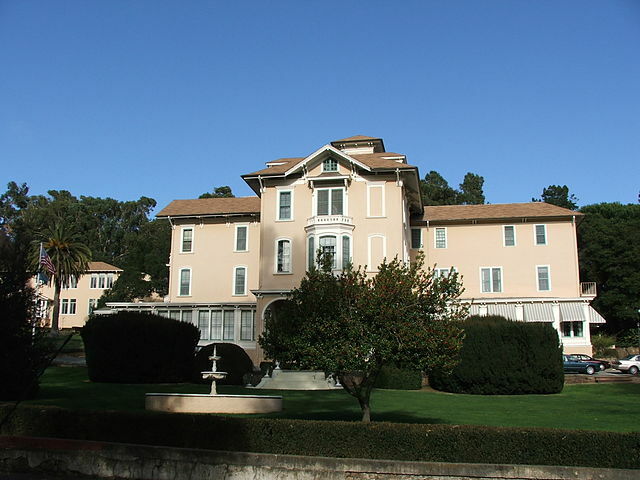 Located in the Bay Area suburb of Moraga, Saint Mary’s College of California is a private college that is affiliated with the Roman Catholic Church that serves over 4,100 students. This suburban school sits on a 420-acre campus just 20 miles east of San Francisco and offers 40 academic majors through its four schools. The school’s freshman retention rate is 90%, its graduation rate is 67.5%, and its campus crime rate is 0. 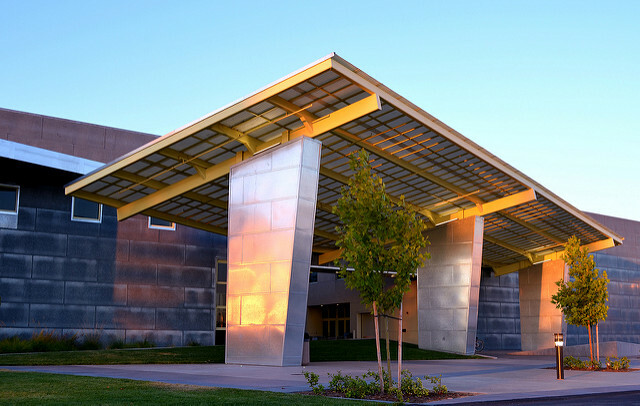 A private college in San Jose, Cogswell Polytechnical College has just 600 enrolled students. 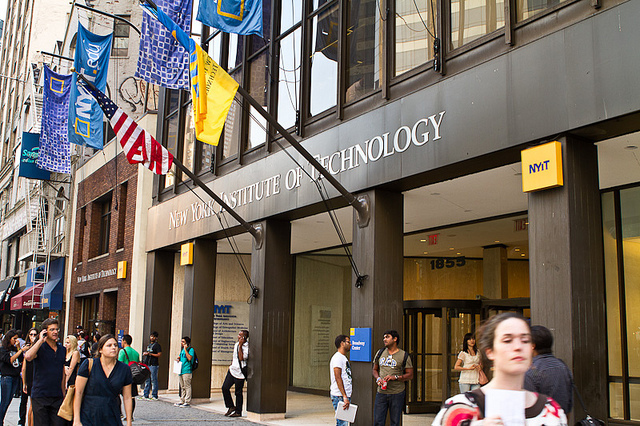 Founded in 1887, the school has programs that range from Engineering to Digital Audio Technology to Game Design Art. The student to faculty ratio at Cogswell is just 7:1. The freshman retention rate here is 80%, and the graduation rate is 31.3%. The campus crime rate at this school is 0. Located in Fullerton in Southern California, California State University, Fullerton (CSUF) is a public research university that is part of the “CSU” system. With over 38,900 students, the school has the second-largest student body in the CSU system, and it offers more than 240 degree programs. The freshman retention rate at CSUF is 89%, and the graduation rate is 53.5%. The campus crime rate here is 0. 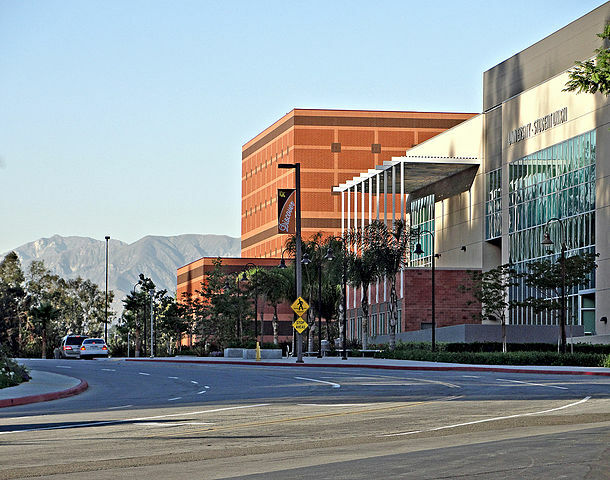 The University of La Verne is a private university located in the city of La Verne, just 35 miles east of Los Angeles. Founded in 1891, the school has a total enrollment of 7,000 students in its four schools that includes a College of Law. The school retains freshmen at a rate of 88%, has a graduation rate of 59.3%, and its campus crime rate is 0. 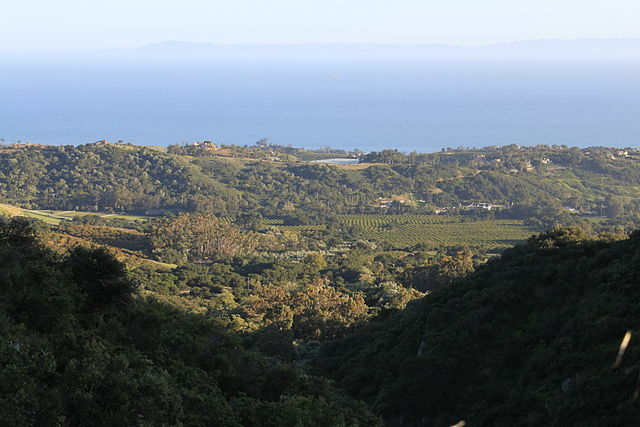 Westmont College is located in Montecito in Santa Barbara County. This private Christian liberal arts college was founded in 1937 and serves over 1,300 registered students. The school offers 26 degree programs and has an average class size of just 18 students. The freshman retention rate here is 85%, the graduation rate is 75.8%, and the crime rate on campus is 0. Located in Costa Mesa, Vanguard University of Southern California is a private Christian university that serves over 2,500 students. The school’s programs specialize in liberal arts and professional studies through its more than 30 degree programs. The retention rate of freshmen here is 76%, the graduation rate is 52.3%, and the campus crime rate is 0. 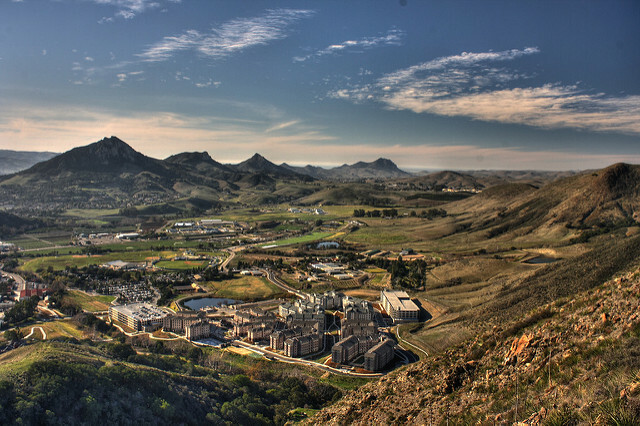 A private liberal arts university, California Lutheran University (CLU) is located on a 225-acre campus in Thousand Oaks. Founded in 1959 by the Evangelical Church in America, the school is now nonsectarian and has over 4,200 students. CLU’s freshman retention rate is 85%, its graduation rate is 70.1%, and its campus crime rate is 0. 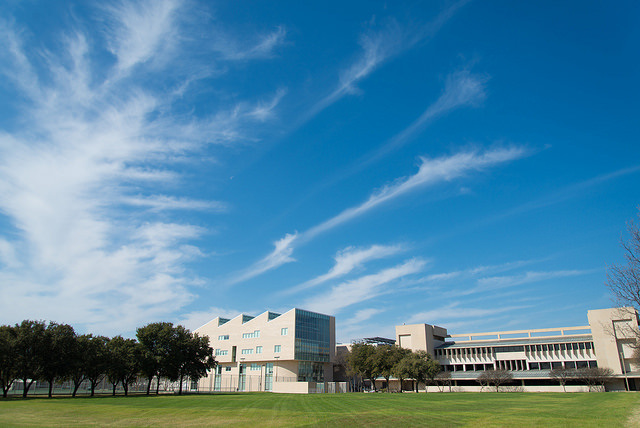 Located in the San Joaquin Valley city of Merced, the University of California, Merced (UCM) is the newest of the state University of California campuses. Founded in 2005, the school is a public research university that serves over 6.200 students, offering 21 degree programs through its three schools. The freshman retention rate at UCM is 84%, the graduation rate here is 56.7%, and the campus crime rate is 0. 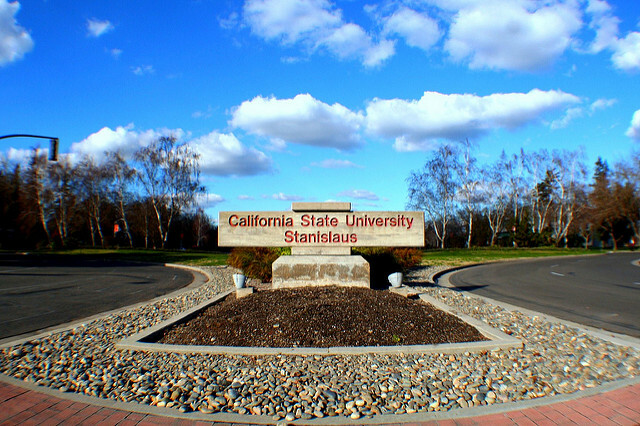 A campus in the California State University system, CSU Stanislaus is located in Turlock and serves over 9,200 students. The school offers 170 degree programs and is the only school in the CSU system to offer a program in cognitive studies. Stanislaus State’s freshman retention rate is 87%, its graduation rate is 52%, and the crime rate on campus here is 0. 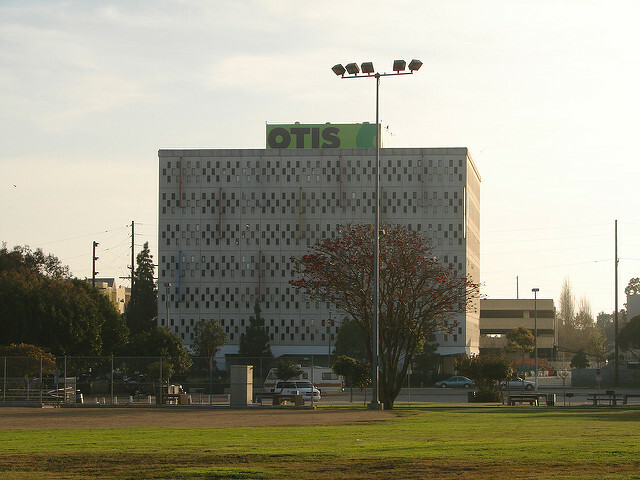 Located in the Westchester neighborhood of Los Angeles, Otis College of Art and Design is a private art and design school that serves just over 1,000 undergraduates. Founded in 1918, the school offers four-year degrees in such areas as graphic design, landscape design, illustration, and toy design. The freshman retention rate here is 81%, the graduation rate is 57.3%, and the campus crime rate is 0. CSU Long Beach is one of the campuses in the California State University system. 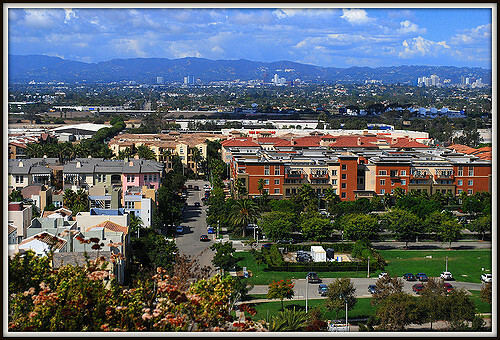 Located in the coastal city of Long Beach, the university serves 37,400 students and offers over 200 degree programs. The school is the largest publicly funded university in the western U.S. and was included on Princeton Review’s list of “Best Value Colleges.” The freshman retention rate at Long Beach State is 82%, the graduation rate is 64.9%, and the campus crime rate here is 0. 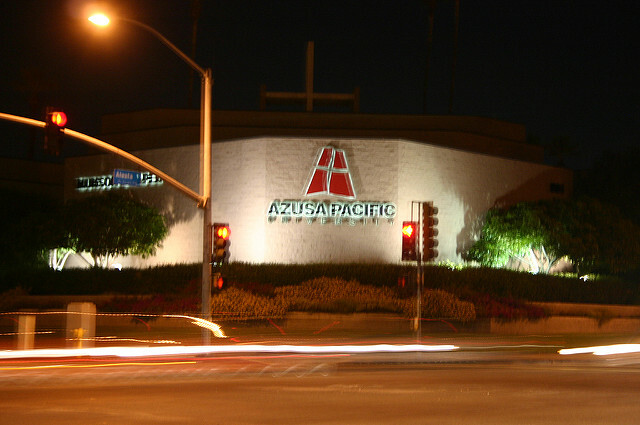 Located in the San Gabriel Valley in Azusa near Los Angeles, Azusa Pacific University is a private evangelical Christian university that serves over 10,700 students. Founded in 1899, the school offers a variety of degree programs as well as a seminary and Graduate School of Theology. The freshman retention rate at Azusa Pacific University is 82%, the graduation rate is 64.9%, and the crime rate on campus is just 0. 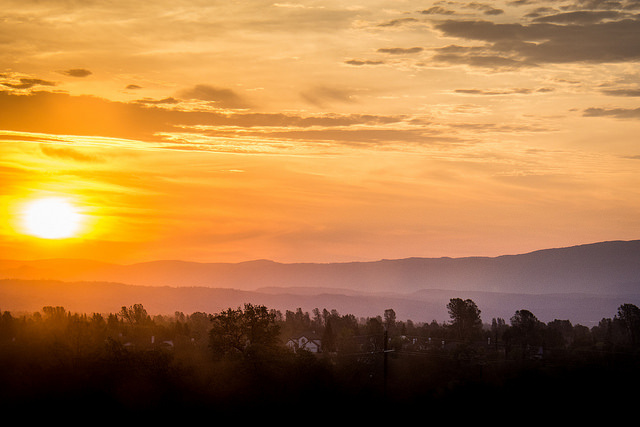 A private liberal arts college in Redding, Simpson University is affiliated with the Christian and Missionary Alliance. The school has a 92-acre campus, serves over 1,300 students, and offers over 300 degree programs. The freshman retention rate at Simpson is 81%, the graduation rate is 47.2%, and the campus crime rate here is 0. Located in the San Diego suburb of Santee, San Diego Christian College (SDCC) is a private non-denominational evangelical Christian college. The school was founded in 1970, serves over 1,000 enrolled students, and offers a variety of Bachelor of Arts and Science degrees. SDCC’s freshman retention rate is 68%, its graduation rate is 41.3%, and the rate of crime on campus is 0. 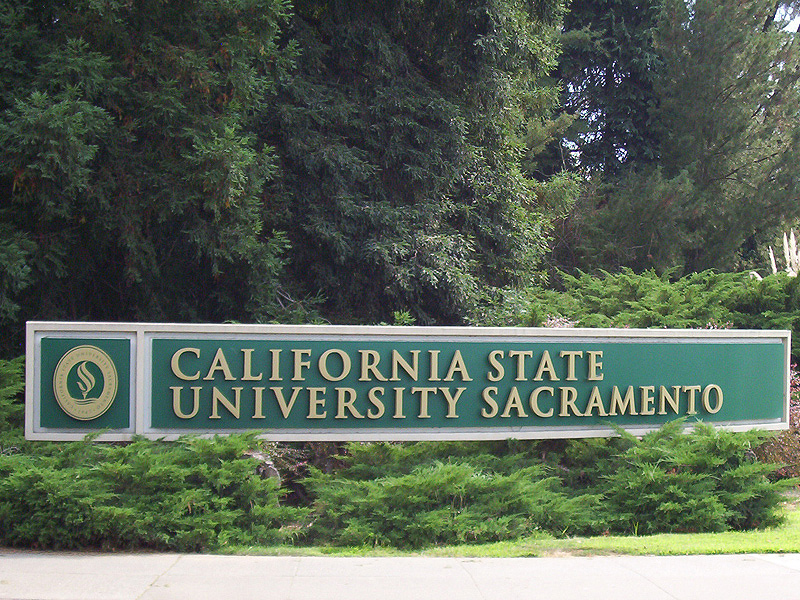 California State University, Sacramento (CSUS) is a public space-grant university in the CSU system in the state’s capital city. The school has over 30,200 enrolled students, offers more than 200 degree programs, and has a sprawling 300-acre campus. Sac State retains freshmen at the rate of 83%, has a 42.9% graduation rate, and its on campus crime rate is 0. Located in Los Angeles, California State University, Los Angeles is another CSU school that sits in the University Hills district, just five miles from downtown. Founded in 1947, the university has a 175-acre urban campus that serves over 27,600 students and offers more than 240 degree programs. The freshman retention rate here is 82%, the graduation rate is 35.7%, and the crime rate on campus is 0. 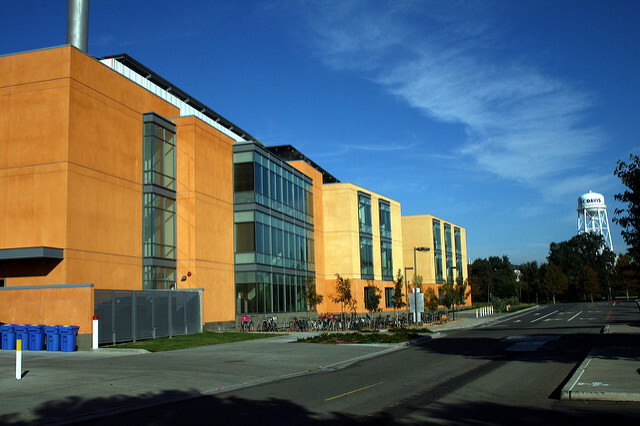 The University of California, Davis (UCD) is a public research university that is the third-largest in the UC system. 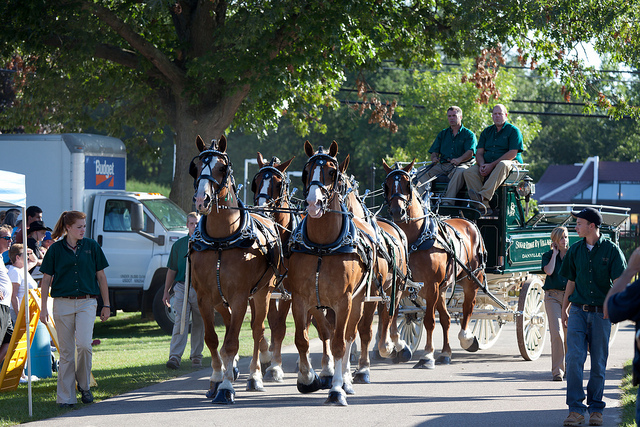 The 7,309-acre campus serves 36,100 students, and the school is known for its graduate and professional programs in medicine, law, education, business, and veterinary medicine. 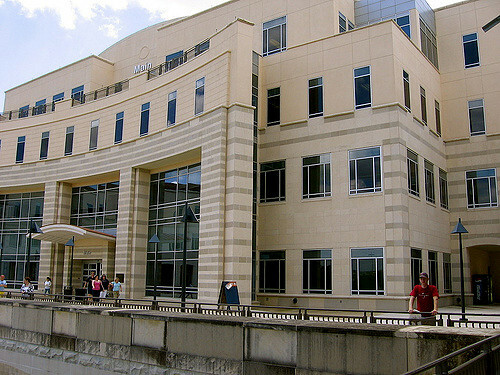 Its School of Veterinary Medicine is ranked number one in the country. The freshman retention rate at UCD is 93%, the graduation rate here is 81.3%, and the campus crime rate is 0. Located in San Dimas, Life Pacific College is a private college that is affiliated with the International Church of the Foursquare Gospel. The school has an enrollment of approximately 500 students, is a center for missionary studies, and offers both bachelor’s and master’s degrees in several areas. The freshman retention rate here is 63%, the graduation rate is 51.1%, and the crime rate on campus is 0. 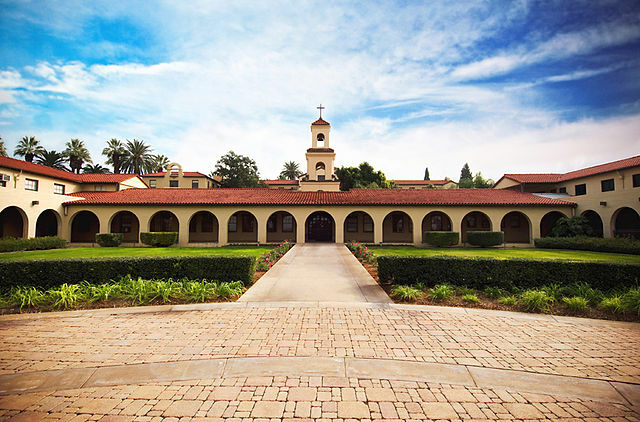 Santa Clara University is a private Jesuit university located in the Bay Area city of Santa Clara. Founded in 1851, the school is the oldest college in the state and serves over 8,700 students. 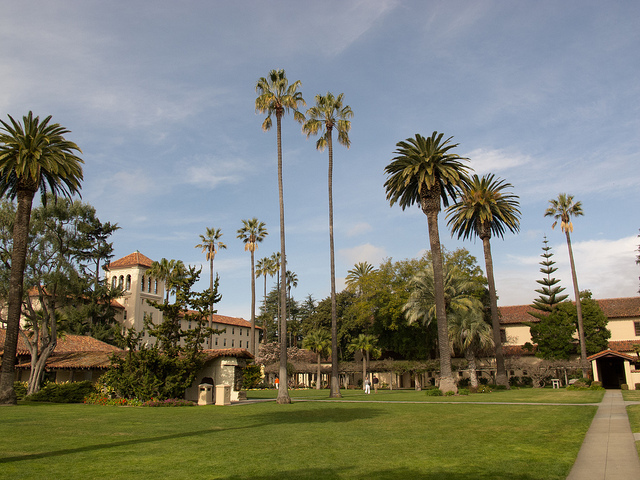 Santa Clara University offers many areas of study, including a law school, and has been named one of the most beautiful colleges in the country. The freshman retention rate here is 95%, the graduation rate is 84%, and the campus crime rate is 0. 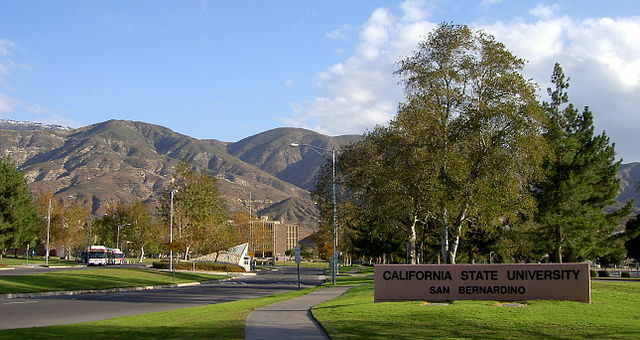 Located on a 441-acre campus in the Palm Desert area of San Bernardino, California State University, San Bernardino (CSUSB) is a public university in the CSU system. The school was named best college in the western region by The Princeton Review, has over 200 degree programs, and serves more than 20,000 enrolled students. The freshman retention rate at CSUSB is 89%, the graduation rate is 41.1%, and the crime rate on campus here is 0. 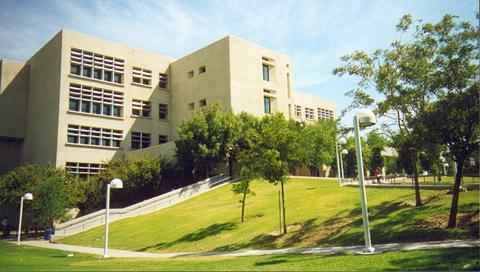 Another CSU school, California State University, Dominguez Hills (CSUDH) is located in Carson in Los Angeles’ South Bay area. Founded in 1960, the school doesn’t offer doctorate degrees but offers over 65 majors and serves more than 14,600 students. The freshman retention rate here is 79%, the graduation rate is 29.4%, and the rate of crime on campus is 0. 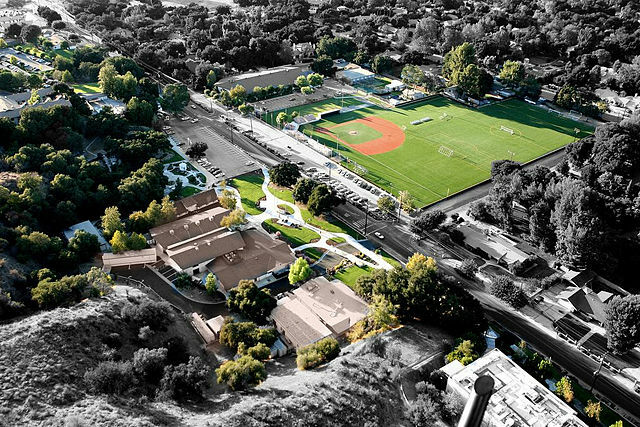 Located in San Rafael, Dominican University of California is a private college on an 80-acre campus at the base of San Pedro Mountain. Founded in 1890, the schools is one of the oldest colleges in the state, has an enrollment of 2,200 students, and an average class size of 16. The freshman retention rate at this school is 86%, the graduation rate is 53.9%, and the rate of crime on campus here is 0. Hope International University is a private non-denominational Christian university in the Orange County city of Fullerton. The school was founded in1928, have five colleges that offer both graduate and undergraduate programs, and serves more than 2,000 enrolled students. The freshman retention rate at Hope International University is 73%, the graduation rate is 45.1%, and the campus crime rate is 0. Located in the city of Orange, Chapman University is a private university that is affiliated with the Christian Church, aka Disciples of Christ. The school has eight colleges on its 75-acre campus and has a current enrollment of over 7,500 students. The freshman retention rate here is 91%, the graduation rate is 76.1%, and the rate of crime on campus is 0. 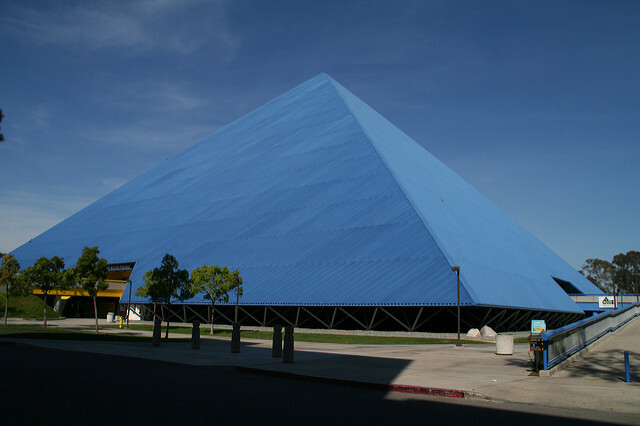 A public university in the CSU system, California State University, Bakersfield (CSUB) is located in the city of Bakersfield. Founded in 1965, the school offers more than 110 degree programs, has an enrollment of over 9,200 students, and has the only public petroleum geology program west of the Rockies. The freshman retention rate at CSUB is 74%, the graduation rate is 39.5%, and the rate of crime on campus is 0. 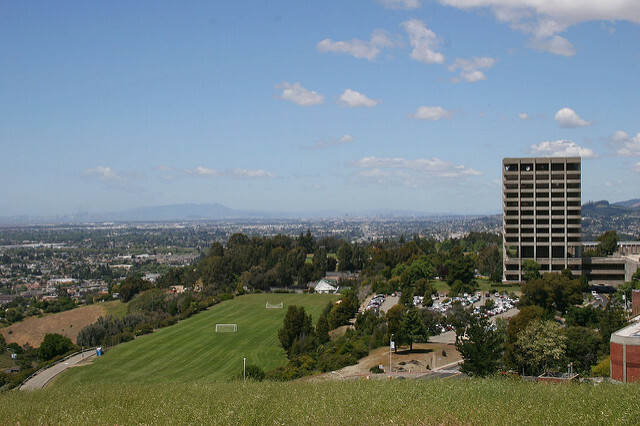 Located in the East Bay city of Hayward, California State University, East Bay (CSUEB) is a public university that is part of the CSU system. Founded in 1957, the university still operates on the quarter system but will convert to semesters by 2020 and serves over 15,500 enrolled students. The freshman retention rate at CSUEB is 78%, the graduation rate is 38.1%, and the on campus crime rate is 0. 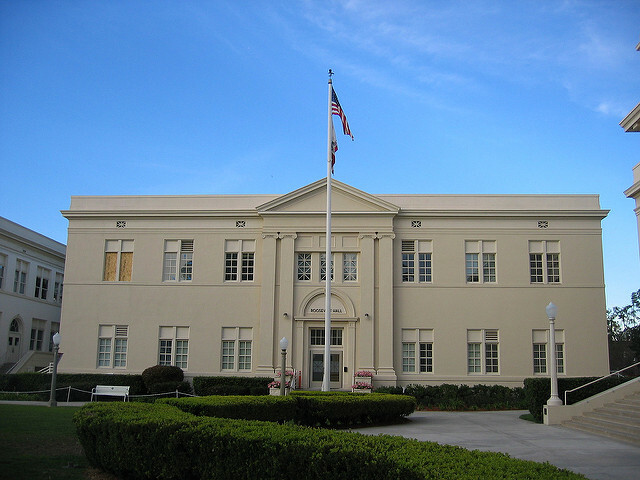 Loyola Marymount University (LMU) is a private university in both the Jesuit and Marymount traditions. 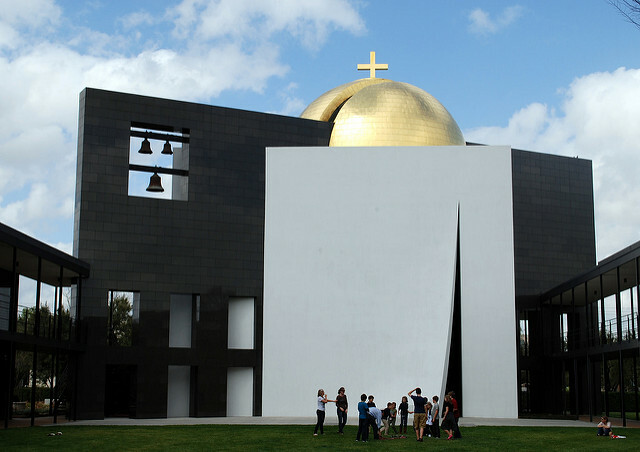 The school is located in the Westchester are of West Los Angeles, is considered one of the west coast’s largest Roman Catholic universities, and has an enrollment of over 9,000 students. The freshman retention rate at LMU is 91%, the rate of graduation here is 75.8%, and the on campus crime rate is 0. Located in Pomona, California State Polytechnic University, Pomona (Cal Poly) is a public polytechnic university that is a part of the CSU system. The school is the second-largest polytechnic university in the country, with over 23,700 enrolled students, and it offers more than 130 degree programs through its nine colleges. The freshman retention rate at Cal Poly is 90%, the graduation rate is 52.4%, and the crime rate on campus is 0. 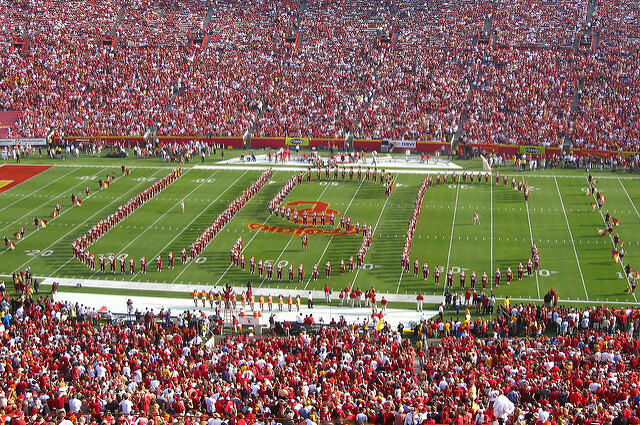 The University of Southern California (USC) is a private research university located in Los Angeles. Founded in 1880, the school’s is the state’s oldest private research university, has an endowment of over $4.7 billion, and serves more than 42,400 enrolled students. Notable alumni include Neil Armstrong, Clint Eastwood, and George Lucas. The freshman retention rate at USC is 96%, the school’s graduation rate is 91.2%, and the rate of crime on campus here is 0. 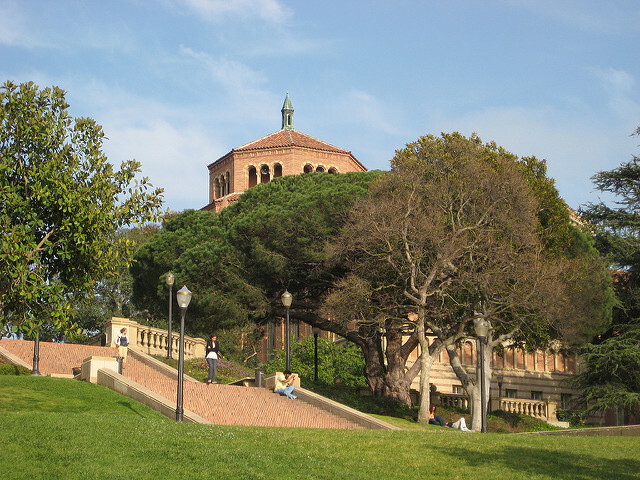 Located in the Westwood area of Los Angeles, the University of California, Los Angeles (UCLA) is a public research university that is part of the state’s UC system. The school offers over 300 degree programs, has more than 43,300 enrolled students, and has several professional schools including a medical school and a law school. UCLA retains freshman at a rate of 96%, has a graduation rate of 90.3%, and has an on-campus crime rate of 0. 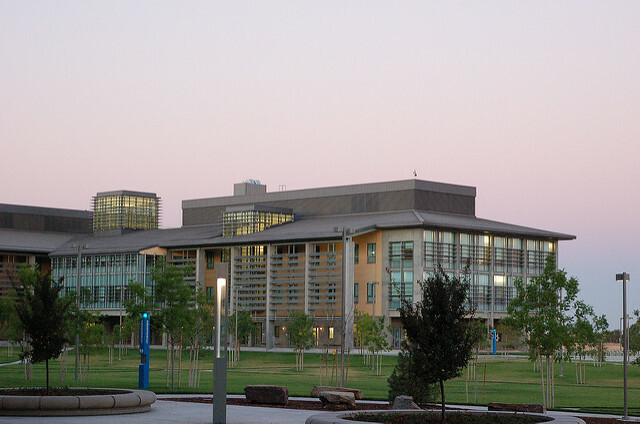 A public university in the CSU system, California State University, San Marcos (CSUSM) is located in north San Diego County. Founded in 1989, the school offers over 70 degree programs in its four colleges and has an enrollment of more than 12,700 students. The freshman retention rate here is 82%, the graduation rate is 47.9%, and the rate of crime on campus is 0. 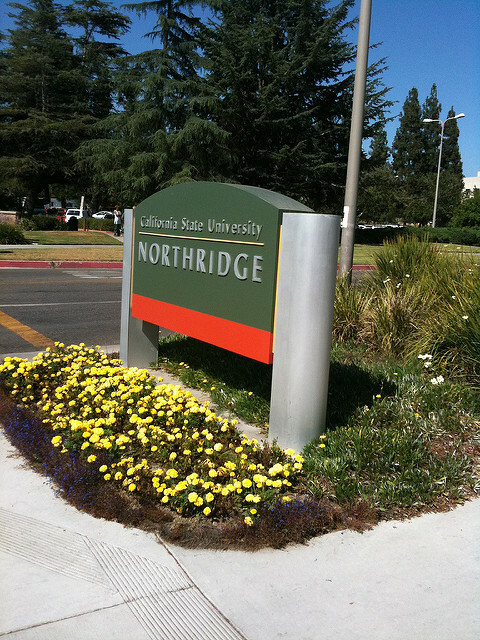 Located in the Northridge area of Los Angeles, California State University, Northridge (CSUN) is a public university and one of the largest universities in the CSU system. 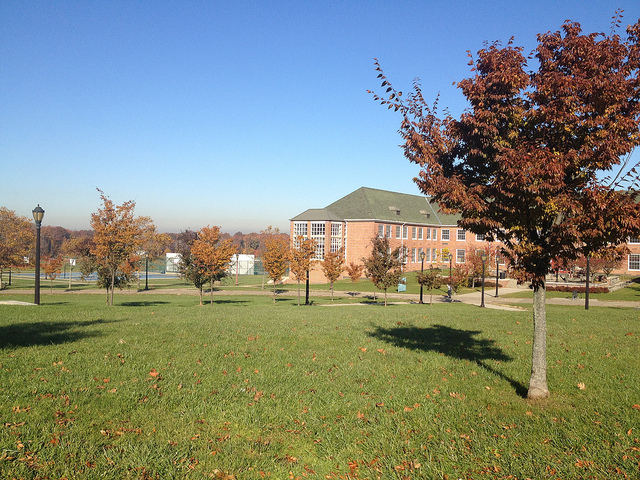 The school sits on a 353-acre campus, offers more 200 areas of study, and has a current enrollment of 41,500 students. The freshman retention rate at CSUN is 78%, the graduation rate here is 45.8%, and the campus crime rate is 0. 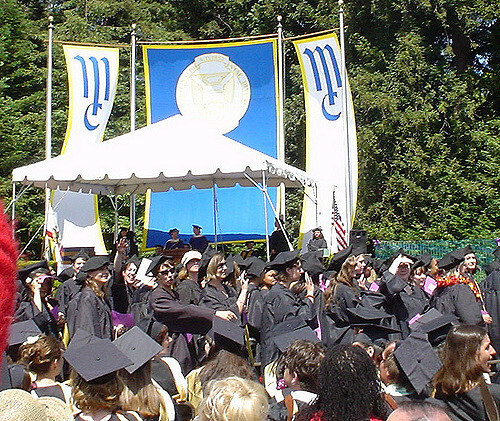 A private liberal arts college, Mills College is located in the Bay Area city of Oakland. 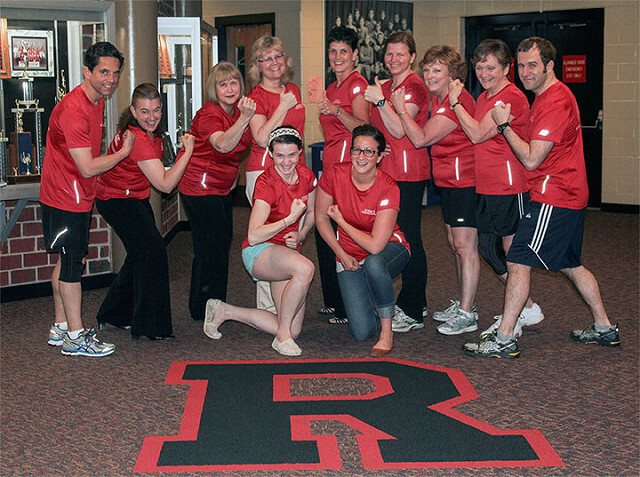 Founded in 1852, the school offers undergraduate programs for women only and graduate programs for both women and men. 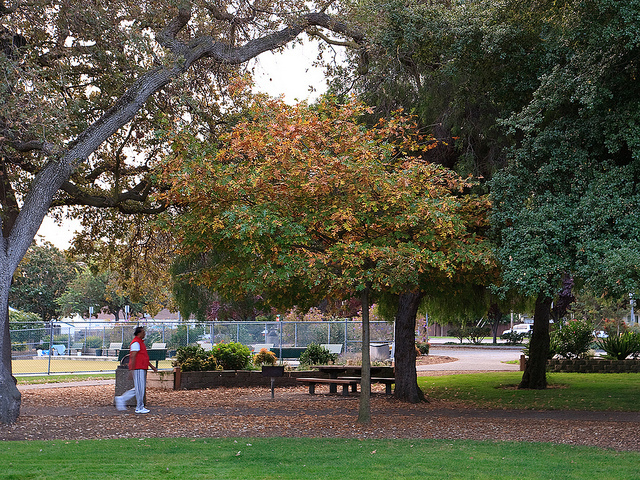 More than 65 degree programs are available, and Mills College has an enrollment of 1,500 students. The freshman retention rate here is 81%, the school’s graduation rate is 61.4%, and the rate of crime on campus is 0. 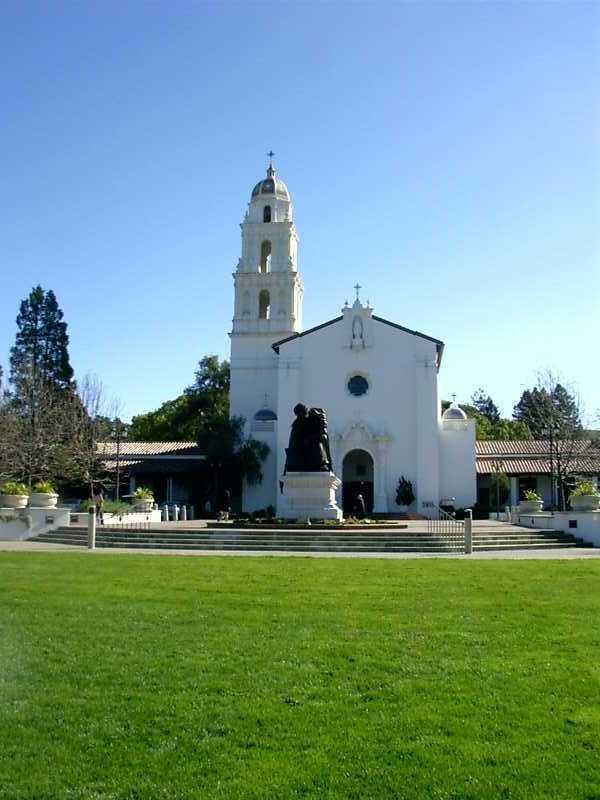 Located in the Bay Area city of Belmont, Notre Dame de Namur University is a private Catholic university that serves over 1,900 students. Founded in 1851, the school is the third-oldest college in the state and was the first college that granted baccalaureate degrees to women. The school now offers over 30 different areas of study. The freshman retention rate here is 77%, the graduation rate is 47.9%, and the campus crime rate is 0. 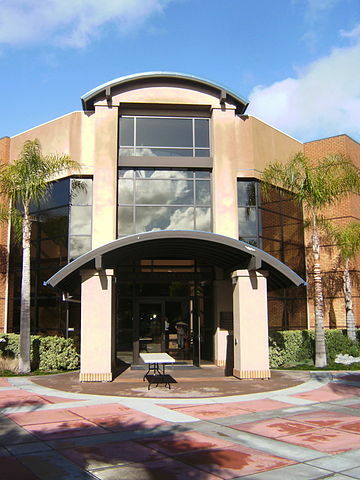 Located in the Sacramento suburb of Rocklin, William Jessup University is a private Christian liberal arts university that serves approximately 1,500 students. Founded in 1939, the school has a wide range of both graduate and undergraduate degree programs. The freshman retention rate here is 82%, the graduation rate is 56.1%, and the campus crime rate is 1. 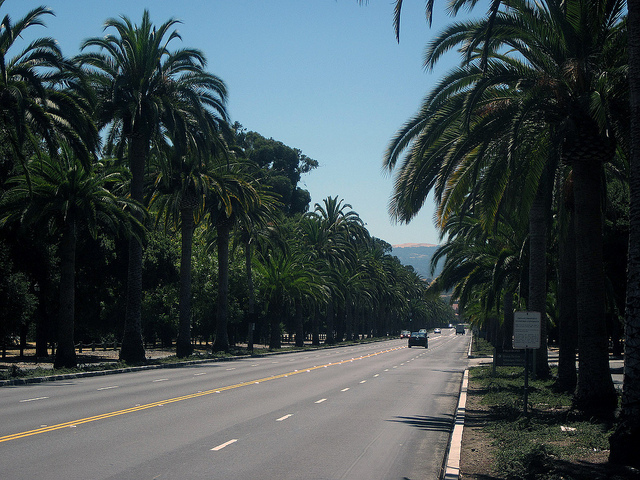 Also known as CalTech, the California Institute of Technology is a private university located in Pasadena. Originally founded as a vocational school in 1891, the influential scientists that have passed through its doors have evolved the institution, which now manages and operates NASA’s Jet Propulsion Laboratory. The school serves over 2,200 students with an endowment of over $2.1 billion. CalTech’s freshman retention rate is 97%, its graduation rate is 93.1%, and its campus crime rate is 1. 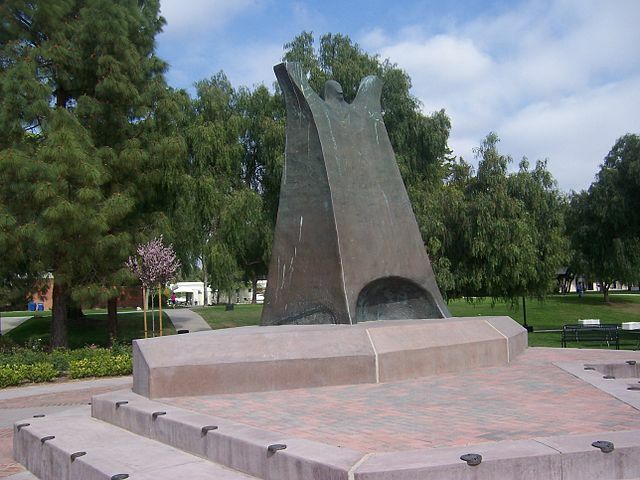 Located in the Central Valley city of Fresno, Fresno Pacific University (FPU) is a private Christian liberal arts university that is affiliated with the Mennonite Brethren Church. The school has over 3,600 enrolled students, offers more than 60 areas of study, and has a program that guarantees 4-year graduation for some students. The freshman retention rate at FPU is 83%, the graduation rate is 54.1%, and the rate of crime on campus here is 1. 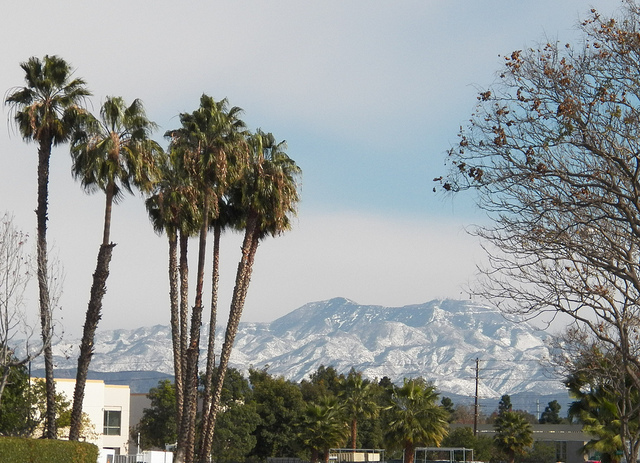 A private Seventh-day Adventist university located in Riverside, La Sierra University serves 2,400 students. The school is considered a liberal arts college, has four distinct schools, and has a 150-acre suburban campus. The freshman retention rate here is 76%, the graduation rate is 49.2%, and the rate of on-campus crime is 1. 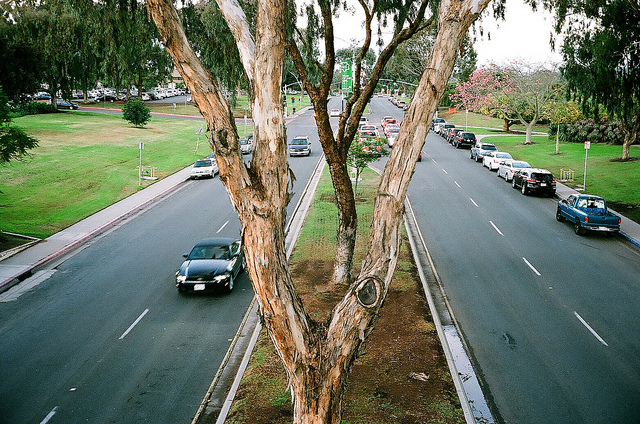 Located in the city of Claremont, Pomona College is a private liberal arts college that serves 1,600 students. The school offers 47 majors, has an endowment of over $2 billion, and is ranked among the top undergraduate schools in the country by U.S. News and World Report and Forbes. The freshman retention rate at Pomona College is 97%, the graduation rate here is 95.7%, and the rate of crime on campus is 3. Located in the Western region of the United States, Wyoming is home to over 580,000 residents. The state is the least populous and second least densely populated U.S. state, with its largest city and capital being Cheyenne. Nearly two-thirds of the state to the west is covered by the mountain ranges and foothills of the Rocky Mountains, and the eastern part of the state is known as the High Plains. Major industries in Wyoming include mineral production, agriculture, and tourism. A few of the state’s attractions are Yellowstone National Park, Grand Teton National Park, and Independence Rock. If you’re planning a move to the Equality State, here are the 5 safest cities in Wyoming. Related: Check out our Wyoming Public Records guide. Our list was compiled based on FBI violent crime stats and proprietary BackgroundChecks.org research data. Rates are normalized per 100,000 residents with the state average being 195 for violent crime and 1,965 for property crime. This is calculated by taking (# of crimes/population) * 100,000. 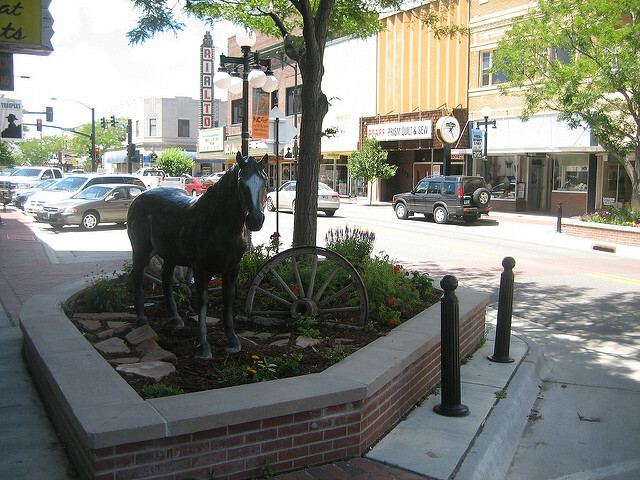 Located in Uinta County, the city of Evanston is home to 12,300 residents. Also the county seat, the community lies along the banks of the Bear River, covers 10.3 square miles, and is served by the Uinta County School District. Evanston is the safest place to live in Wyoming, with a violent crime rate of 40.1, and the chance of being involved in a property crime here just 2.3%. 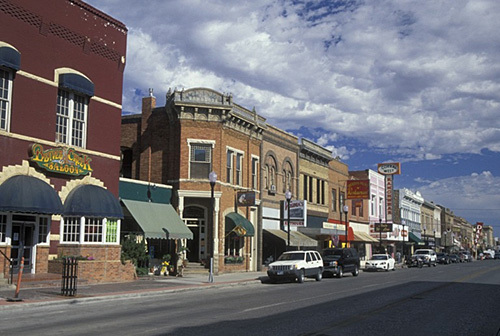 A city in Albany County, Laramie has a current population of 30,800 residents. 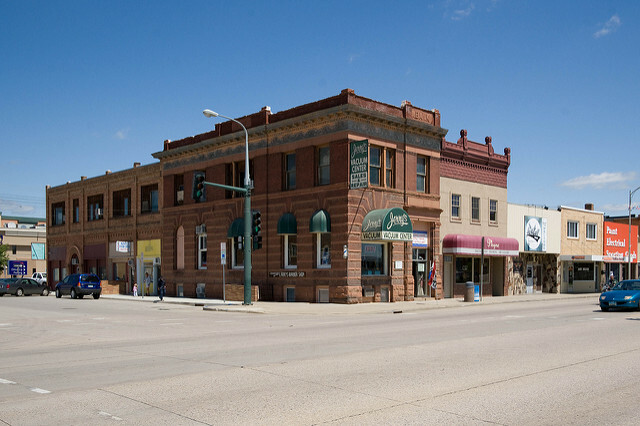 Also the county seat, the community is 50 miles west of Cheyenne, is home to the University of Wyoming, and has been included on Money’s list of best cities in which to retire. Another safe choice, the violent crime rate here is 107, and residents of Laramie have a 2.2% chance of being affected by property crime. 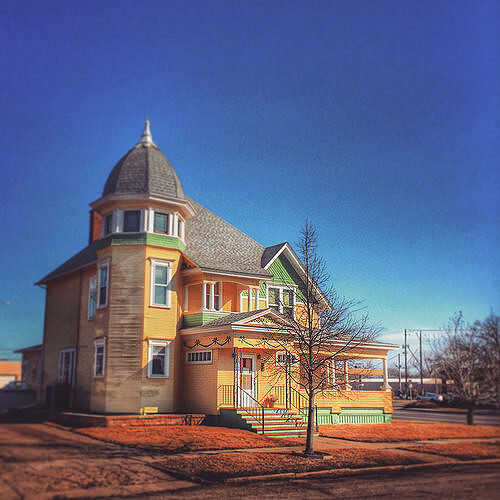 Located in Campbell County, the city of Gillette is home to 31,700 residents. Also the county seat, this fast-growing community is in the middle of the region that is booming with methane gas, oil, and coal production. 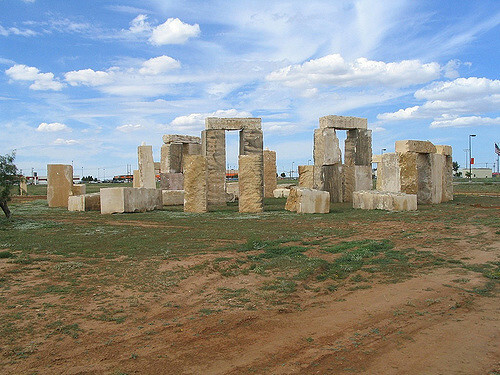 The community is also close Keyhole State Park and Devil’s Tower National Monument. The violent crime rate in Gillette is 127.4, and the chance of being involved in a property crime here is 4%. 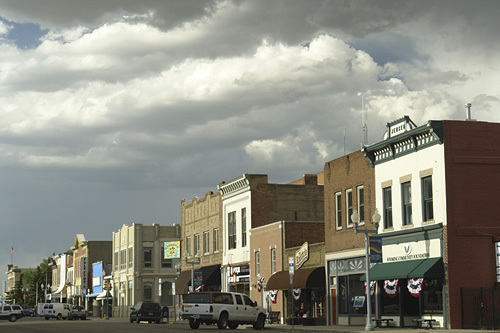 A city in Sheridan County, Sheridan is home to 29,100 residents. Also the county seat, the community was named after a Civil War Union General, is known for its well-performing schools, and is involved in such major industries as energy production, ranching, manufacturing, and logging. The violent crime rate here is 146.3, and residents of Sheridan have a 2.5% chance of being affected by property crime. Located in Natrona County, the city of Casper is home to 55,300 residents. Also the county seat, Casper is the second-largest city in the state, and the community lies along the North Platte River at the base of Casper Mountain. It is also known as “The Oil City” for its history in oil production and its proximity to the Salt Creek Oil Field. The violent crime rate in Casper is 151.4, and the chance of being involved in a property crime here is 3.4%. Located in the New England region of the United States, Vermont is home to over 620,000 residents. The state borders Canada to the north, and its Lake Champlain forms nearly half of its western border. Vermont is the second least populous state, with Burlington as its largest city and Montpelier serving as the state capital. 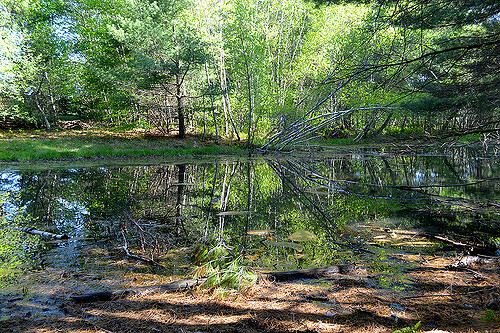 The state’s landscape ranges from the fertile Champlain Valley to the Green Mountains and the banks of the Connecticut River. 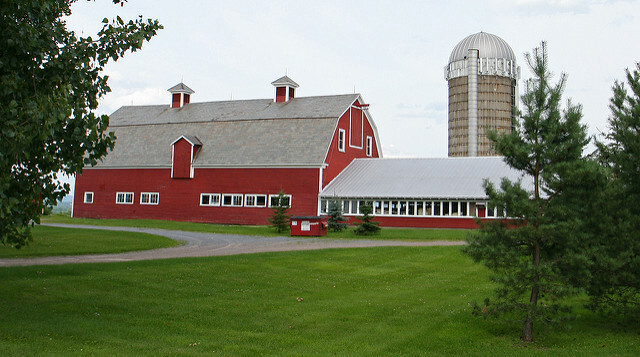 Major industries in Vermont include tourism, healthcare, insurance, and agriculture, with the state being the leading producer of maple syrup. If you’d like to make The Green Mountain State your next home, here are the 5 safest cities in Vermont. Related: Check out our Vermont Public Records guide. Our list was compiled based on FBI violent crime stats and proprietary BackgroundChecks.org research data. Rates are normalized per 100,000 residents with the state average being 100 for violent crime and 1,524 for property crime. This is calculated by taking (# of crimes/population) * 100,000. 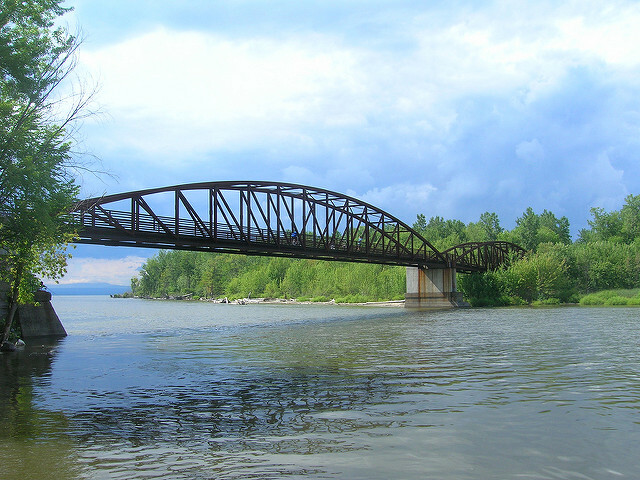 Located in Chittenden County in the town of Essex, the village of Essex Junction is home to 9,200 residents. 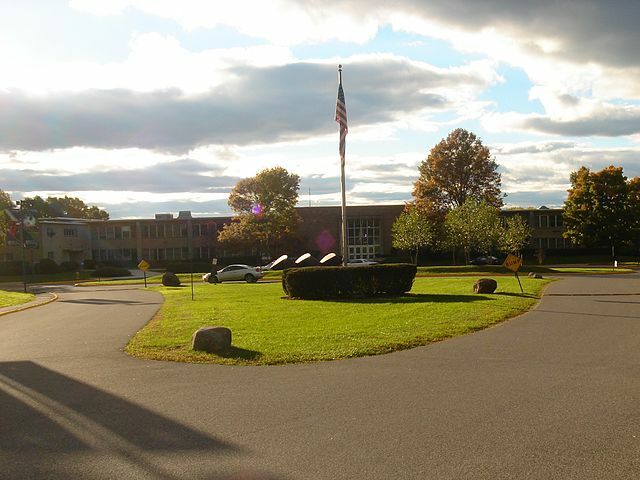 The community was incorporated in 1892, covers 4.7 square miles, and is the site of Global Foundries, a large semiconductor plant. Essex Junction is the safest place to live in Vermont, with a violent crime rate of 55.8, and the chance of being involved in a property crime here just 2.4%. Another town in Chittenden County, Milton has a current population of 10,300 residents. 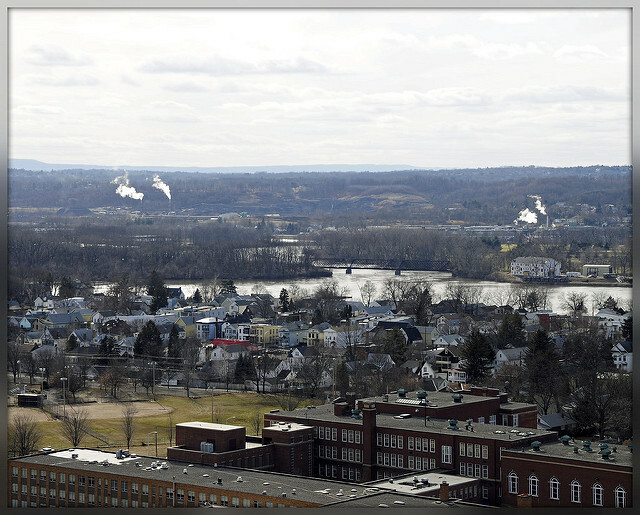 The community covers 60.9 square miles, was named after English poet John Milton, and is home to several large businesses including Husky Injection Molding Systems and Gardener’s Supply. Another safe choice, the violent crime rate here is 105.7, and residents of Milton have a 1.9% chance of being affected by property crime. Also located in Chittenden County, the city of South Burlington is home to 18,700 residents. The state’s second largest city, the community is considered a suburb of Burlington, borders Lake Champlain, and is the site of both Burlington International Airport and the headquarters of Ben & Jerry’s. The violent crime rate in South Burlington is 122.2, and the chance of being involved in a property crime here is 4.2%. Another Chittenden County town, Colchester is home to 17,000 residents. Also a Burlington suburb, the community lies along the shores of Lake Champlain and the New York state line and is the site of both the Vermont National Guard and Saint Michael’s College, a private Catholic college. The violent crime rate here is 122.4, and residents of Colchester have a 3.5% chance of being affected by property crime. 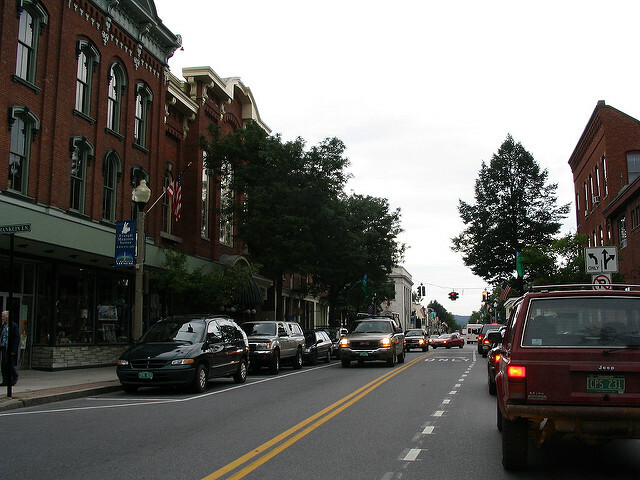 Located in Bennington County, the town of Bennington is home to 15,400 residents. The community is the largest town in southern Vermont, is the site of the Bennington Battle Monument, and is known for its quality textiles, pottery, and iron. The violent crime rate in Bennington is 172.1, and the chance of being involved in a property crime here is 3.6%. 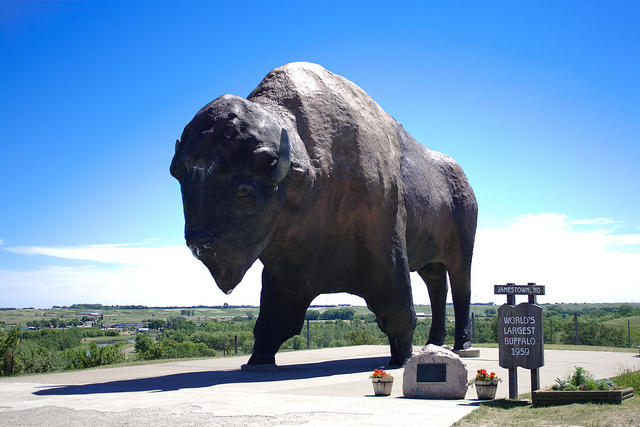 Located in the Upper Midwestern region of the United States, North Dakota is home to over 750,000 residents. The state borders Canada to the north and is both the 4th least populous and 4th least densely populated U.S. state. 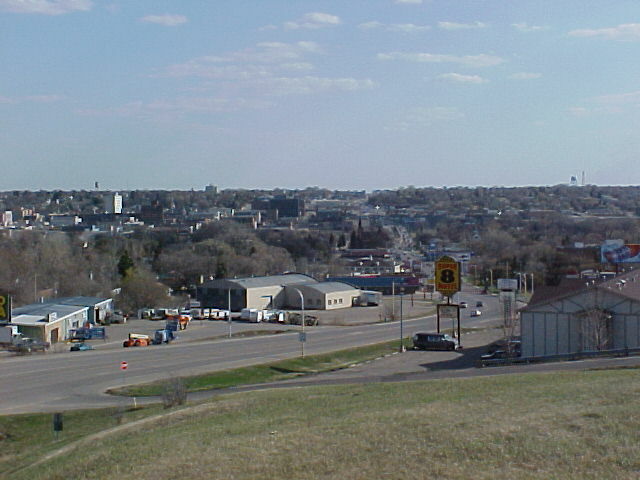 North Dakota’s capital is Bismarck, and its largest city is Fargo. 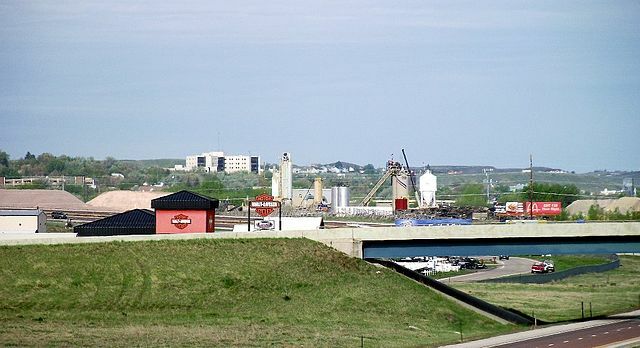 While many areas suffered during the Great Recession, North Dakota experienced a boom as natural resources were discovered in its Bakken formation, located in the northwestern region of the state. Other major industries here include agriculture, health care, and tourism. If you’d like to live in the Peace Garden State, here are the 5 safest cities in North Dakota. Related: Check out our North Dakota Public Records guide. Our list was compiled based on FBI violent crime stats and proprietary BackgroundChecks.org research data. Rates are normalized per 100,000 residents with the state average being 265 for violent crime and 2,110 for property crime. This is calculated by taking (# of crimes/population) * 100,000. Located in Stutsman County, the city of Jamestown is home to 15,400 residents. Also the county seat, the community sits along the banks of the James River, hosts several large companies that include Cavendish Farms and UTC Aerospace Systems, and is known for having the world’s largest buffalo statue. Jamestown is the safest place to live in North Dakota, with a violent crime rate of 203.1, and the chance of being involved in a property crime here just 2.6%. A city in Stark County, Dickinson is home to 22,300 residents. 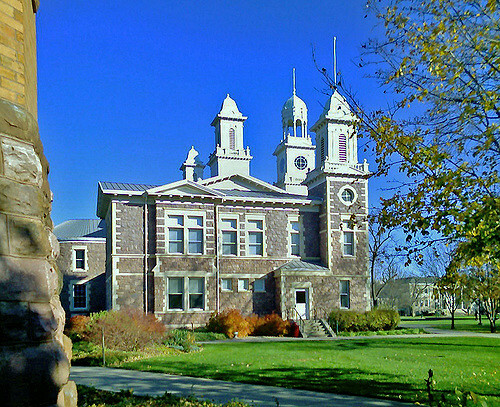 Also the county seat, this fast-growing community encompasses 10 square miles and is the site of Dickinson State University, a four-year public university. The violent crime rate here is 216.7, and residents of Dickinson have a 2% chance of being affected by property crime. Located in Cass County, the city of West Fargo is home to 31,700 residents. 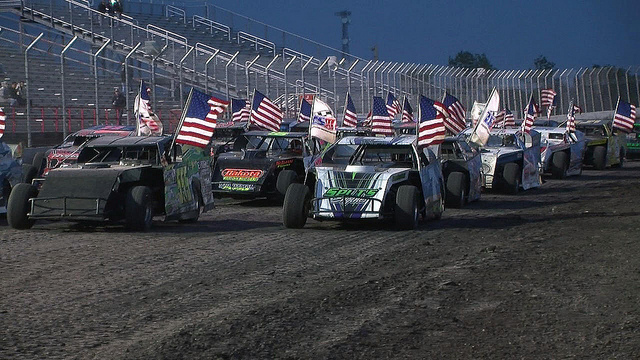 Another fast-growing city, the community is a suburb of Fargo, maintains 30 parks including the Red River Valley Speedway, and is the site of several large technology companies. 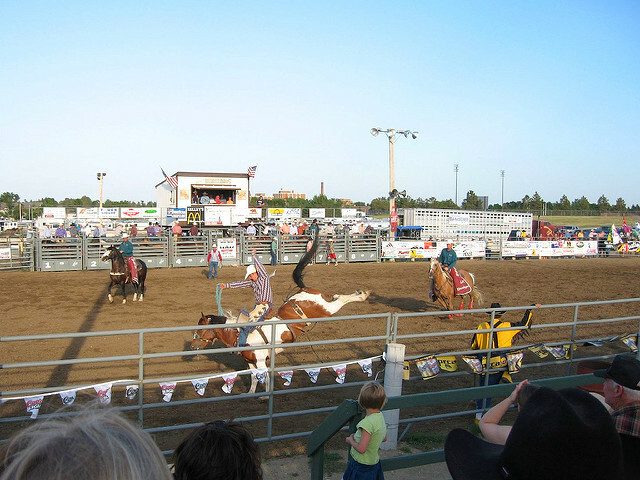 Major annual events here include Big Iron and Bonanzaville Pioneer Days. The violent crime rate in West Fargo is 230.5, and the chance of being involved in a property crime here is just 1.7%. 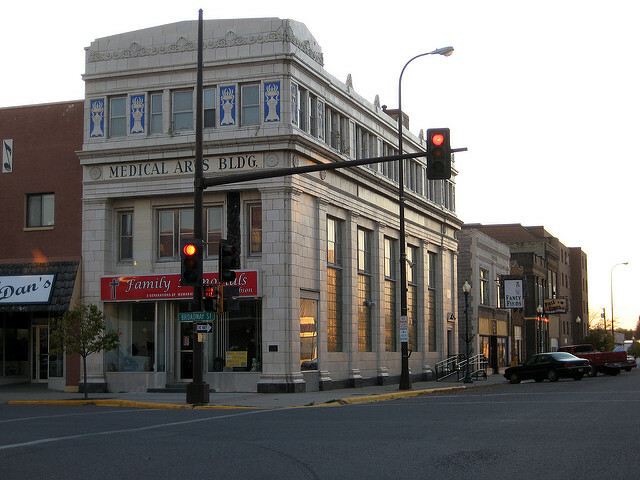 A city in Ward County, Minot has a current population of 40,800 residents. Also the county seat, the community is the fourth largest in the state, is bisected by the Souris River, and is home to Minot State University. The city is best known for its proximity to a nearby Air Force Base that bears its name, and that is a major area employer. The violent crime rate here is 232.4, and residents of Minot have a 1.7% chance of being affected by property crime. Located in the Midwestern region of the United States, South Dakota is home to over 850,000 residents. The fifth least densely populated U.S. state, its largest city is Sioux Falls, and its capital is Pierre. South Dakota’s landscape is characterized by grasslands and the Black Hills Mountains in the southwest. The state’s economy is driven by agriculture, ranching, defense spending, and tourism. Popular tourist spots include Mount Rushmore and Badlands National Park. If you’d like to settle in The Mount Rushmore State, here are the 5 safest cities in South Dakota. Related: Check out our South Dakota Public Records guide. Our list was compiled based on FBI violent crime stats and proprietary BackgroundChecks.org research data. Rates are normalized per 100,000 residents with the state average being 327 for violent crime and 1,864 for property crime. This is calculated by taking (# of crimes/population) * 100,000. 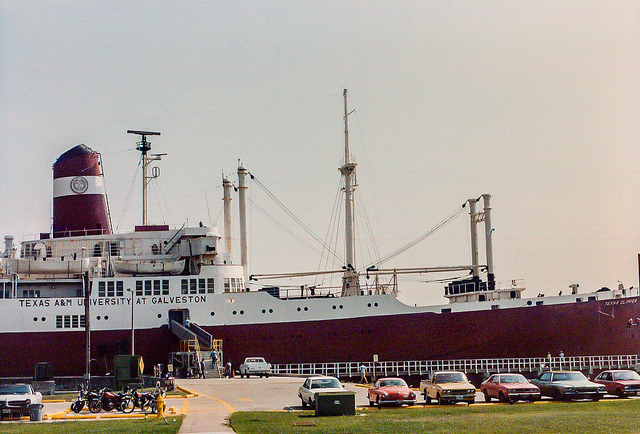 Located in Brookings County, the city of Brookings has a current population of 22,000 residents. 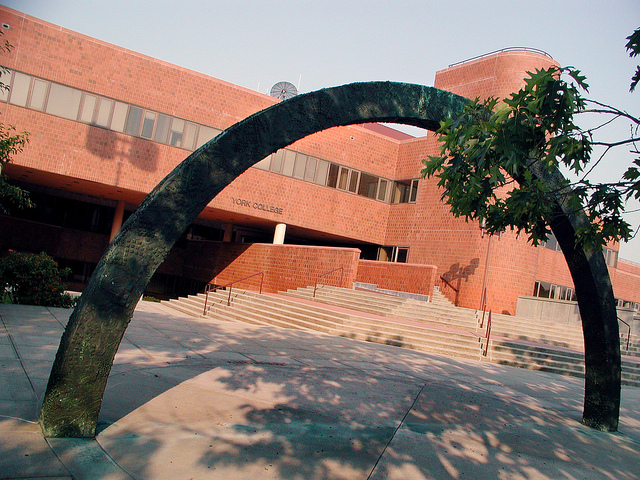 Also the county seat, the community is home to South Dakota State University as well as several art museums and large business concerns. Brookings is the safest place to live in South Dakota, with a violent crime rate of 35.6, and the chance of being involved in a property crime here just 1.7%. A city in Lawrence County, Spearfish is home to 10,400 residents. 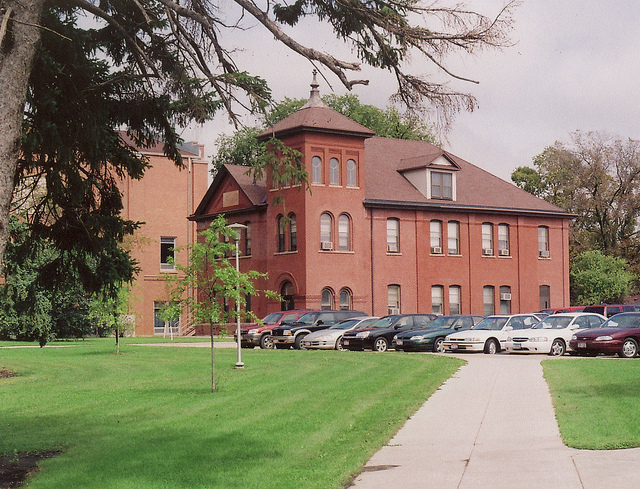 The community was founded in 1876, sits at the base of the Black Hills, and is the site of Black Hills State University, a four-year public university. Another safe choice, the violent crime rate here is 168.2, and residents of Spearfish have a 3.5% chance of being affected by property crime. Located in Brown County, the city of Aberdeen is home to 26,000 residents. 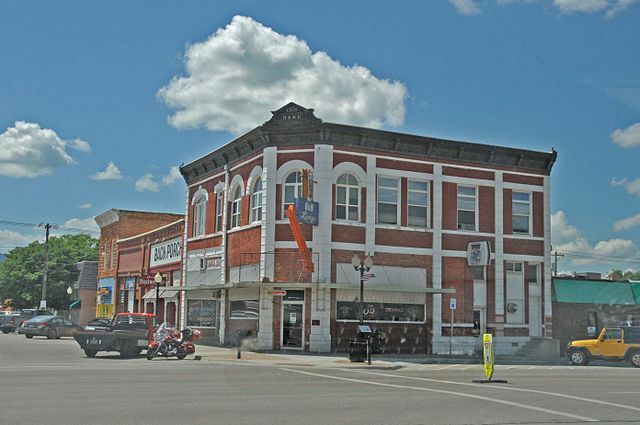 Also the county seat, the community lies 125 miles north of Pierre, hosts several large businesses, and is the site of both Northern State University and Presentation College. The violent crime rate in Aberdeen is 259.5, and the chance of being involved in a property crime here is 1.9%. A city in Clay County, Vermillion has a current population of 10,500 residents. Also the county seat, the community lies on top of a bluff near the Missouri River and is home to the University of South Dakota, which houses the state’s only medical and law school. The violent crime rate here is 277.1, and residents of Vermillion have a 2.2% chance of being affected by property crime. Located in Codington County, the city of Watertown is home to 21,400 residents. 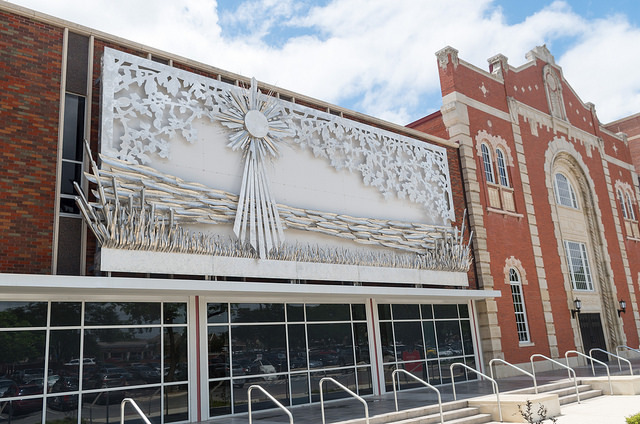 Also the county seat, the community sits on the banks of the Big Sioux River, is close to two large lakes, and is the site of both the Redlin Art Center and the Bramble Park Zoo. The violent crime rate in Watertown is 283.1, and the chance of being involved in a property crime here is 2.3%.